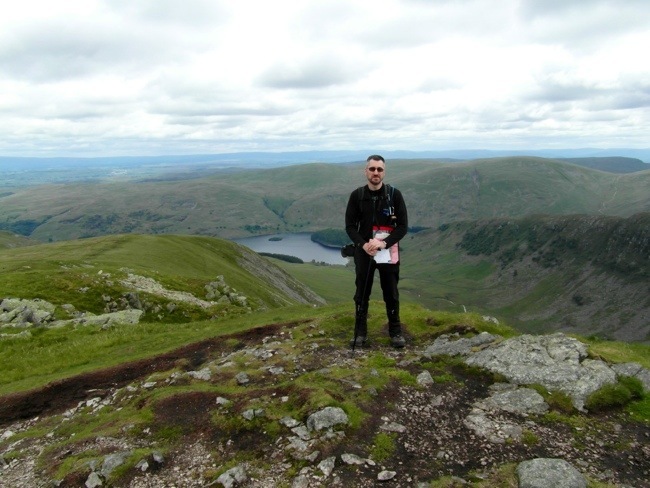 I am a Roman Catholic priest, with a great love for walking, especially among the fells of the Lake District. 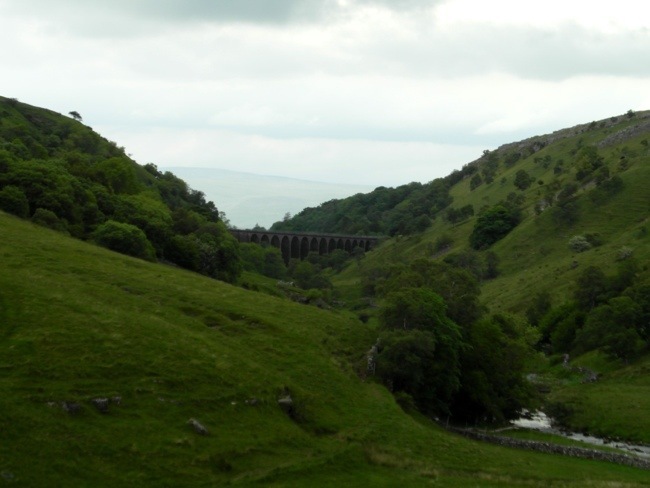 I have decided to undertake the Coast to Coast Walk and this site will feature my blog all about my adventures along the way. 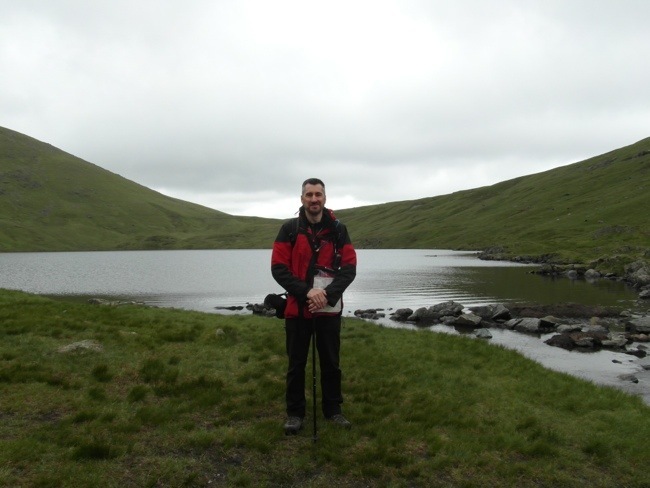 I have had a passion for walking since my early teens when I first visited the Lake District with my church youth group. 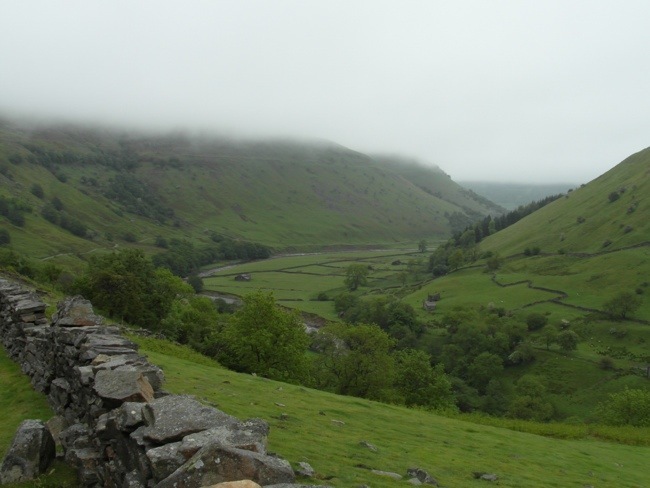 We stayed in a Youth Centre at the foot of the Kirkstone Pass, in the beautiful valley of Patterdale, near the tiny lake of Brotherswater. 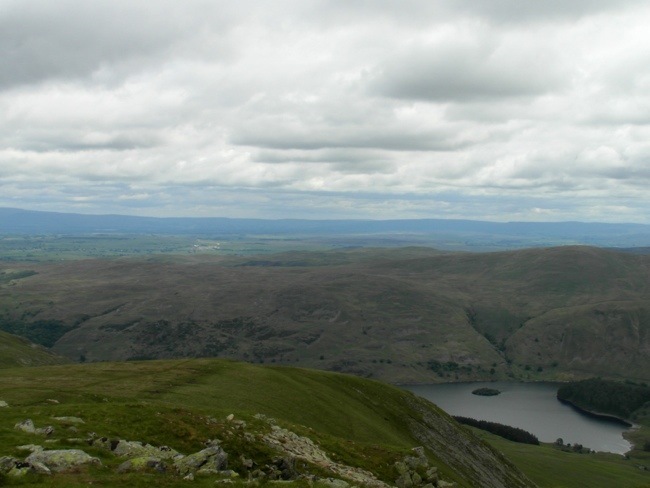 It was then that I fell in love with the Lakeland fells, and since then I have tried to visit the Lakes as often as possible, walking among the beautiful fells of this most special part of England. The pictorial guides of Alfred Wainwright became my ‘bible’ of the fells and I read every book virtually from cover to cover. 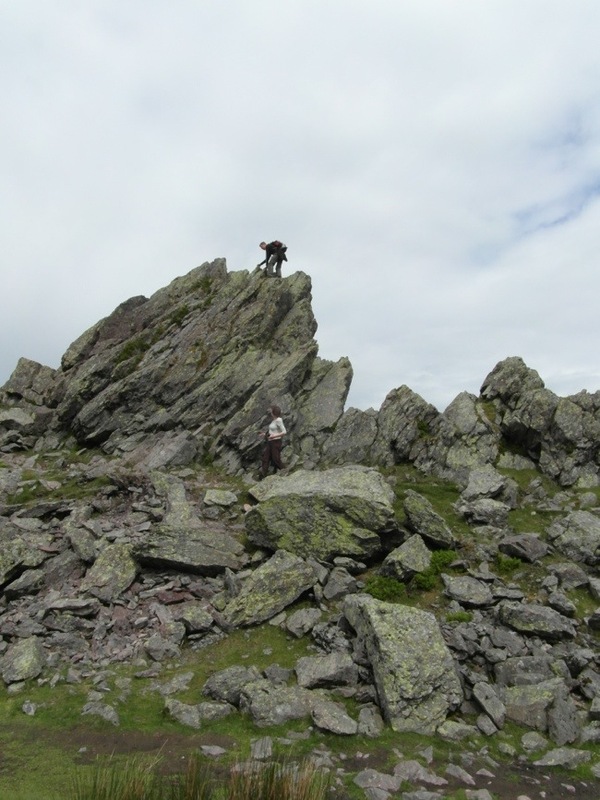 I have climbed many of the fells he describes, but still have many more to do (more about that later maybe). 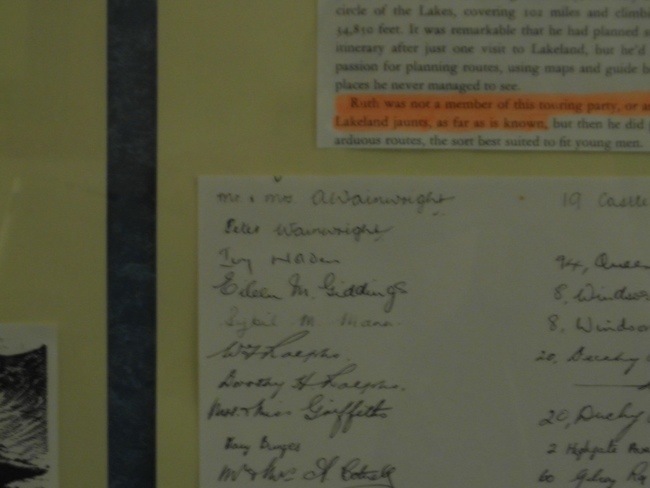 It wasn’t long before I discovered Wainwright’s volume on the Coast to Coast Walk, which was his own creation. I almost had the opportunity to walk it in my early twenties, but sadly missed out on the trip because of work commitments. 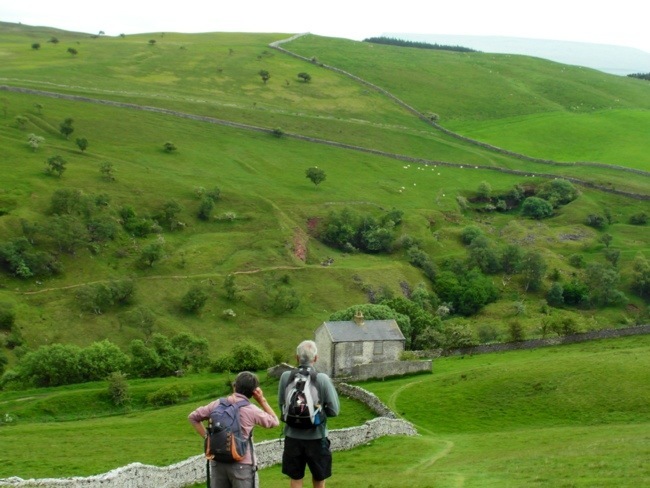 My friends from the church youth group set out on the walk, but only made it as far as the half way point at Keld, where injuries forced them to abandon the attempt. 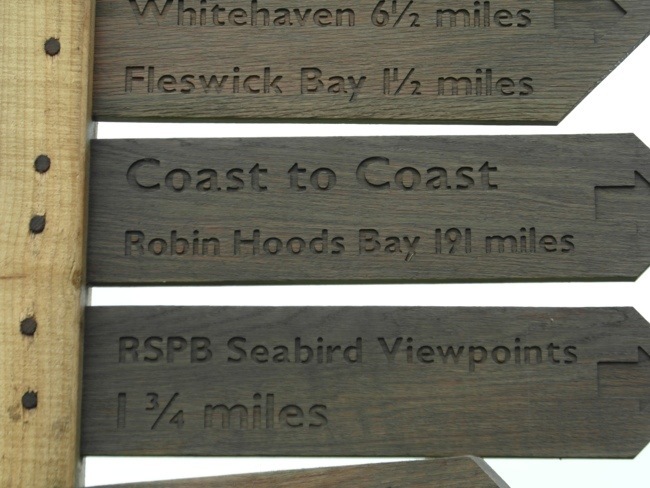 Since then I have thought about doing the Coast to Coast Walk many times, but never quite got round to it. Finally, late last year I decided that 2012 was to be the year. This was partly because the church where which I now serve as a Roman Catholic priest, Our Lady of the Holy Souls, Kensal New Town, is currently undergoing a major interior restoration. 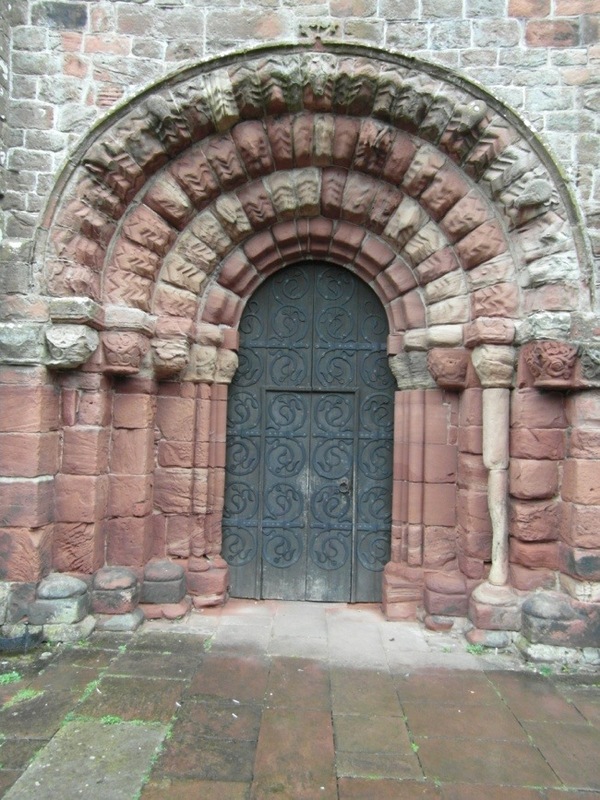 So, I decided to combine my long held desire to do this walk with the opportunity to raise some funds via sponsorship, for the church restoration? And so here we are. The principle purpose of this blog is to let my parishioners follow my progress along the route day by day. 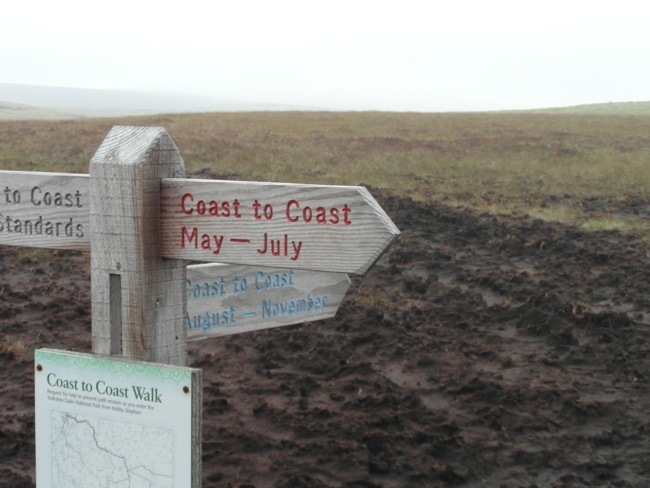 I apologise to any other keen walkers who read this blog if at times it is somewhat basic, but I am principally writing for an audience who largely know nothing of the Coast to Coast walk. Nevertheless, I hope that all readers will find something interesting and entertaining as you follow my footsteps along the way. Before beginning to relate the events of today, I want to tell you about my evening in St Bees. I have always known that the C2C is a popular walk, but I was taken aback by the sheer number of people in St Bees last night getting ready to start the walk. All the pubs were really busy. It was hard to find a table for dinner. Eventually, I ended up sitting with a 71 year old man from Nijmegen in Holland. His name was Mattieu (Matthew) and he had brought his car over from Holland via Hull. He is doing the C2C by parking his car at the starting point each day, and walking to the days destination and then hitchhiking or getting taxi back to the place where he left the car and staying there the night, hence when I met him at St Bees, he had already done the Day One walk and returned by taxi to St Bees. He had found it hard going, especially because the weather was bad. Matthew told me that he had walked many long distance walks across Europe since he retired. He had been an Officer in the Dutch air force and then a lawyer and retired in his 60s. He asked what I did for a living, and was very interested when I told him I was a Catholic priest, because he too was a Catholic and had been educated by the Dominicans. We had a long discussion about the Church. People have been surprised that I am doing the C2C on my own, but one of the joys of it, is meeting people like Matthew. Would we have spoken if I was travelling in a group? Probably not. What a lovely gentleman he was. I hope our paths will cross again in the coming days. 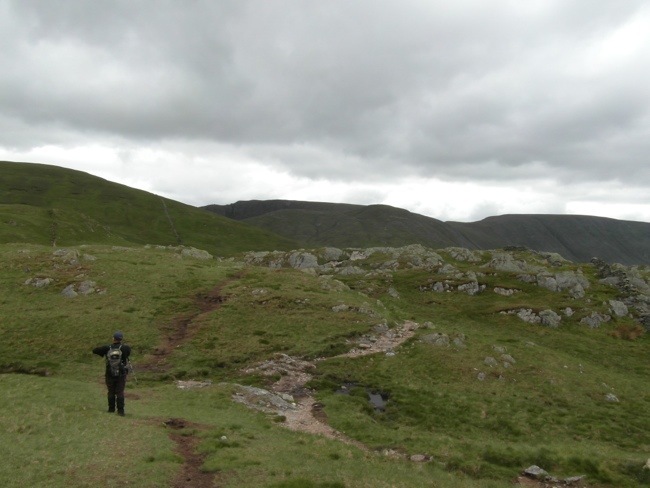 I wonder to myself, will I still be walking the fells when I am 71? I hope so. 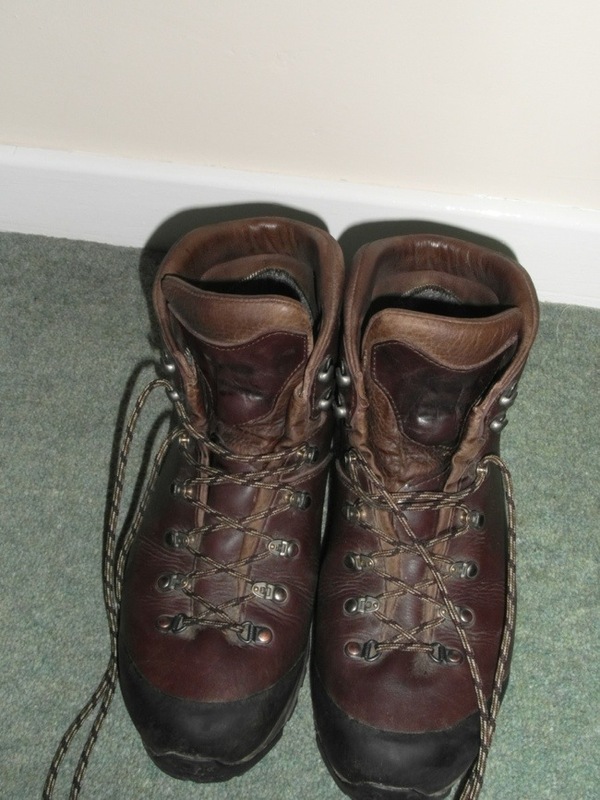 Below – my boots. Will they look this pristine after 191 miles?. 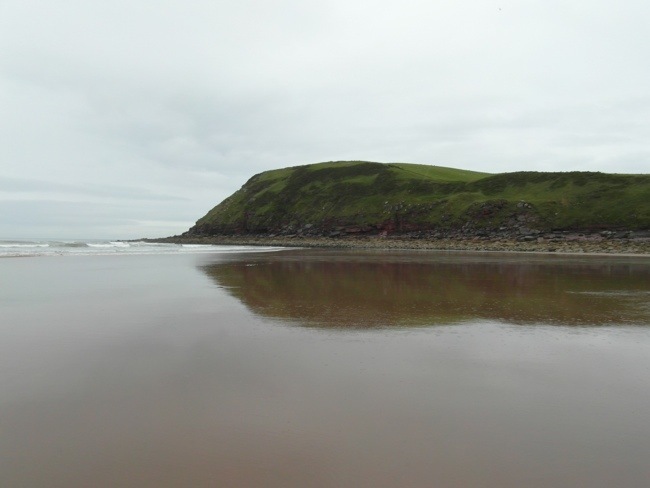 I didn’t have a great night’s sleep, partly because of the excitement, partly because the bed was very soft, and partly because St Bees turned out to be a rather noisy place, especially when the pubs turfed out. I had breakfast at 7am and because it was busy didn’t get on the road until about 8.30. All the other Coast to Coasters in the B&B set off about the same time as me. One American guy on his own asked if he might walk with me. We set off for the beach. His name was Pete, and he had origianlly planned to do the walk with his brother and a friend, but his brother had a minor stroke and his friend’s son had decided to get married. Pete told me he was from Connecticut, but currently living in Hawaii. There are 2 important traditions attached to beginning the C2C. Firstly to dip the toe of your boot into the Irish Sea, and secondly to pick up a pebble from the beach and carry it all the way to journey’s end, before depositing it into the North Sea. Pete and I made our way out to the sea. The tide was out so it was a fair walk out across the sands. I nearly got a bootful of Irish Sea, as a big wave came in. That would have been an unfortunate start! Pete kindly took my photo, and I his. We then walked back to the beach, picked up our pebbles and stopped at the famous start sign for the C2C. More photos. Sadly, in this one I have my eyes closed. Typical! At this point Pete realised that he still had his door key from the B&B, so be had to go back. As we had only met half an hour before, I didn’t feel too bad about going on without him! Perhaps our paths will cross again later in the walk. 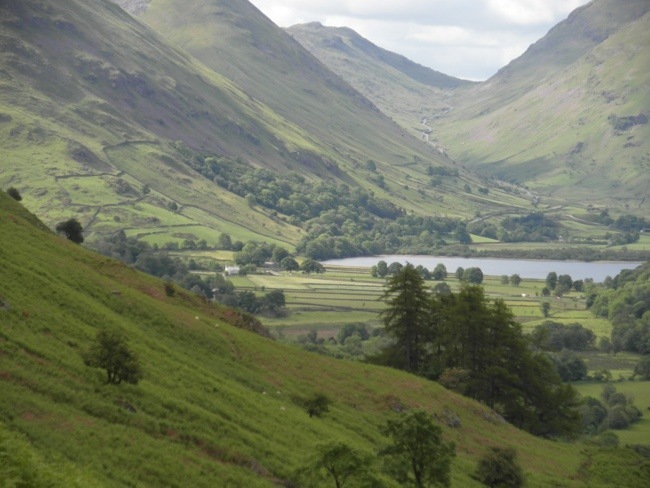 You might think that a Coast to Coast walk would begin by heading in the direction of the final destination, but Alfred Wainwright who conceived and pioneered this walk in the early 70s, always had a eye for the most scenic route. 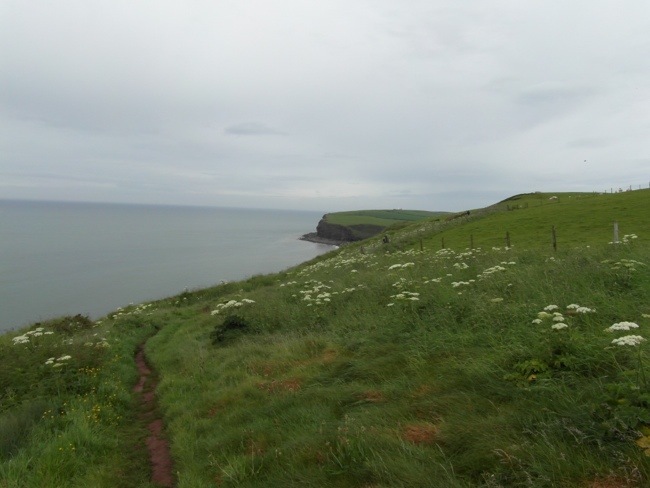 And so it is that the C2C begins by heading north along the magnifcent cliff tops of St Bees Head. 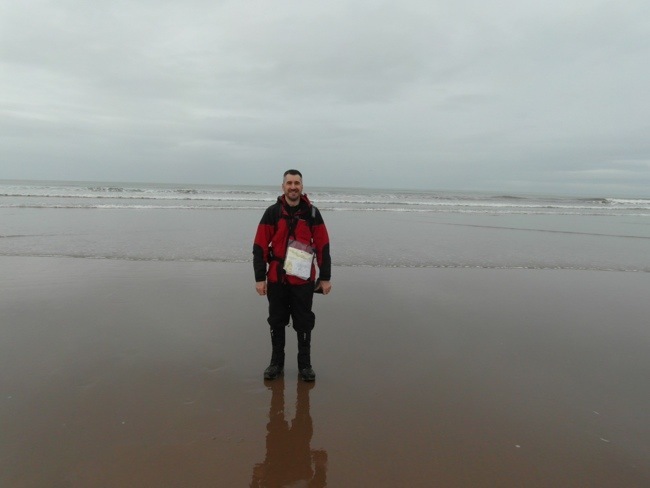 Below – a fellow C2Cer returning from “dipping their toes”. It was mild and calm, with a ligt breeze (in stark contrast to the gales in the south). Gradually all the C2Cers got spread out along the route as everyone settled into their own pace. I passed several groups with a polite “morning”. I did stop to commiserate with one guy who was clearly carrying all his gear with him for the whole 191 miles. I think he was already regretting it. Eventually, the lovely cliff walk came to an end and it was time to head east and inland. 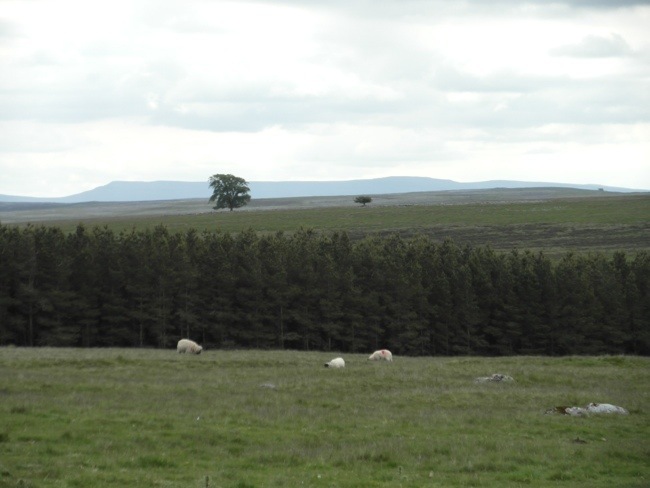 From just outside the hamlet of Sandwith, I got my first glimpse of Dent Fell, the major objective on today’s walk. 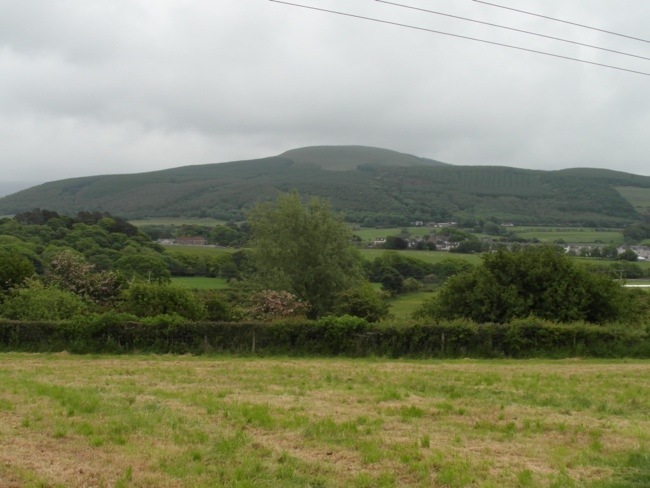 It is the rounded fell, the lower slopes of which are covered in a conifer forest. After passing through Sandwith, I headed toward Stanley pond, which as the guide book says, you can’t see because of the reeds – so I won’t bother with a photo. 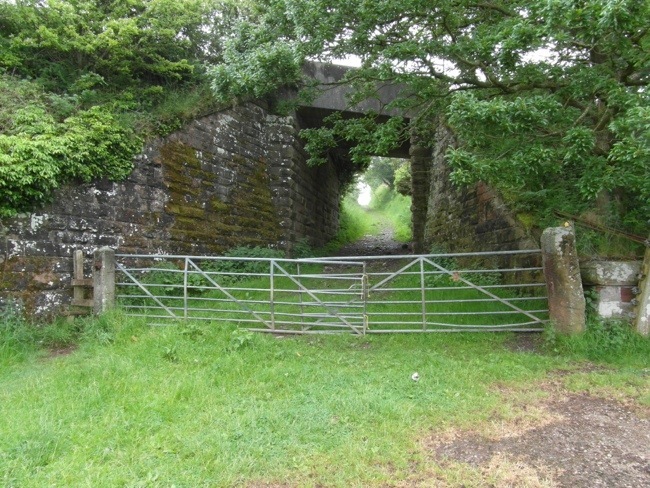 After passing under the bridge of the disused railway line, pictured below, I took the recommended alternative cyclepath route along the disused railway line – sadly now tarmacked. This brought me to Moor Row, where I had the rather surreal experience of seeing the B&B where I would be staying at the end of the day. 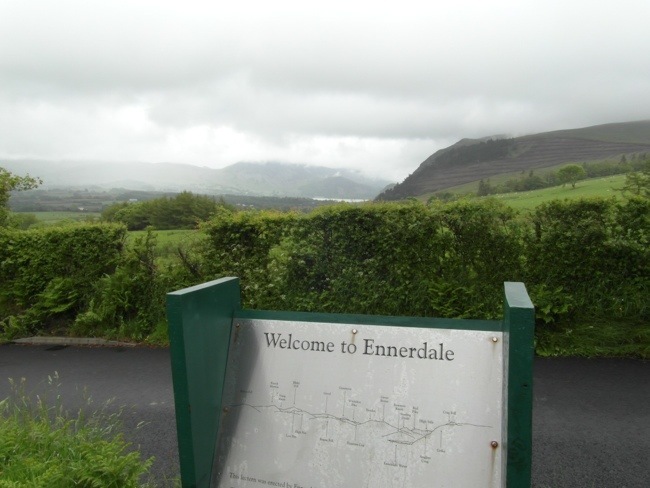 Originally, I was supposed to be staying in Ennerdale Bridge, but the Pub where I was due to stay had been closed because of a change in ownership. Dent Fell was now a much nearer prospect. 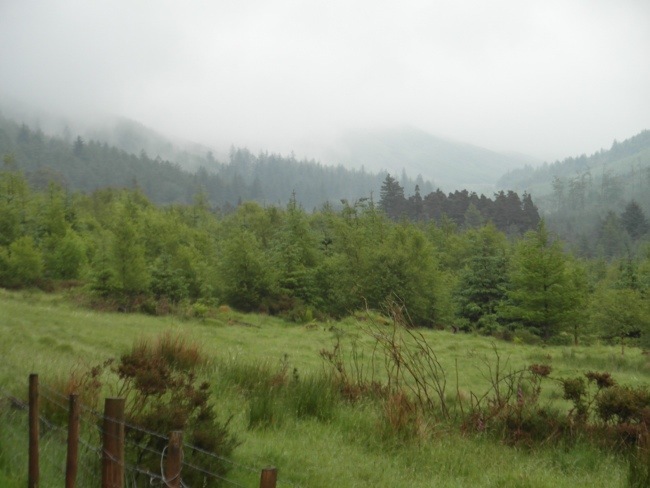 The climb to Dent led through thick forestry before reaching the open fell. 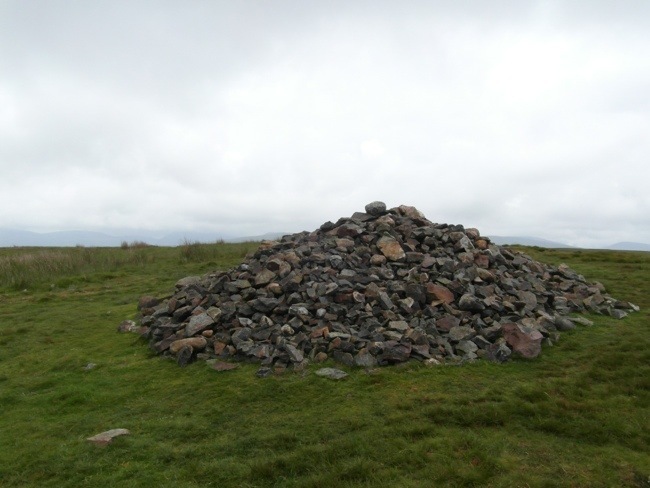 It was then a short but steep climb to the summit, which is marked with a large pyramid shaped cairn. In better weather I would here have had my first good view the Western Lakeland fells opening up before me. As it was, … well see below. By now the rain had come. It was persistent but light. 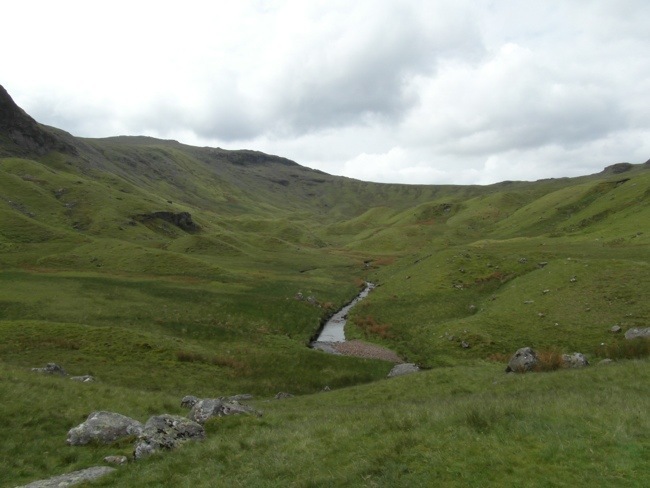 There followed a steep descent to the beautifully named Nannycatch Beck and a pleasant walk along its lovely little valley. A short ascent brought me onto the road that leads down to Ennerdale Bridge. 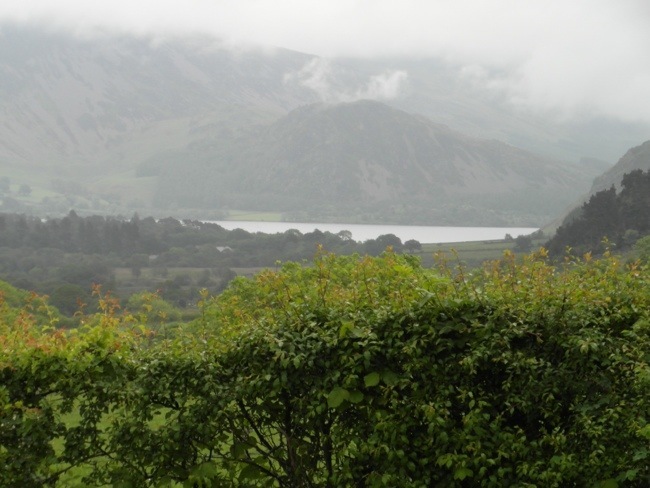 Here I got my first view of Ennerdale Water, the whole length of which I will walk at the start of tomorrow’s walk. 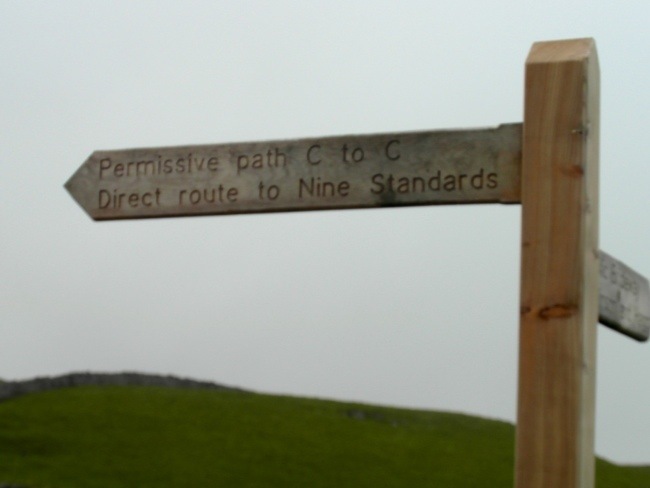 The sign helpfully pointed out the fells I would have seen were it not for the mist. 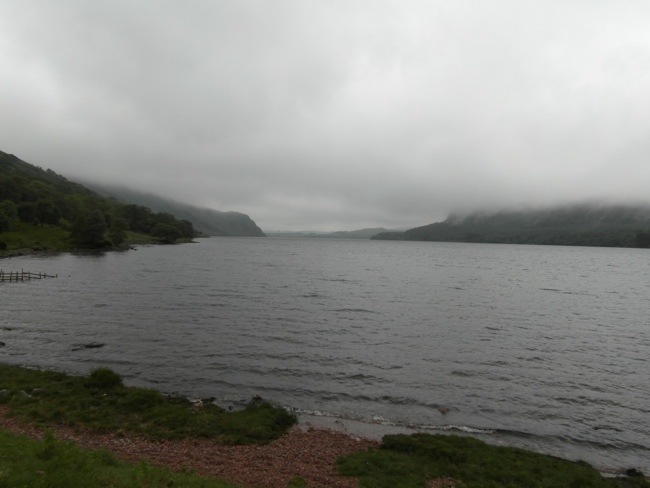 A final, rather atmospheric shot of Ennerdale, using the telephoto. By now the rain was coming down heavy. 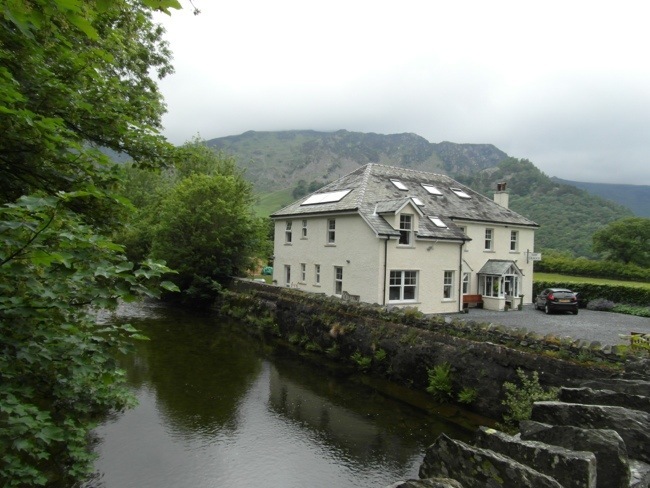 On reaching Ennerdale Bridge I called the Landlady of the B&B, who kindly came and picked me up and drove me back to Moor Row – a touch of deja vous set in! There is so much more I could tell you, but its getting late and I need to rest up for another big walk tomorrow. 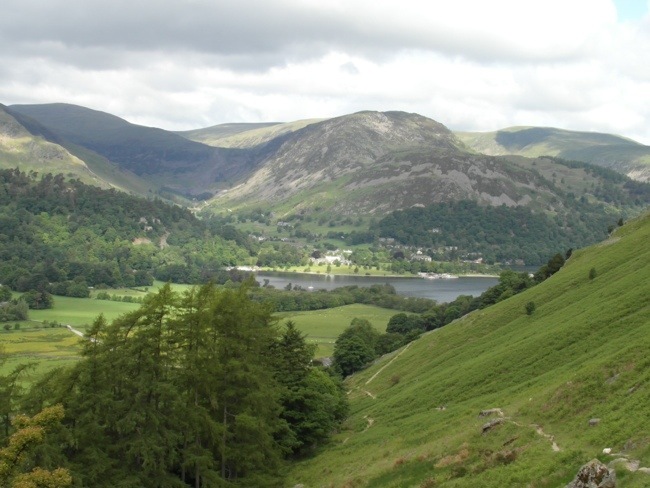 I am excited, as now I have left the coastal plain behind and the magnificent scenery of my beloved Lake District awaits me for the four days! After a good night’s sleep and a hearty breakfast, I was ready for day two. It had rained heavily during the night and the morning sky was dark with heavy clouds. Jean, the landlady at the B&B took me back to Ennerdale Bridge, so that I could continue my walk from the point I had finished the day before. 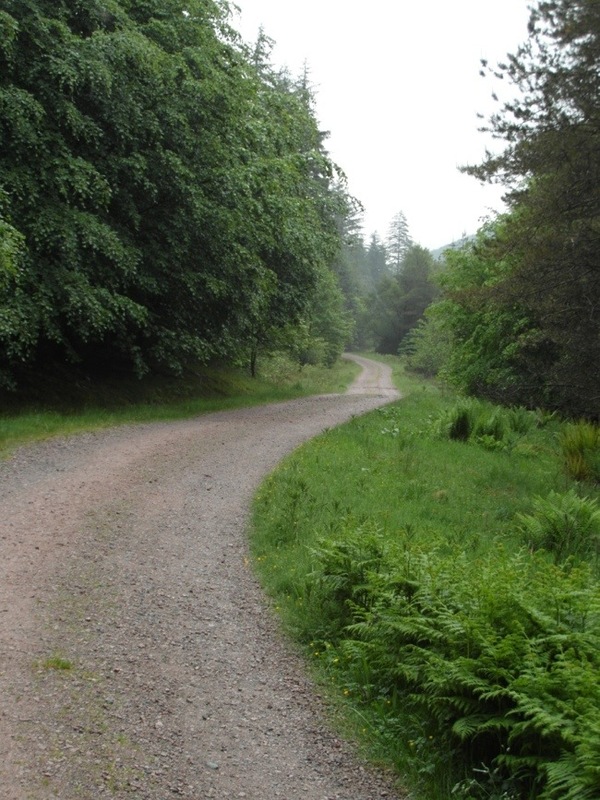 It is just over a mile of road walking from Ennerdale Bridge to Ennerdale Water. The skies were still gloomy when I reached the lake. Normally there would be dramatic views of the western fells from here but not today. 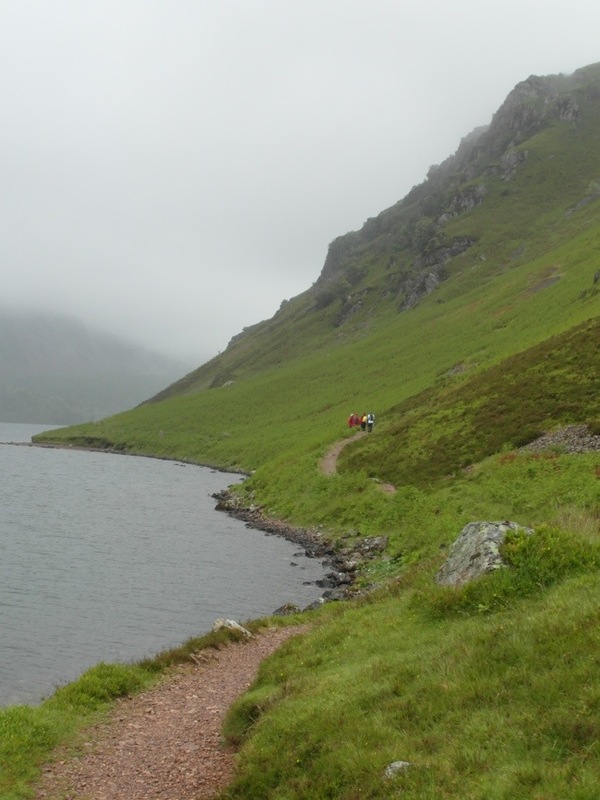 The C2C walk hugs the right hand shore of the lake. 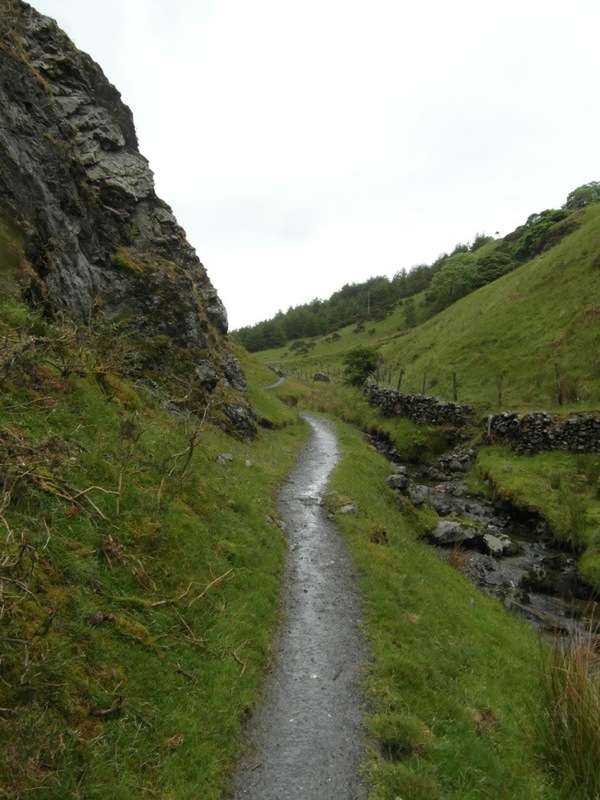 It is a fairly good path, but pretty wet under foot, in places it was like walking along a stream. 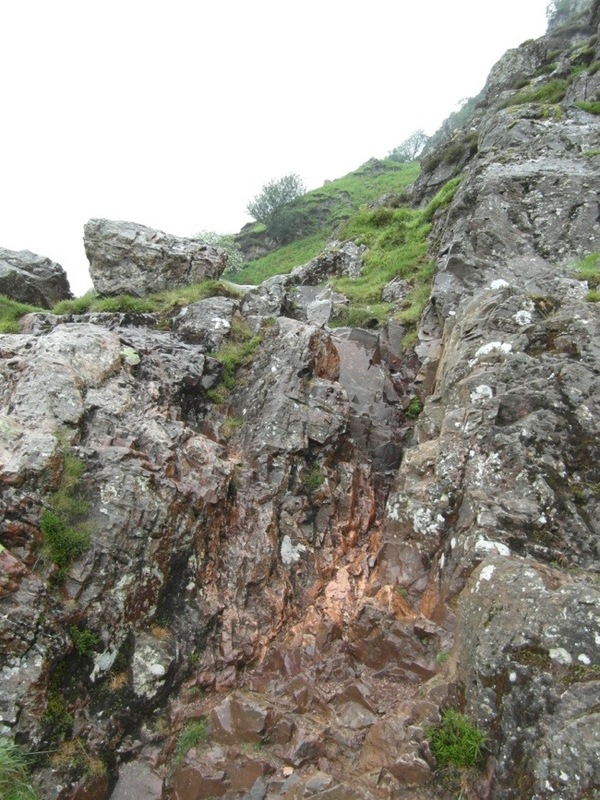 There is one awkward section of rock scrambling at a place called Robin Hood’s Chair. 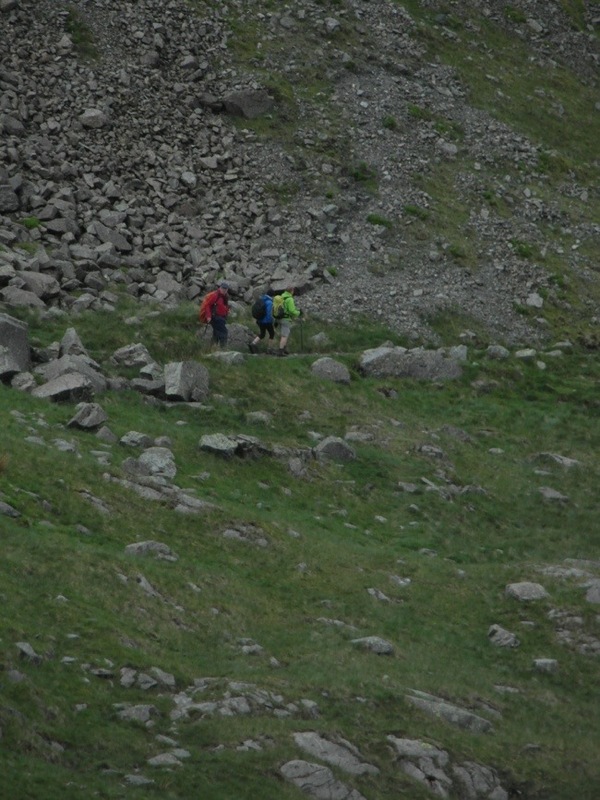 At this point I was passed by a couple of guys who had also passed me yesterday on the way to Dent Fell. Then we had only exchanged a hello, but today we had a brief chat about yesterday walk and the weather. 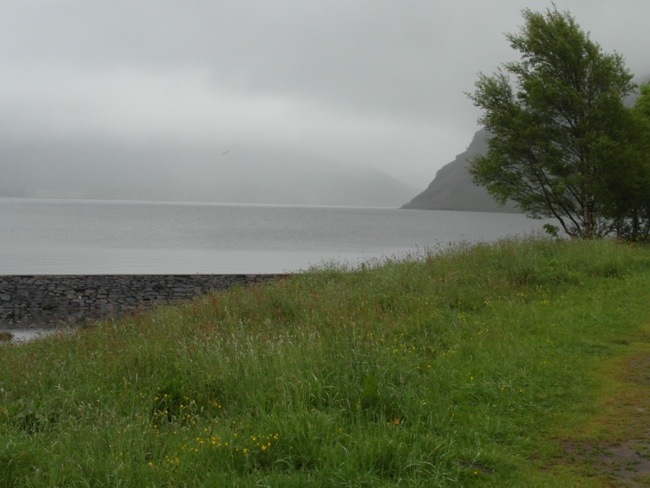 Another view along Ennerdale Water. Despite the clouds there was only occasional light rain. 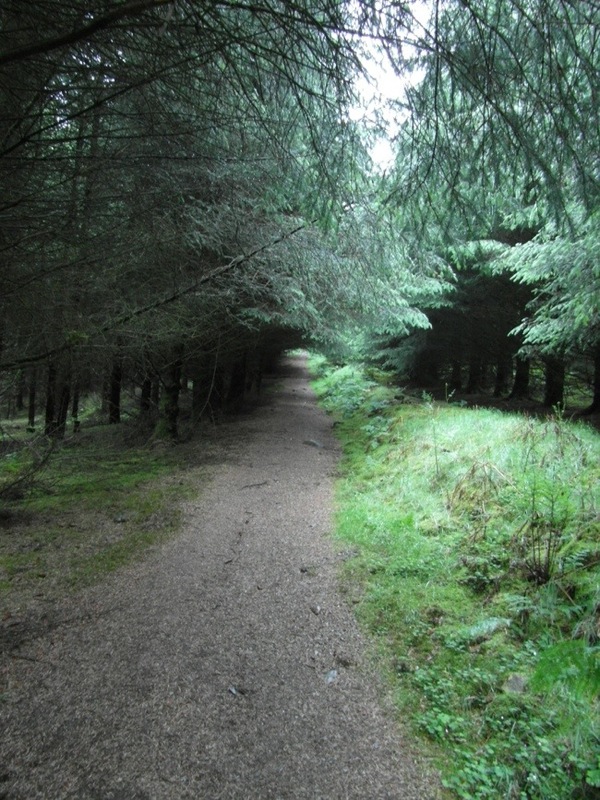 The final stage of this section of the day’s walk was through a more wooded area. 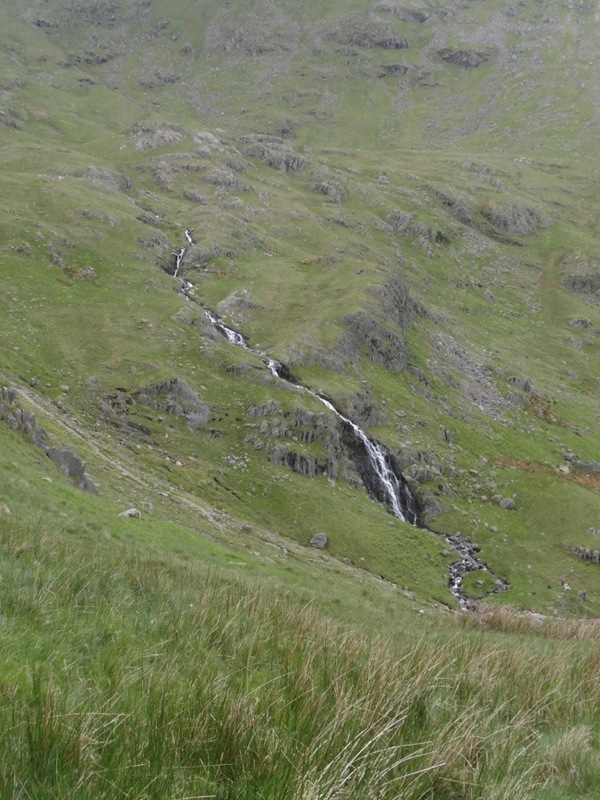 The first waterfall of the C2C. 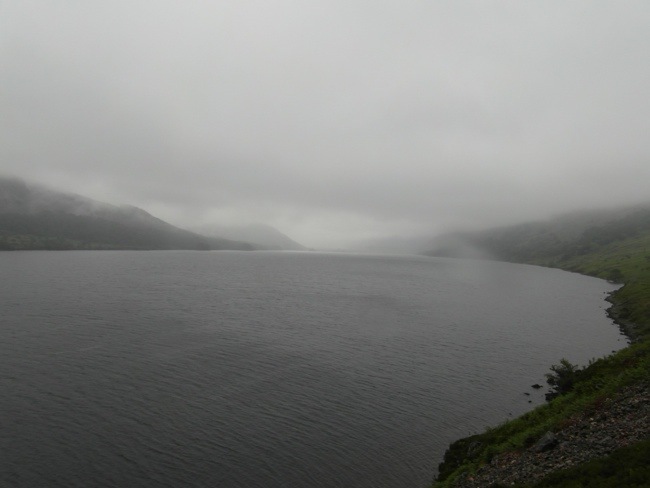 Eventually after about an hour and 45 minutes Ennerdale Water was behind me. Looking back down Ennerdale Water. Shortly after this, as I headed across an open grassy area, a sheep came running at full pelt through a open gate in a stone wall, closely followed by two smallish dogs, chasing the sheep down the field. Shortly behind them was the owner of the dog, running after them and calling the dogs, who didn’t take a blind bit of notice of his calls. The sheep and the dogs disappeared out of sight. Farmers have been known to shoot dogs for such behaviour, but it was the irresponsible owner who was really at fault. 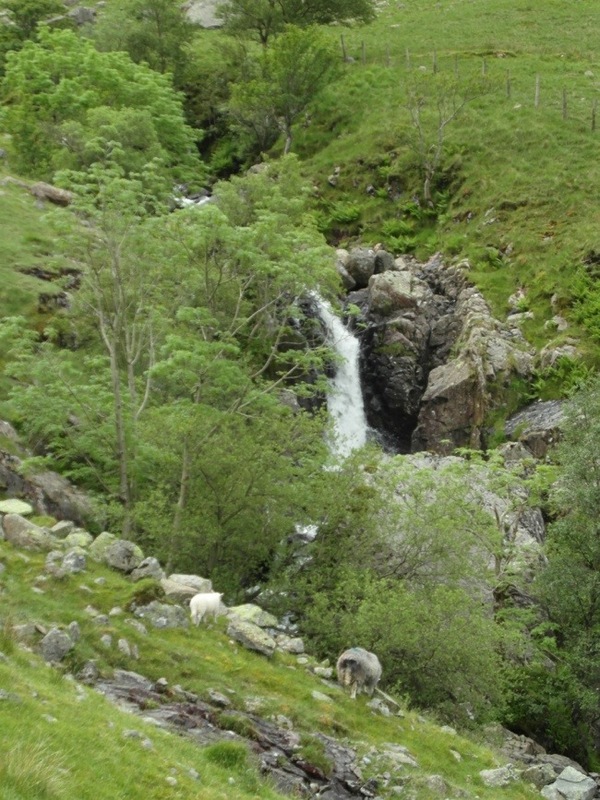 I hope the sheep was OK.
With the crossing of the River Liza the walk entered a new stage. 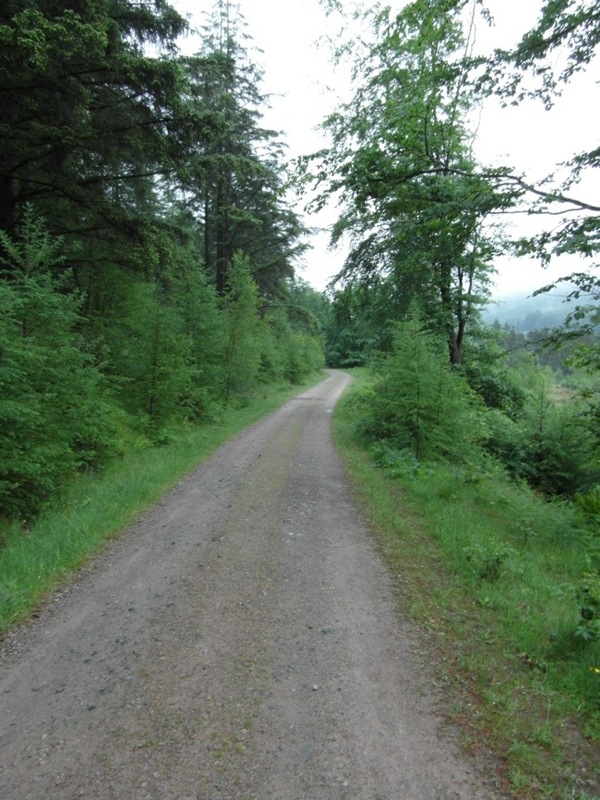 There was long stretch to walk along the forestry access road. The view should have been of dramatic mountain scenery, but…well..clouds…enough said. Shortly after this I met three walkers at a junction in the road. They were C2Cers and we compared maps and walked on together. This was John and his wife Christine and their friend Pat, all from Lancashire. Pat’ s husband is due to join them later in the week. 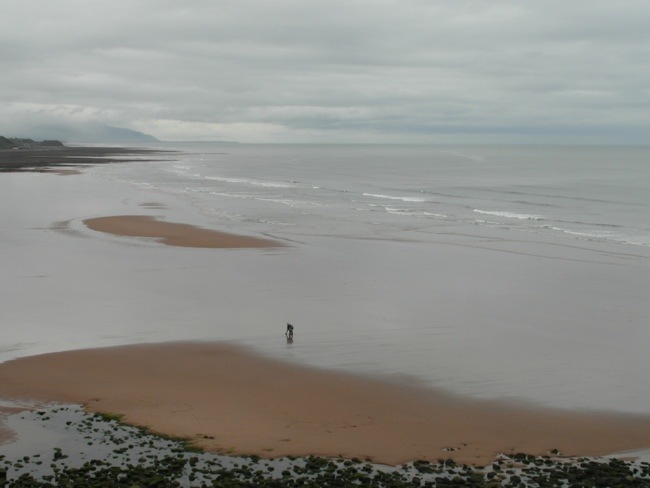 I didn’t realise it immediately, but I had taken a photo of them on John’s camera at the Irish Sea back at St Bees. We talked about our different experiences. I told them about starting off with an American guy from St Bees and how he had to go back because he still had his room key. They said almost in unison, “Oh, that must be Manhattan Pete!”. They had met him on the ascent of Dent. 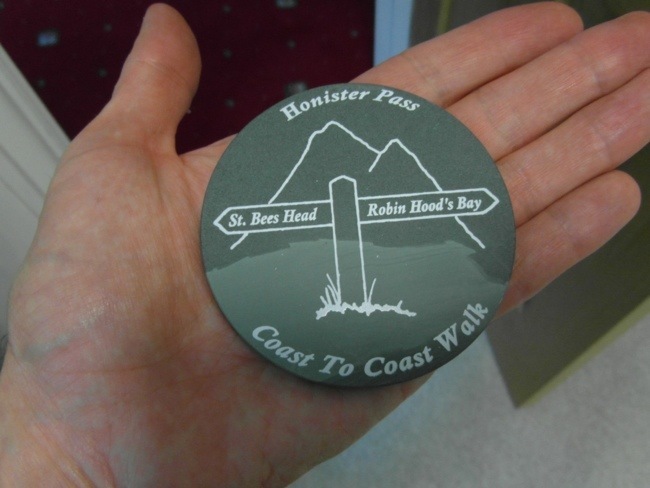 There is something of a tradition of among C2Cers to give fellow walkers a “handle”. Pete had told them he was from Conneticut, nr New York – hence Manhattan Pete. They asked me later where I was from and, of course, I told them, London, but that I am an Essex boy, from nr Southend on Sea. Later on Pat said,’I suppose you could be “Southend Shaun”. So I guess that is how I will be known for the rest of the C2C. I christened them, “The Lancashire Three”. Higher up the valley there was much evidence of how the Forestry Commission is gradually reducing the amount of conifer forest. It will, in time, be a big improvement. 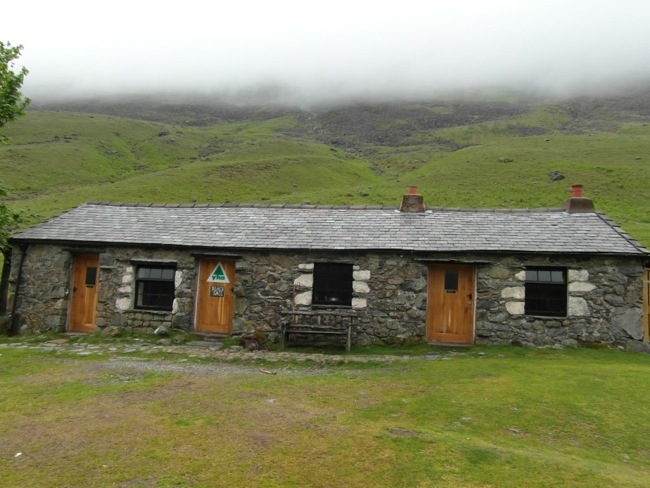 Eventually, the forest came to an end and there ahead of us was Black Sail Youth Hostel, a hut in the middle of dramatic Lakeland scenery. It is a popular spot and gets booked well in advance. Here we stopped for lunch. John and Chris enjoying lunch. After lunch the hard work was about to begin. We now had a long steep climb ahead of us. 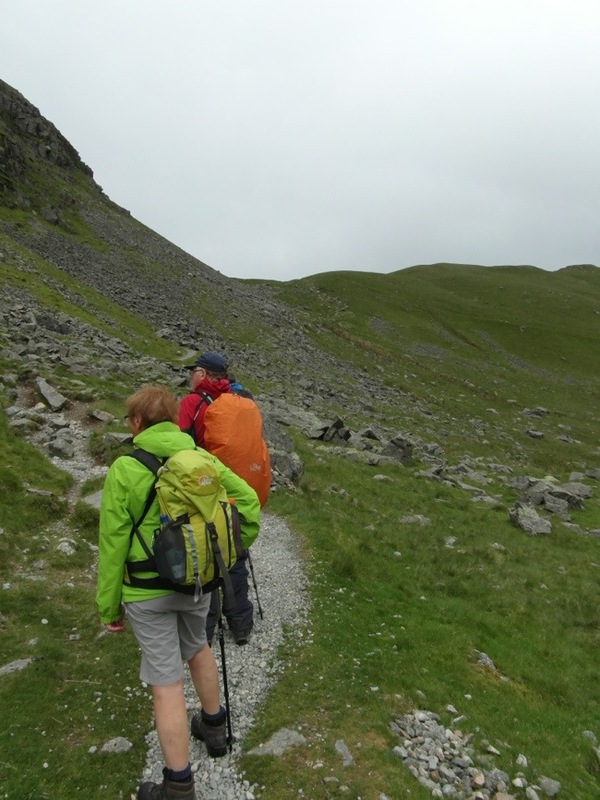 It started off OK with a gentle fellside traverse. A waterfall up ahead were impressive. 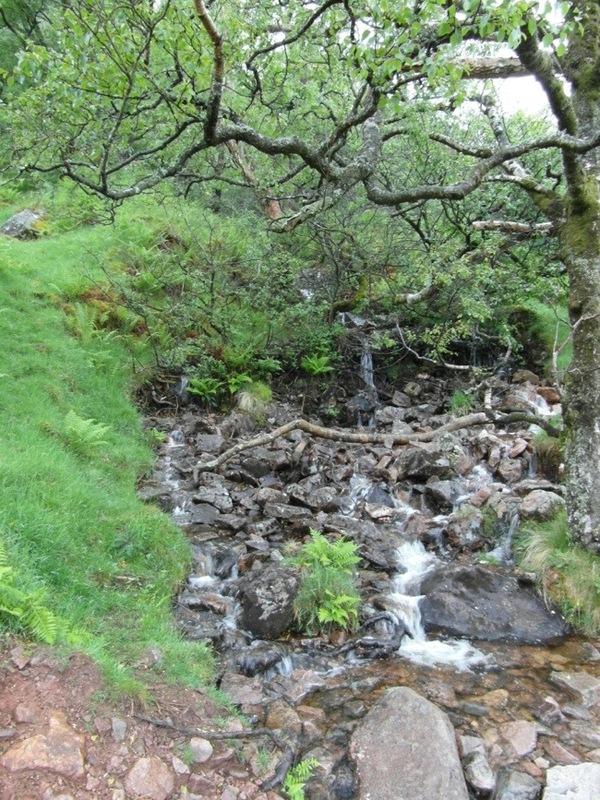 Then after a tricky crossing of Loft Beck, we climbed up a path on the right hand side of the beck. 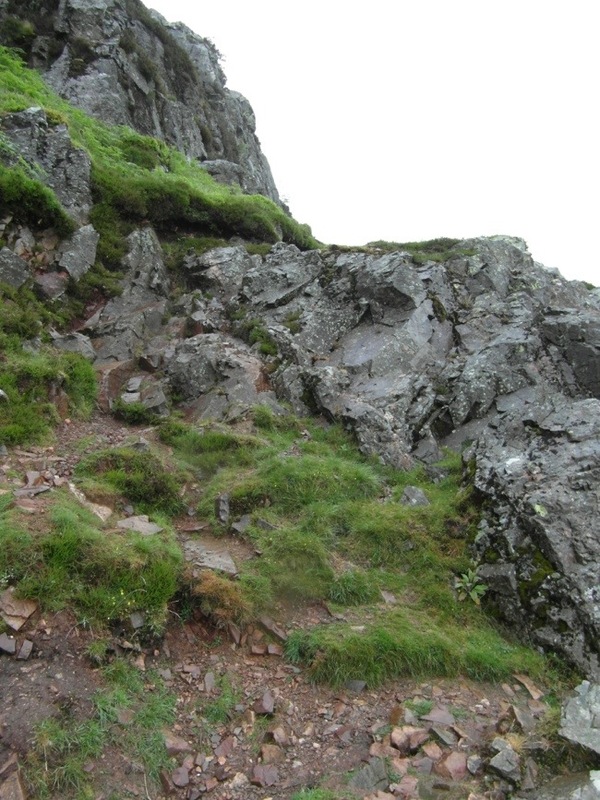 It was steep, but the path improvers had stepped the path with rocks, which made for easier progress. We were heading into serious cloud mist now. Pat pressing on ahead and John and Chris (you can just make them out) bringing up the rear. 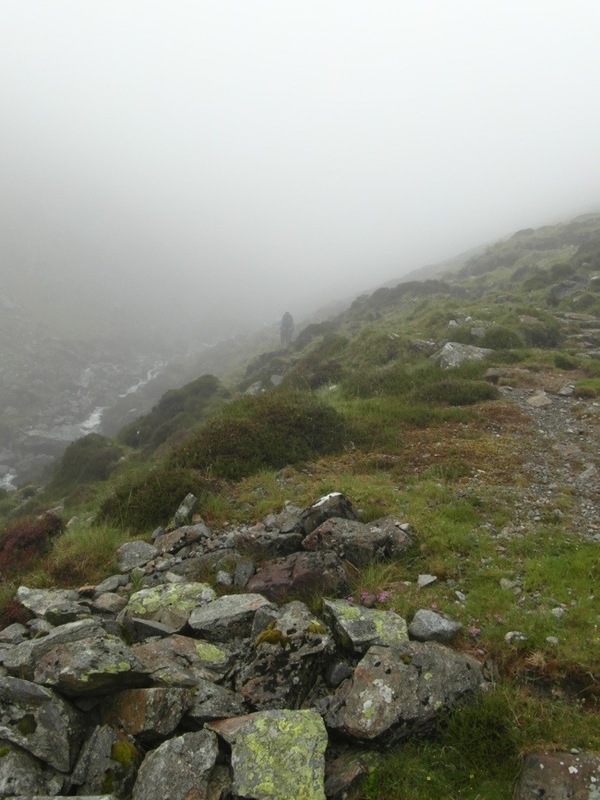 After the steep section the path continued from the top of Loft Beck on a path that was well marked with large cairns, of which we were really glad, because of the mist. I didn’t take any photos here, because, well, mist is mist and not very interesting to look at. 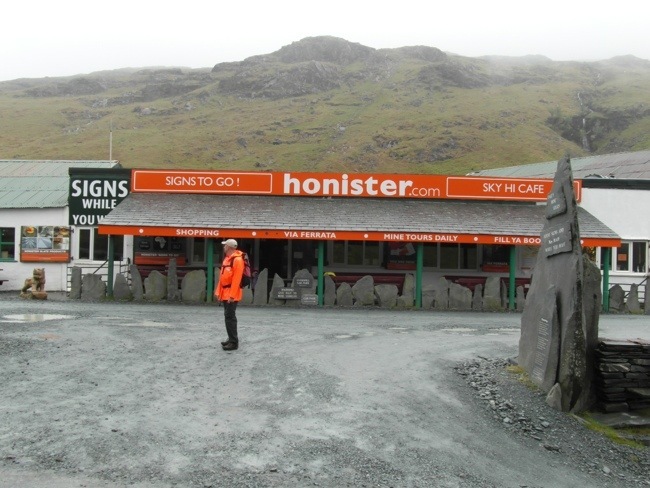 Eventually, we began to descend to the Honister Slate Mine at the top of Honister Pass. This is a fascinating place. 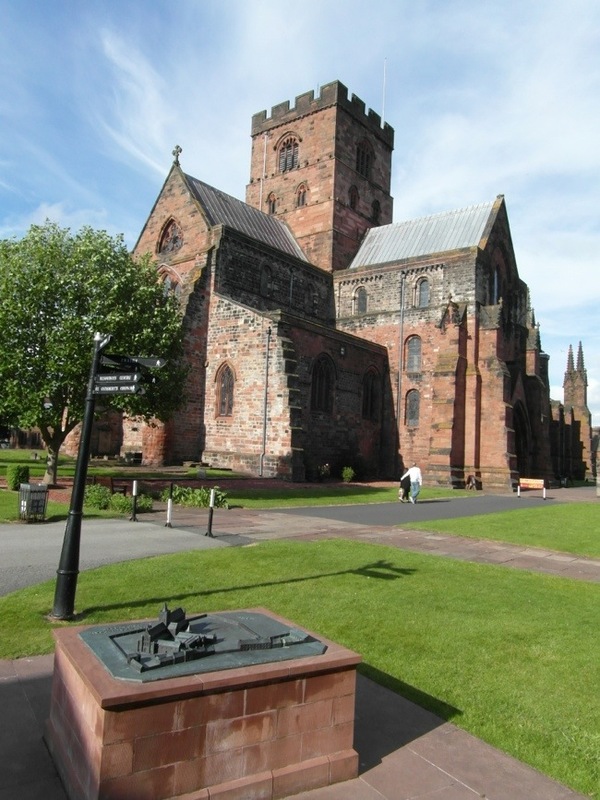 It was reopened some years ago and now has a bustling tourist trade. As we descended to it we could see many cars in the carpark. Pat thought she could see Manhattan Pete up ahead. As we approached the Tea Room there was Matthew from my first night in St Bees sitting outside on a bench. We greeted each other warmly and I introduced him to the Lancashire Three. Matthew, lets call him Dutch Mat, shared his experience of the walk that day. He had found it tough, but said that he had been joined part of the way by a lovely American guy from New York. John, Chris,, Pat and I all said in perfect unison “Manhattan Pete”. Dutch Mat confirmed his name was indeed Pete. However, Pete remained elusive that day and we never caught up with him. Perhaps we will meet along the way tomorrow. The lady in the shop told me that they had just had a film crew with them shooting a comedy about the coast to coast walk. She said that they had now moved down to Seatoller and that we might see them there. She said that one of the “actors” was quite famous, but obviously not famous enough for her to know his name. It seems a strange theme for a comedy, somewhat of a niche market, but I will definitely look out for its release. At this point, I decided to press on and said farewell to the Lancashire Three, thinking they were stopping for some tea. I began the descent down the Honister Pass, where the views began to open up down to the lovely valley of Borrowdale, today’s destination. 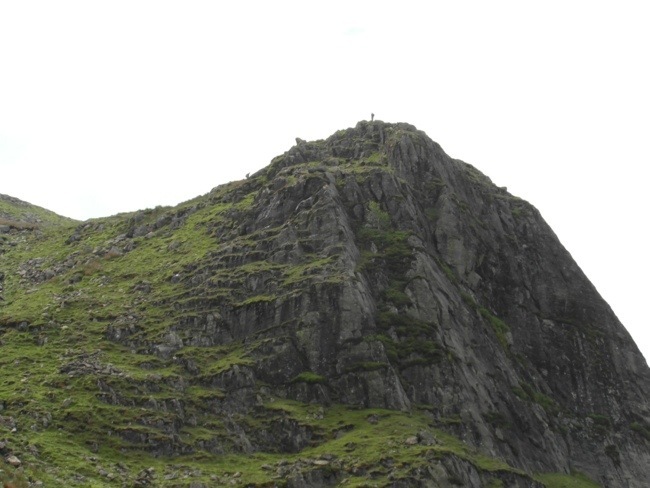 And Glaramara (which I have climbed on a previous visit). I am open to correction if I have got the idenification wrong. As I kept stopping to take photos, the Lancashire Three caught up with me, as they had decided not to stop for tea after all. We continued down towards the valley together. We soon came upon the film crew setting up for a scene. We all checked out the actors, and after we had passed by, I whispered “Did any of you recognise them”? All said “no”! Perhaps we will meet them again along the route in the coming days. We were now coming to the valley floor and soon spotted the lovely hamlet of Seatoller. One final obstacle remained. A tricky rocky situation along the river has been installed with chains to help a safe progress. I’m not sure any of us really needed them, but it made for a good photo opportunity. At the YHA a little further on the Lancashire Three did this time stop for tea and cake and I pressed to my B&B, which was just outside the village of Rosthwaite. As you can see it is nicely situated. My room looks out over the beck. Another truly memorable day was thus completed. Although it had been cloudy all day, there had been surprisingly little rain and I got a lot less wet than on Day One. 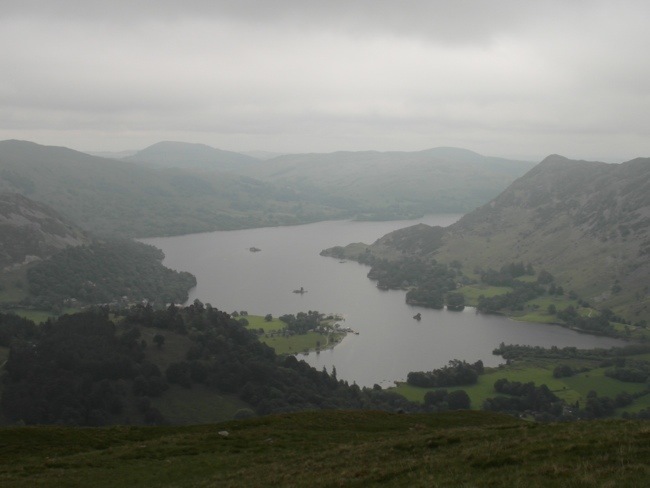 Tomorrow the weather looks to be improving slightly for the lovely climb over to Grasmere. I just want to express my thanks to all of you who are following my blog and especially to those of you who have posted comments. I am glad that you are enjoying following my progress. I kind of feel that you are all sharing the experience with me. Let me begin by apologising for not blogging yesterday. 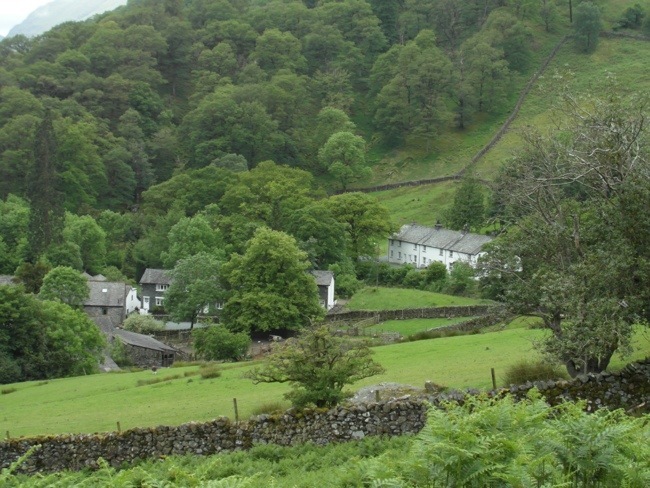 I had thought that Grasmere would be one place where I could be sure of a good WiFi connection, as I was to be staying at the Red Lion, quite a prestigious hotel in the centre of the village. They did indeed have WiFi, but it was impossible to connect to it from an iPad. I queried it, but all they had was some feeble excuse that the Ipad firewalls caused a problem. Well, I thought to myself, I haven’ t had this problem anywhere else enroute. I was not a happy bunny…as you can probably tell. So now, I will do two blogs this evening, as a result they may be a bit shorter. Not being a regular blogger up to this point, and having to get used to blogging from an iPad, it is quite a slow process. Anyway, on to the the events of Day Three. Being a Sunday, I began the day with an early celebration of Mass before breakfast. That reminds me of something I meant to tell you on Day One, but which I forgot to include. On the night before I left London, the Missionaries of Charity (The Mother Teresa nuns, if you don’t know them) posted a letter through the Presbytery door, with the clear instruction “Not to be opened until Day One of your walk”. 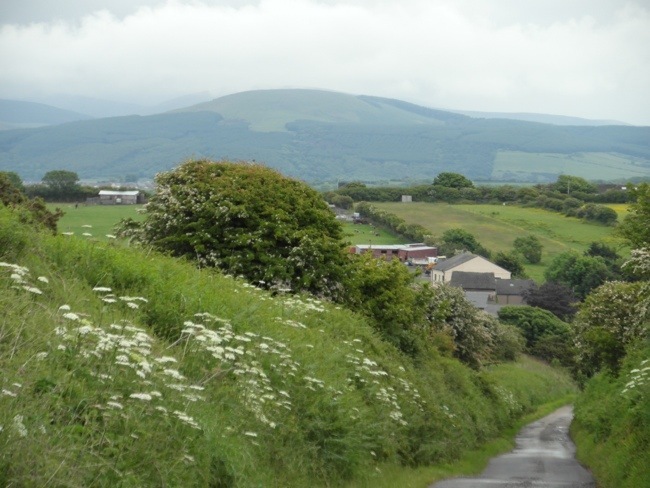 When I opened it on the first morning before setting off from St Bees, I found inside a beautiful little handmade booklet, in which the Sisters said that they would like to spiritually sponsor me with a little spiritual reflection for each day of walk. Each little reflection is accompanied by a lovely picture. I have been reading the little reflection each morning and it has been lovely to reflect on it during each day’s walk. At breakfast there was a group of Australians also doing the walk, but none of whom I had met along the way. 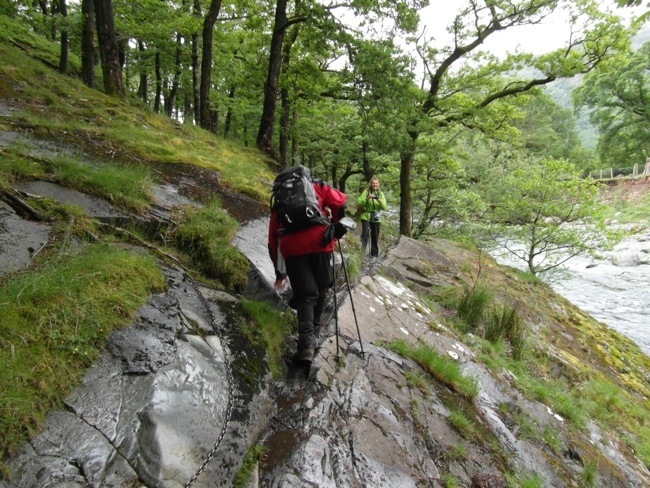 They were making a more leisurely itinerary, stopping for a few days in Grasmere, so I don’t think our paths will be likely to cross again. 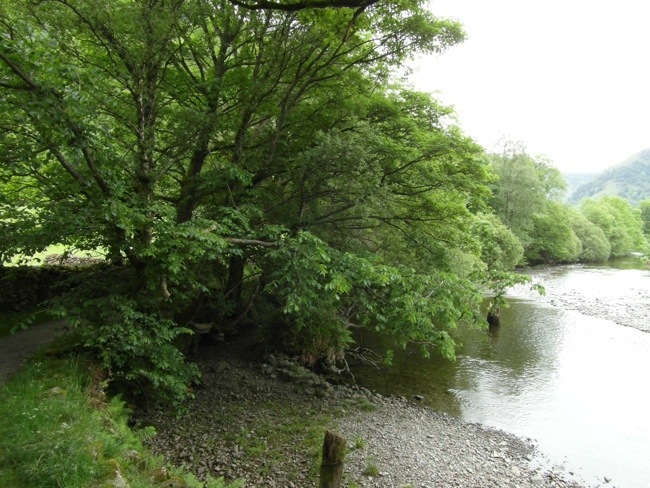 The walk began with a pleasant stretch along Stonethwaite Beck. As I approached the beginning of the walk I saw a couple of guys, who had been at breakfast on the first morning in St Bees. We exchanged waves, as I was a little way behind. 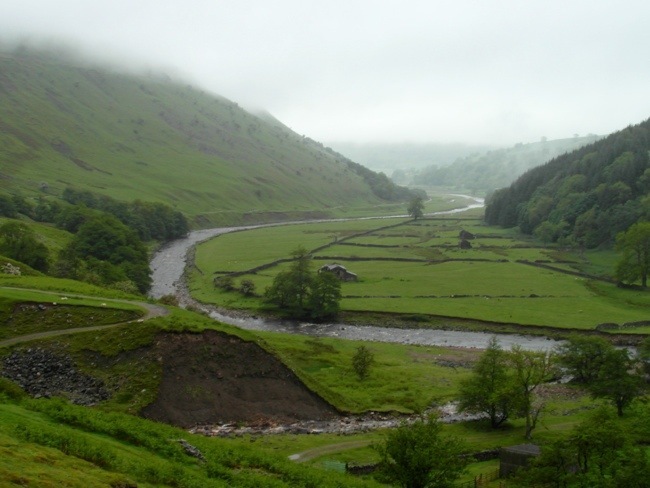 I didn’t see them again, but later found out that they were not stopping in Grasmere, but pressing on to Patterdale (doing in one day, what I am doing in two). This is perfectly feasible as both days are short mileages, but this is the most beautiful section of the walk and deserves taking time over. 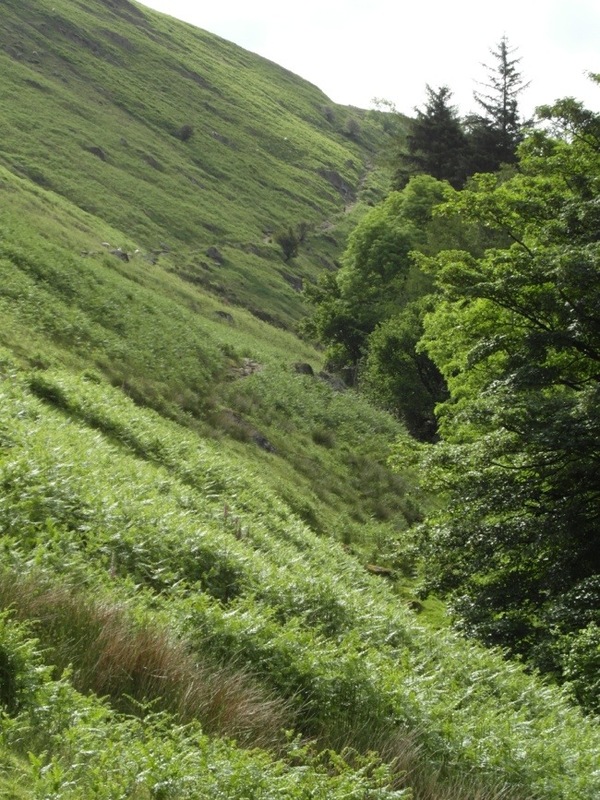 The path runs to the left of Stonethwaite Beck through the trees. 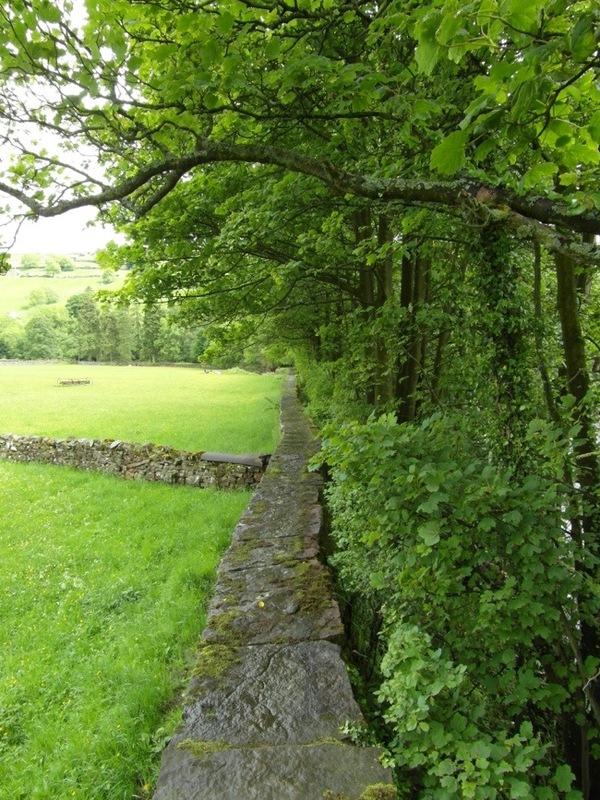 The Lake District is famous for its dry stone walls. 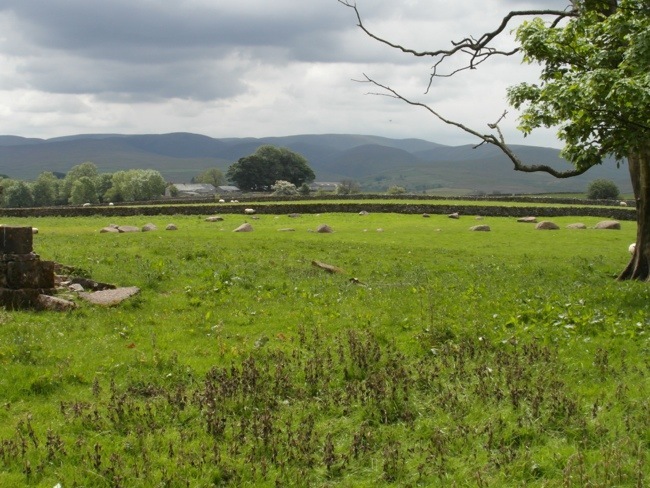 I admired this beautiful stone sheepfold. My path headed up the valley headed. 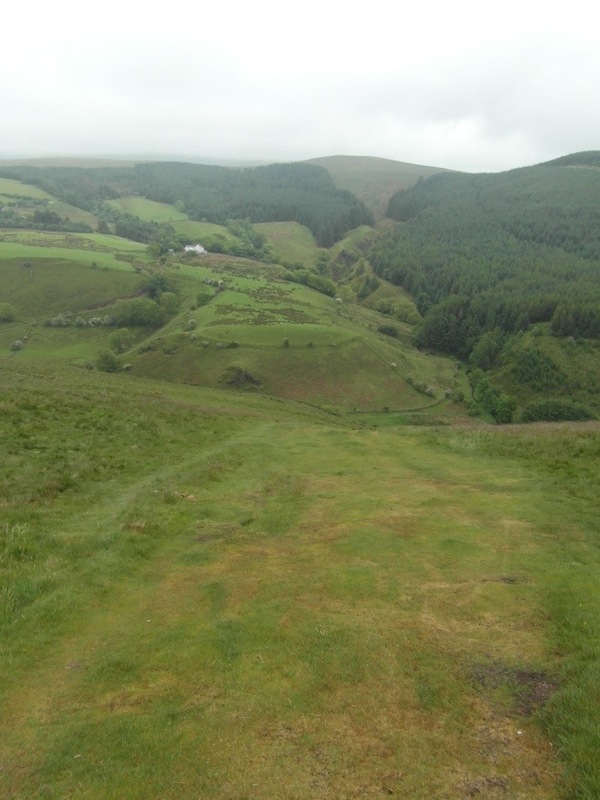 A little further up, I stopped for a breather and looking back down the path, I saw a walker heading up the path. I thought I recognised him, and indeed, it turned out to be Manhattan Pete. We caught up with each others’ experiences and walked on together. 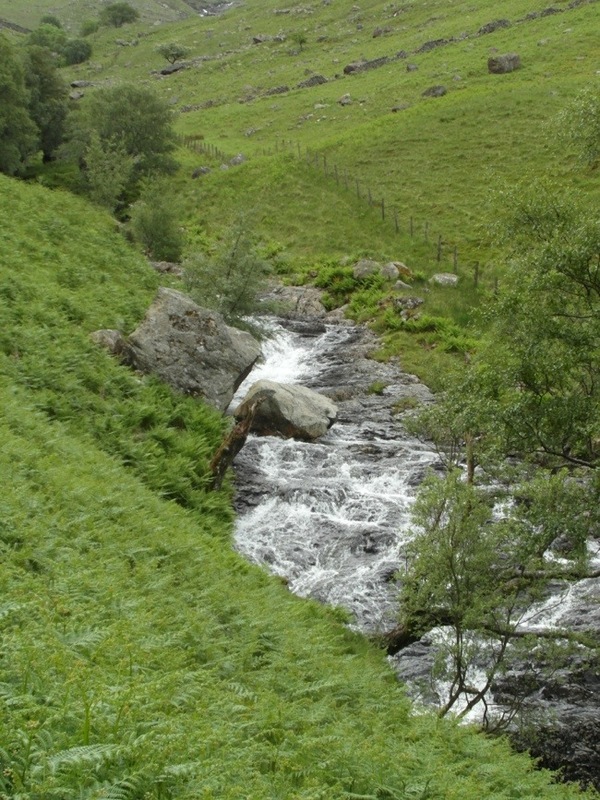 As we headed up the valley we were now following a different watercourse – Greenup Gill. It had many beautiful waterfalls. 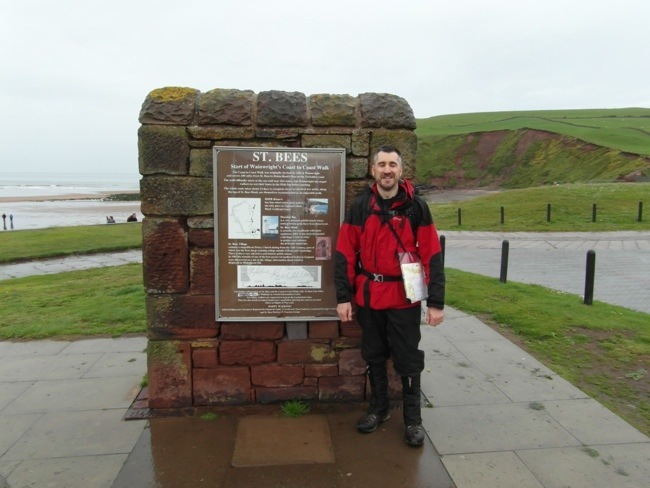 As we had back at the start of the walk at St Bees, Pete and I took each others’ photo. As we headed on this beautiful view opened up before us. 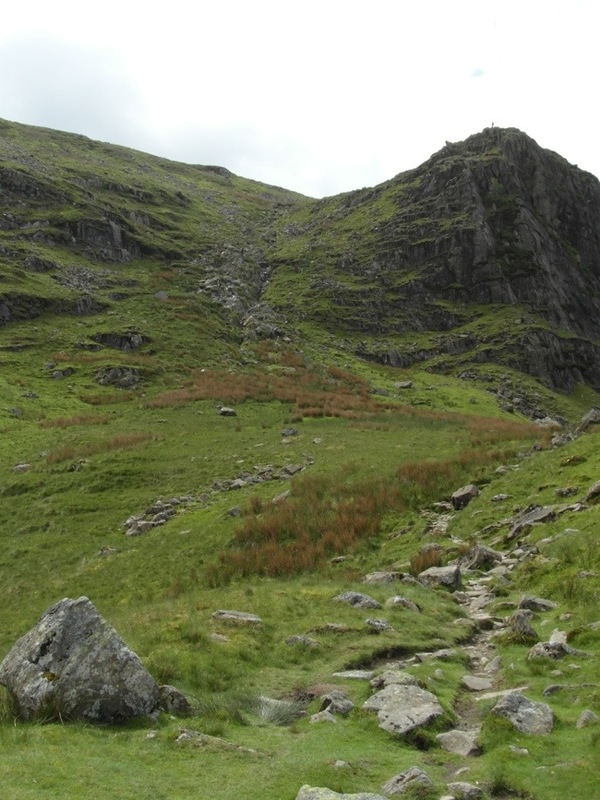 But our path would take us to the left of the formidable buttress of Lining Crag. We could see that someone had already made it to the top and was admiring the view. We began the steep climb. 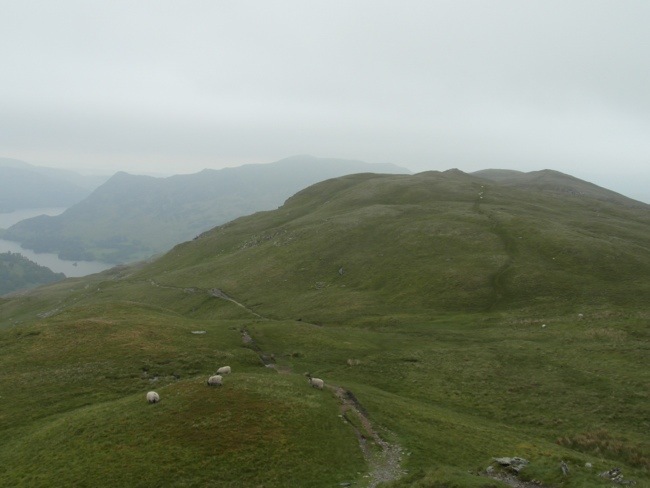 As we approached the top of Lining Crag we could see that there was a quite a gathering of walkers there. As we got nearer we realised that it was the Lancashire Three and another couple I hadn’t yet met, called Dave and Pam. In the photo below, you can see them all. John (one of the Lancashire Three) is offering Manhattan Pete (and the rest of us) a piece of Kendal Mint Cake. There were some great views from here. The large fell in the far distance to the right of centre, just out of cloud, is Skiddaw, fourth highest of the Lakeland Fells. I happened to know that a walking friend of mine, Paul, was there today with a group of friends. So near..and yet so far. The lake that you can see in the distance is Bassenthwaite Lake. Incidentally, the only lake in the Lake District that actually has “Lake” in its title. 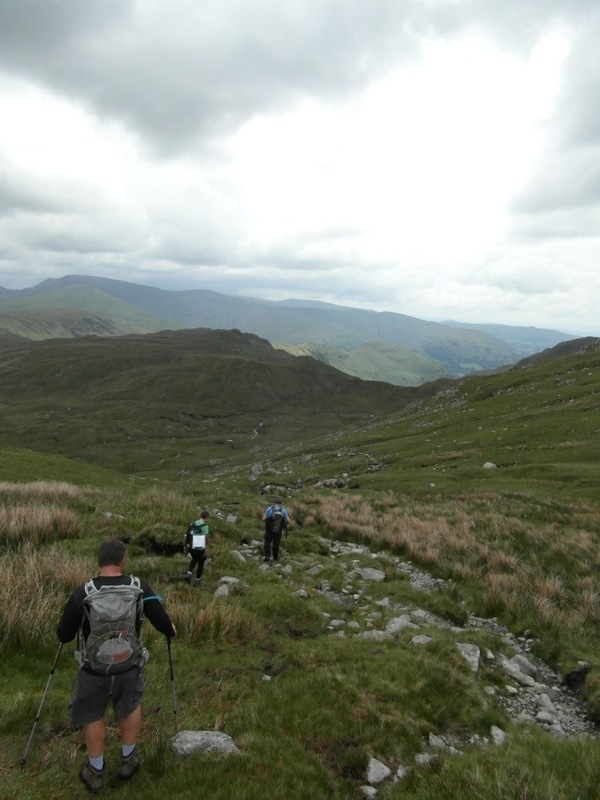 We all carried on together towards our next objective, Greenup Edge, from where we could see the next pass opening up before us. Here a big decision would have to be made. At this point it is possible to choose between two routes. 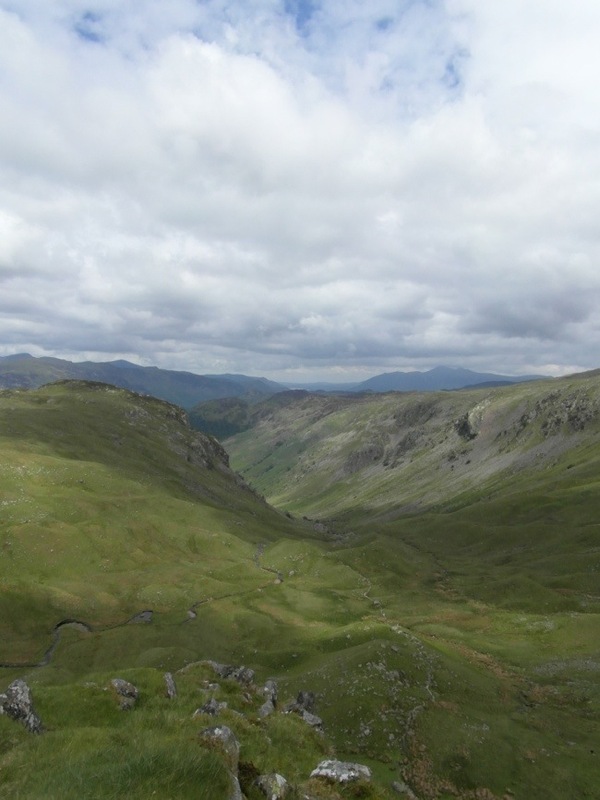 Either to descent to Grasmere via Far Easedale, or to take the high route via the Calf Crag – Helm Crag ridge. Here there was a parting of the ways. The Lancashire Three and Dave and Barbara decided to head down Far Easedale, while Pete and I decided to do the high route. You can see the high route to the left of the photo. 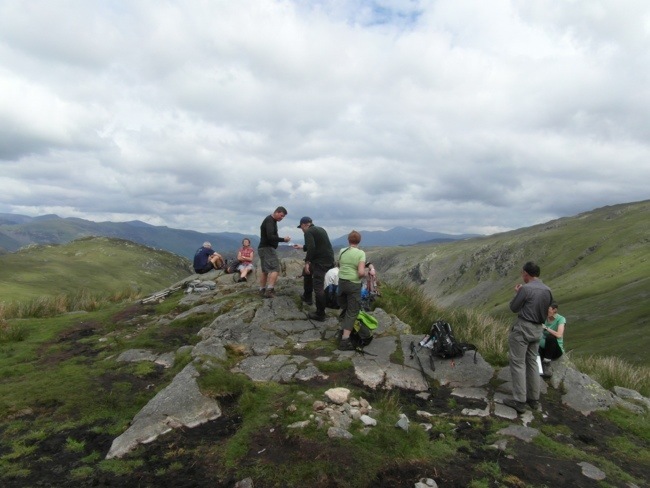 The first summit to be reached is Calf Crag. 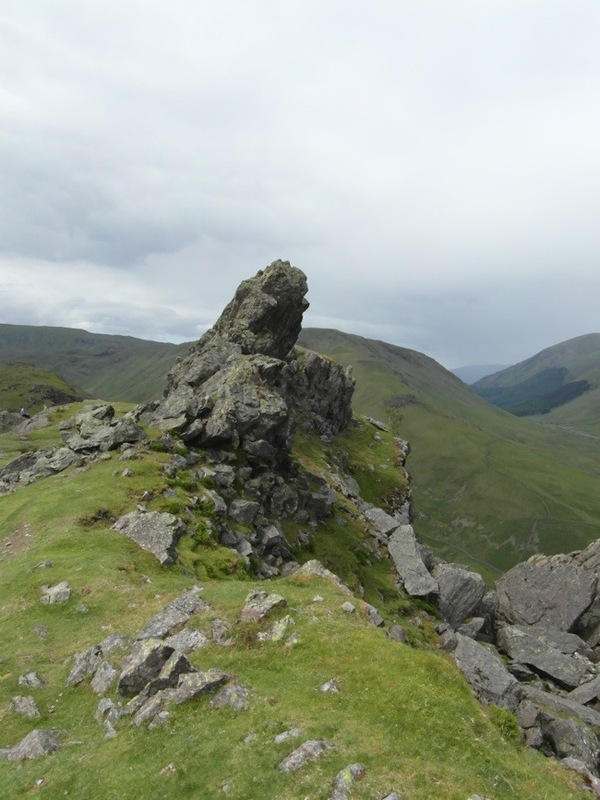 Then it was on to Gibson Knott, and finally the famous Helm Crag, known often as ‘The Lion and the Lamb’ from the way that a rock formation looks like these two animals from the road that passes by Grasmere. I was taking my time. As you can see, the weather was improving. Pete decided to press on. That’s very much the way it is on this walk, noone feels under any pressure to walk with anyone for the whole day. People either hang back or press on as the mood takes them. 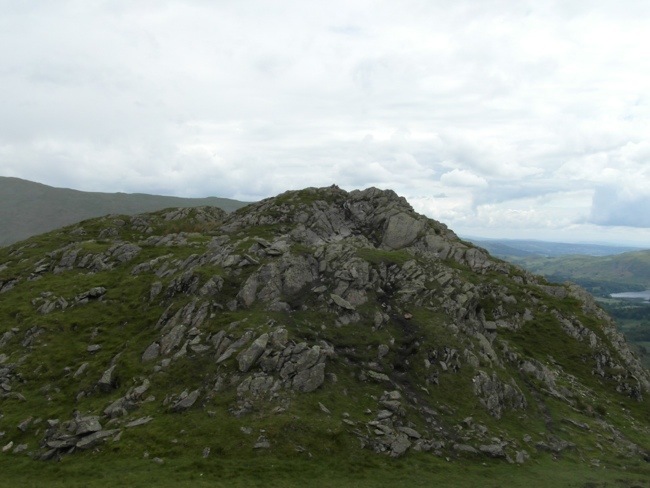 Before reaching the Lion and the Lamb, you come to the true summit of Helm Crag, this is an impressive feature known as ‘The Howitzer’ from it’s shape. 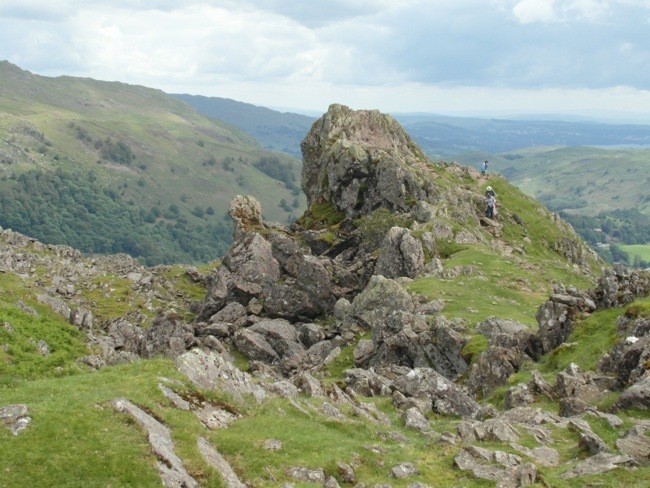 If you want to truly be at the highest point on Helm Crag you need to climb to the top it. While I was there I saw a young walker attempt it. He made it to the top very swiftly. His girlfriend stayed firmly at the bottom. Now, I know what you are now all wondering…did I climb it?? The answer is a firm no! And below you can see why. It is a big drop from the other side! A short way further on and you come to the Lion and the Lamb. They are not so clearly identifiable from up here. Do you think you can see them? There were some lovely views down to Grasmere. 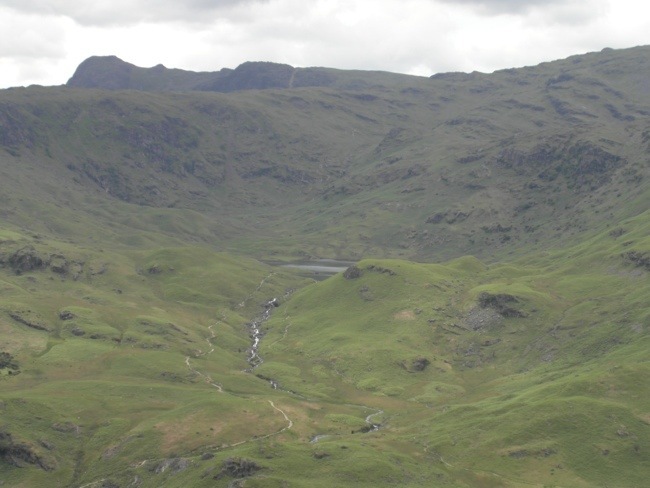 And across the valley to Easedale Tarn. 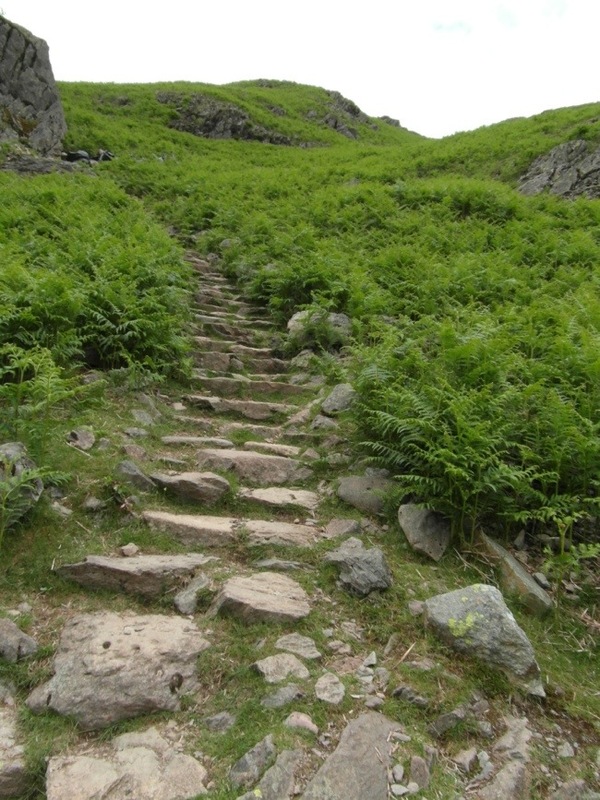 It was now time for the steep descent down to Grasmere. No, these are not bin bags! 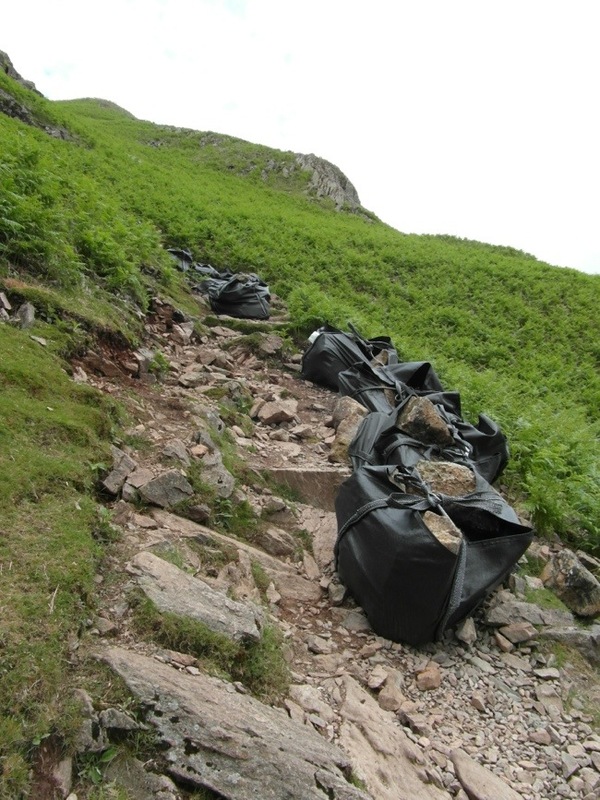 They are bags filled with large stones, which the National Trust will use to repair the path, badly damaged by the number of walkers going up and down. This happens all over the Lake District. They fly the bags of stones in by helicopter. I actually saw it happening once near Buttermere. And here is a section they had already done. 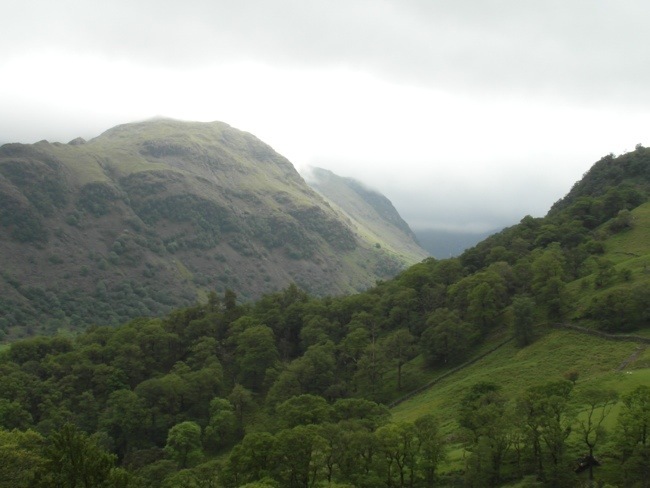 There followed a nice walk along the end of the Far Easedale Valley into Grasmere. 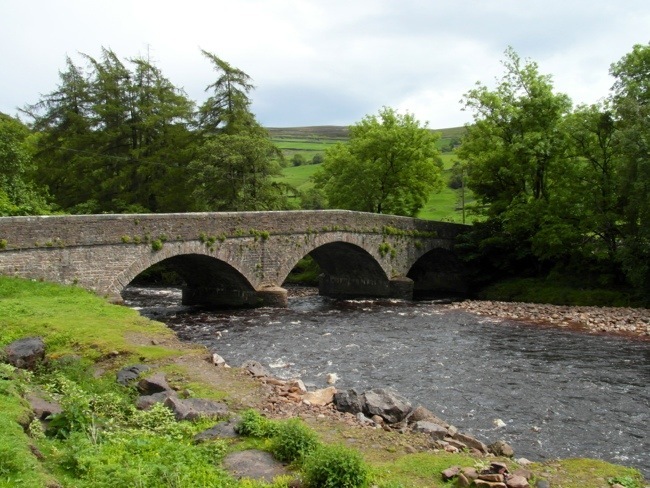 On entering the village, I soon found the Lancashire Three sitting outside a cafe enjoying tea and cake…again. You may remember I left them on Day Two at the Youth Hostel in Borrowdale doing the same thing. After a lovely pub meal with Manhattan Pete, I made the most of the gorgeous evening (note the blue sky – pity it didn’ t last until the morning) to have a wander around the village of Grasmere. It was unusually quiet, all the tourists having seemed to have gone home or moved on. 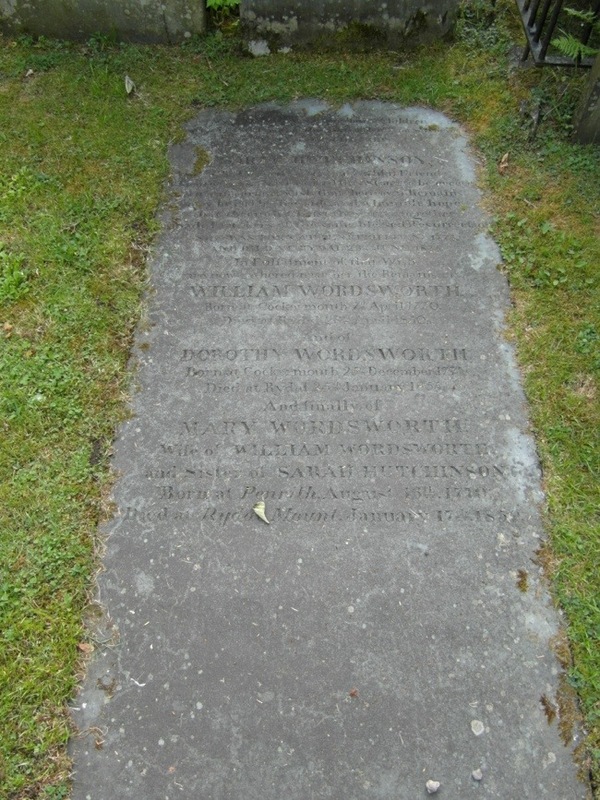 I took these photos of the lovely church and the graves of William and Dorothy Wordsworth, who lived nearby in Dove Cottage. You may be wondering how my body is holding up to the walk so far, especially my feet. I am pleased to report that I have no significant blisters (the bathing in tea must have helped). My two big toes get a little sore by the end of each day, but they are well protected with preventative blister plasters. My shoulders tend to be a bit achy in the evenings from carrying the rucksack, but by far the worse problem is that midges have decided to make a meal of meal of me! My forearms are covered with bites, I counted 15 on one arm. I also have some bites on my head and neck. Nobody else seems to be suffering with them, so I think I must have especially tasty blood. They itch like crazy! Anyway, I will conclude now, as I have a another blog to write this evening! First priority after breakfast was to visit the chemist and see what I could get for my for my itchy bites. They gave me some anti-histamine tablets, which I need to take three times a day. They have been working, but they are really itching as I type this, so I think I must be due the third one. All of this set me back some way, so most of my usual fellow walkers started out well before. 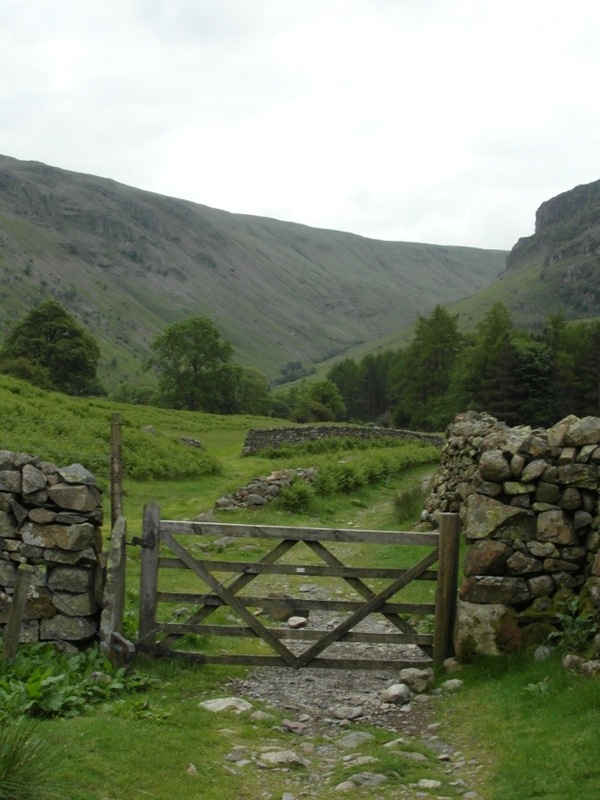 After a little walk alongside the A591 I arrived at the bridleway marked for Patterdale. It wasn’t long before I saw a walker ahead of me. It turned out to be Luke, who I had met briefly on Day Two, but whom I hadn’t spoken too much. He disappeared around the corner. When I rounded the corner, I saw the Lancashire Three just ahead of him. We greeted each other warmly and I was introduced to Luke. Others had walked with him previously and I had heard that he was Swedish and that he was a keen photographer and had an expensive camera with him. Well…he turned out to be Dutch! So now, I have Dutch Luke to go with Dutch Matt. With John from the Lancashire Three, I only need a Mark to complete the four Evangelists! The bit about the camera was right though. 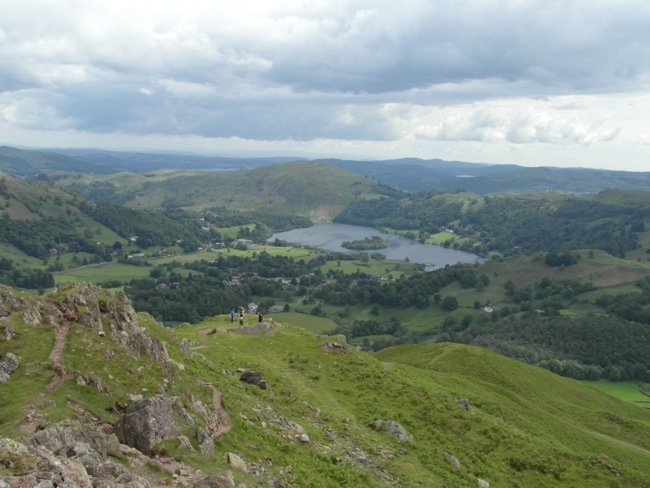 As we climbed higher, there were some lovely views back towards Grasmere. 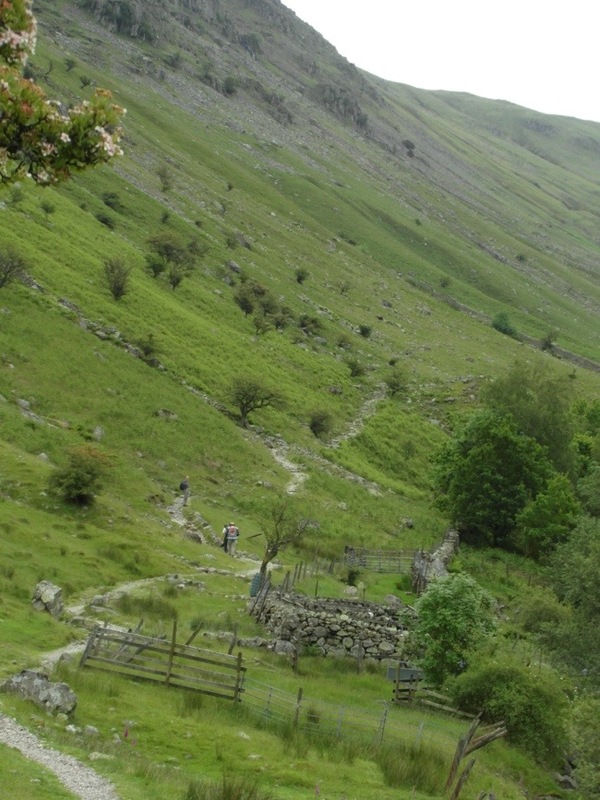 We took the higher Little Tongue Gill route up the fell. 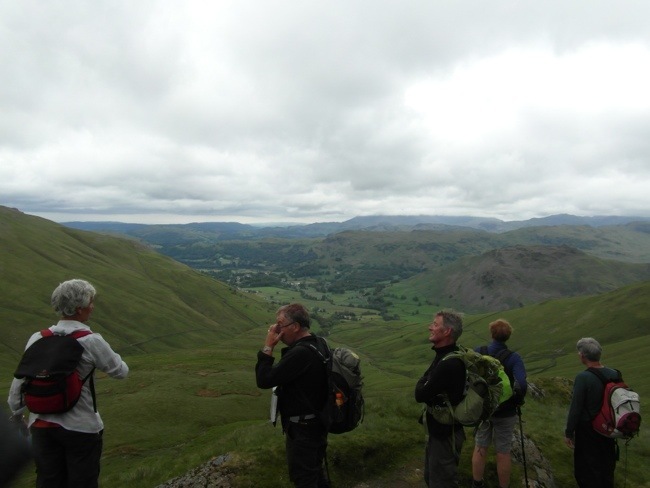 John, Chris, Pat (The Lancashire Three) and Dutch Mat admiring the view. Once again, there were lovely waterfalls to admire. 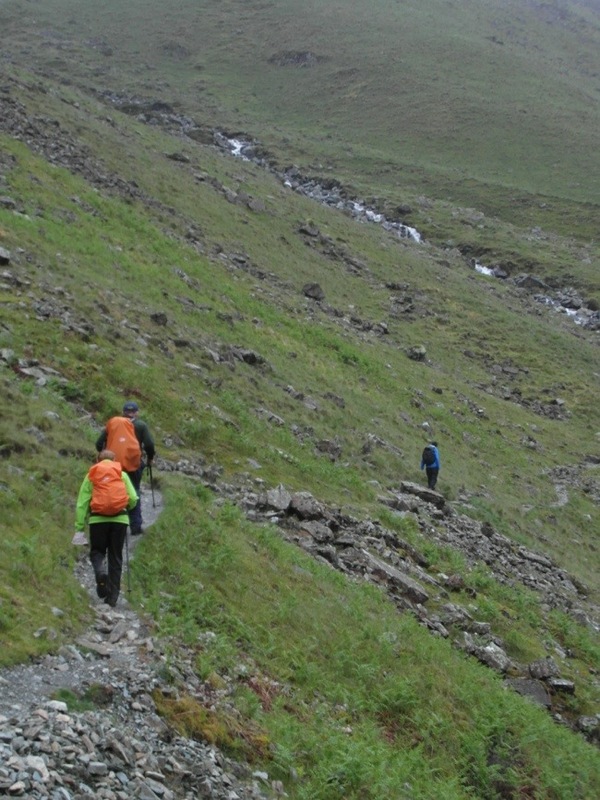 Heading ever upwards towards Grisedale Tarn. I chatted to the Lancashire Three and they told me that they had had more cake when they got to their guesthouse in Grasmere (after I had seen them outside the team room). I joked with them that I needed to get the cake theme into their “handle”. John helpfully suggested “The Cake-to-Cakers”. Perfect! 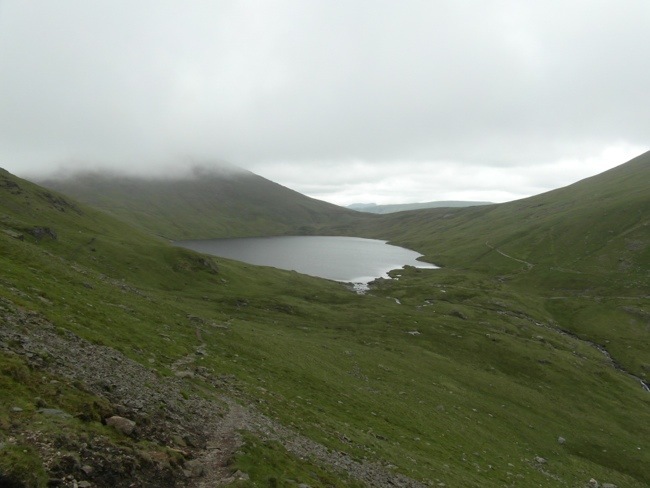 And there ahead of us was the beautiful Grisedale Tarn. Even on a grey day like this, still set like jewel among the mountains. We made our way to the end of the tarn, and photos were taken both of tarn and of each other. Here, another decision was needed. 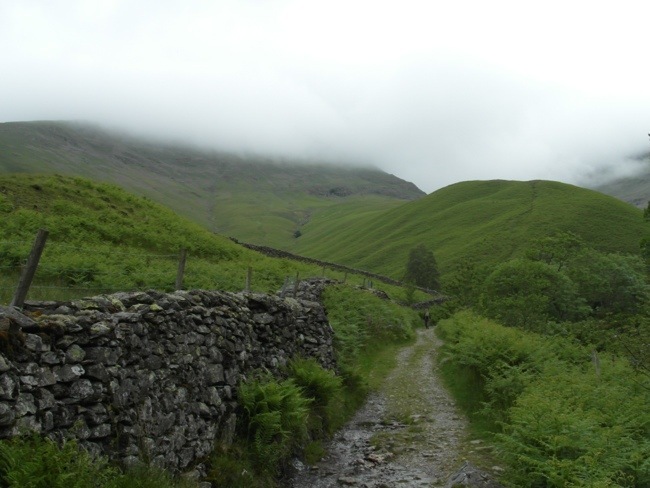 The most direct route is straight down Grisedale to Patterdale, a relatively easy descent that would have had me down in Patterdale by late lunchtime. 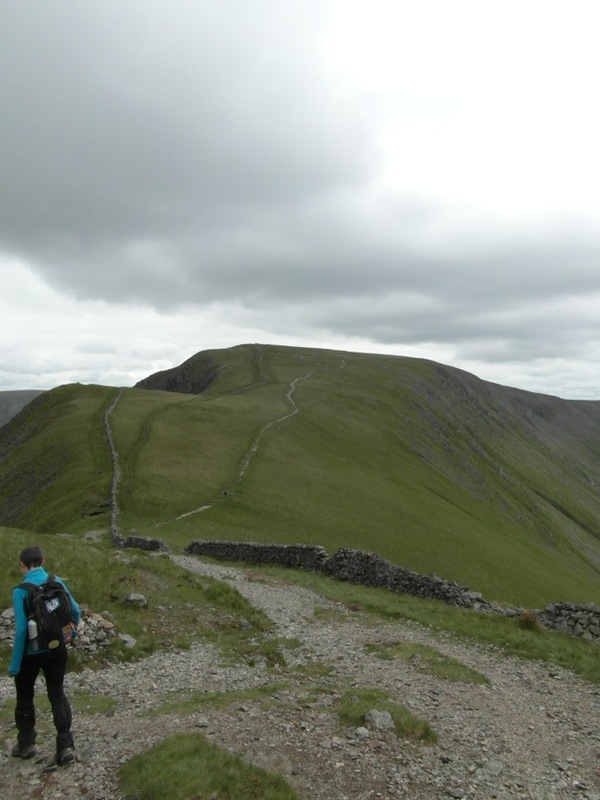 the other option: to do one of the two alternative high level routes that Wainwright recommends – either Helvellyn, which I have climbed several times or St Sunday Crag – which I have never climbed. The latter won out. Why, you might ask? 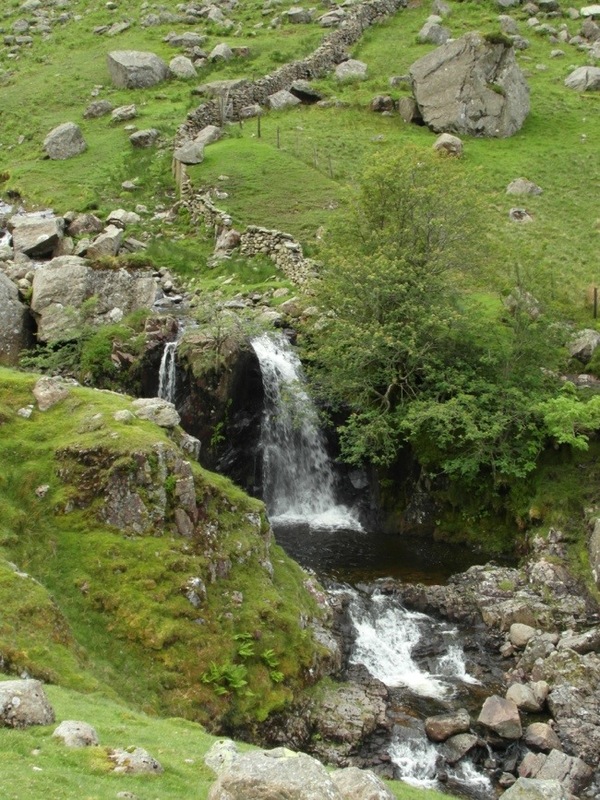 Well, I am trying to climb all 214 Fells that Wainwright includes in his 7 pictorial guides to the Lakeland fells. 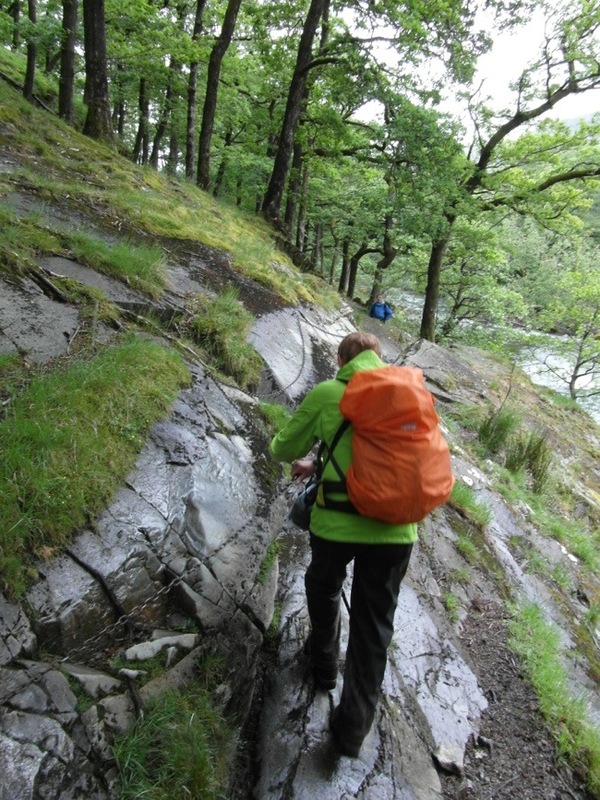 This is called “bagging the Wainwrights”. I only started to think seriously about completing them over the past couple of years. So far have have climbed about 90. (Note to self: Shaun, are you taking this bagging thing seriously enough, if you don’t even know exactly how many you have done)?! Anyway, St Sunday Crag was calling. 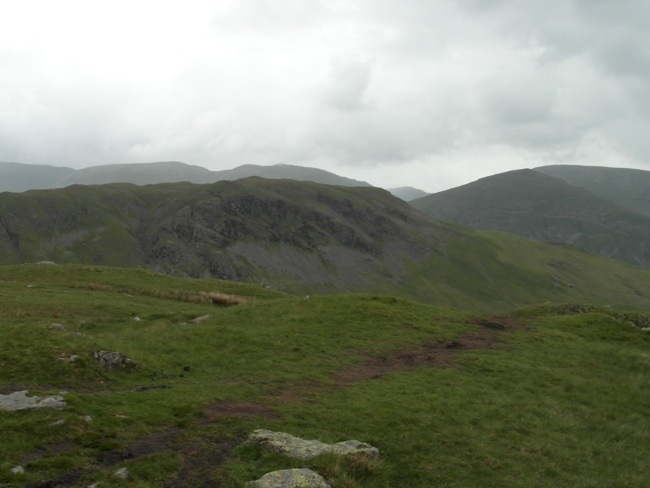 The Lancashire Three and Dutch Mat decided on the more direct route down via Grisedale. My route headed off and up to the right. With telephoto on max, I was able to get this close up of the Lancashire Cake-to-Cakers heading down. 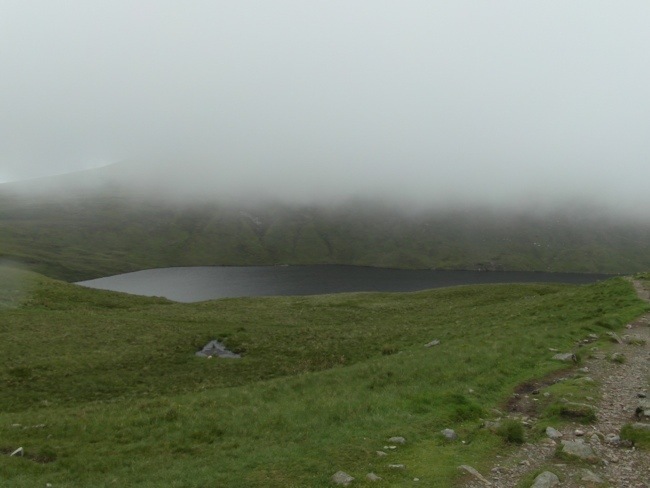 I had some lovely views back down to the tarn as I climbed. 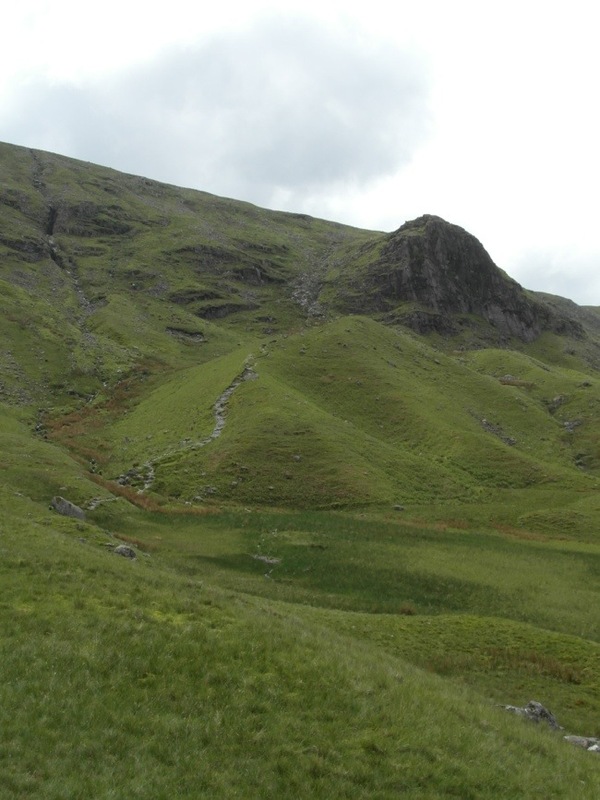 Eventually my path brought me to the ridge that joins St Sunday Crag with Fairfield. 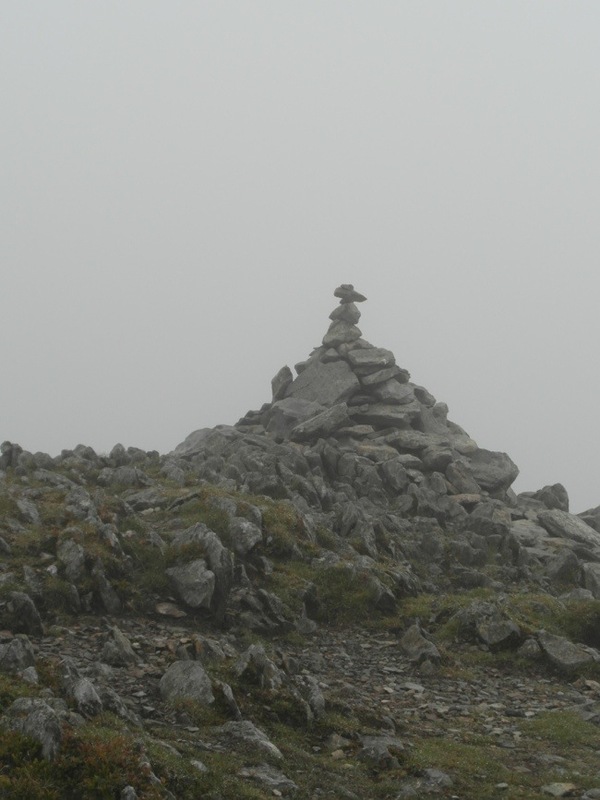 By now I was engulfed in mist all the way to the summit, which was marked by a small precarious-looking cairn. I stopped for lunch here. It was chilly, so the wooly hat and gloves went on. There were a few other people at the summit, but none of them were C2Cers. Beautiful views of Ullswater opened up before me on the way down to Patterdale. On reaching the road I met a new couple of American C2Cers I hadnt met before, Kurt and..I wish I could remember the lady’s name. We talked about the people we had met. They too had met Manhattan Pete on Day Two. Further on I ran into Dave and Barbara, who told me that Pete had done the same route as me and was now in the White Lion tucking into a plate of fish and chips! My accommodation tonight is rather special, I am staying at Old Water View where Wainwright always stayed when in Patterdale, including when researching the C2C. You can see his name below, in the, now framed, Guest book. I always knew that today was going to be a bitter-sweet kind of day. 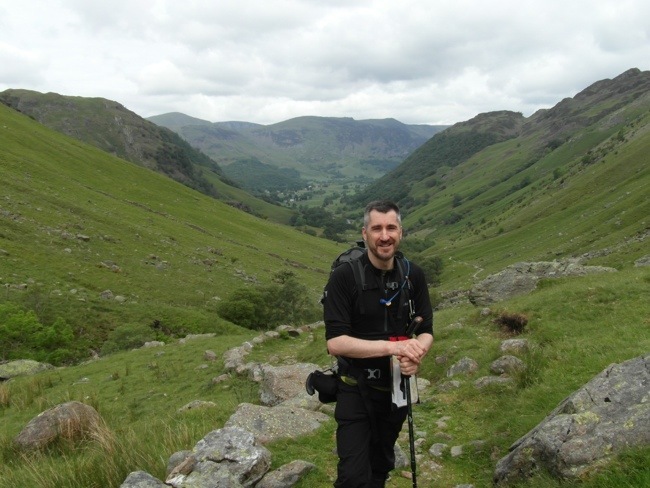 Sweet, because I would be walking in my favourite part of the Lake District – the Far Eastern Fells, but bitter, because by the end of the day I knew that I would have left my beloved Lake District behind, and the most beautiful and challenging walking with it. I woke up for the first time to see some blue sky and sunshine, and although it clouded up during the day, the cloud remained above the fells and the sun came out from time to time. It was by far the best weather up to this point. After breakfast I set off on the trail. The first section I knew very well, as I have walked many times on different fell walks in the area. 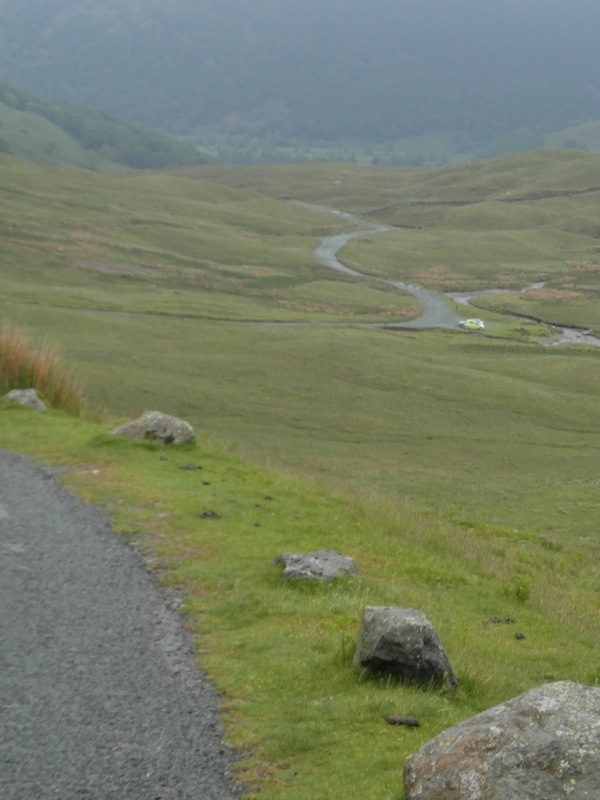 The first section was a fairly steep climb up to Boredale Hause. I met a couple of C2Cers who started on the same day as me, but I hadn’t met before, but there was no sign initially of the usual gang. 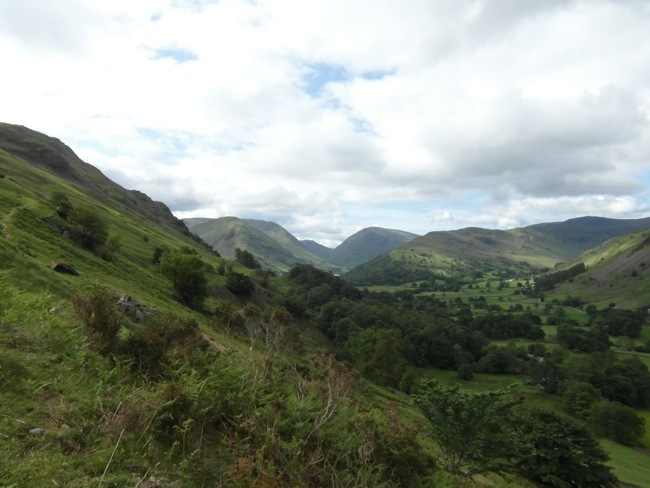 There were beautiful views over the Patterdale valley. 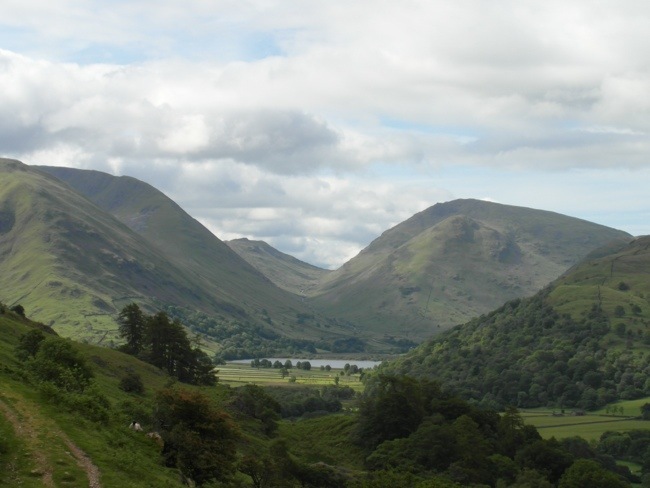 Looking up the valley to Brotherswater. Looking the other way towards Ullswater. The white house that you can see to the left of centre is the place where I first fell in love with the Lake District. 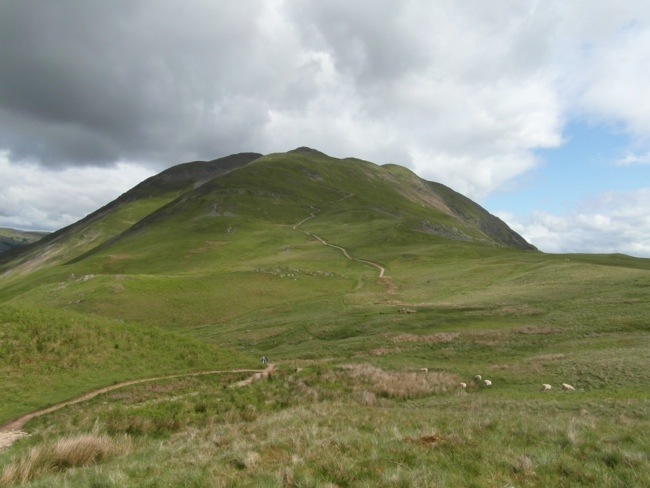 As you may have read in my initial blog, I stayed there two years running as a teenager and walked the surrounding fells with members of the church youth group. 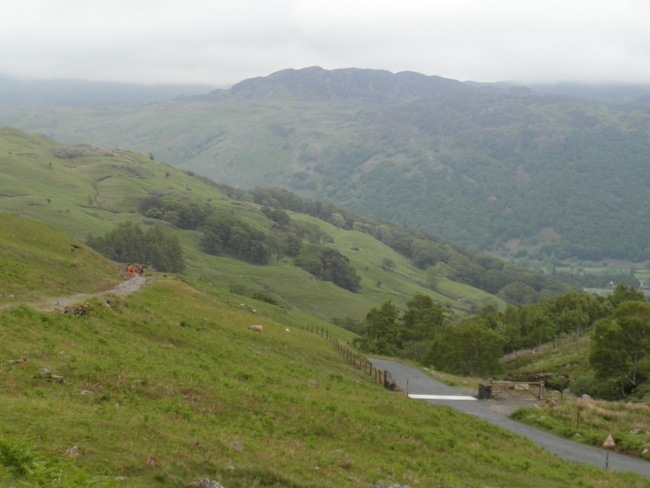 You can see the road going up over Kirkstone Pass in the centre of the photo. 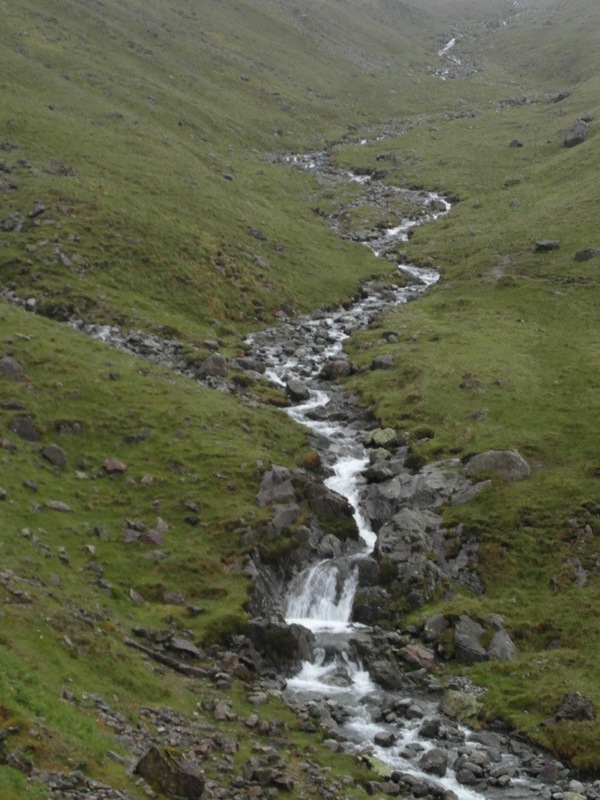 pass that connects several valley and fells. My path veered off to the right. Place Fell. 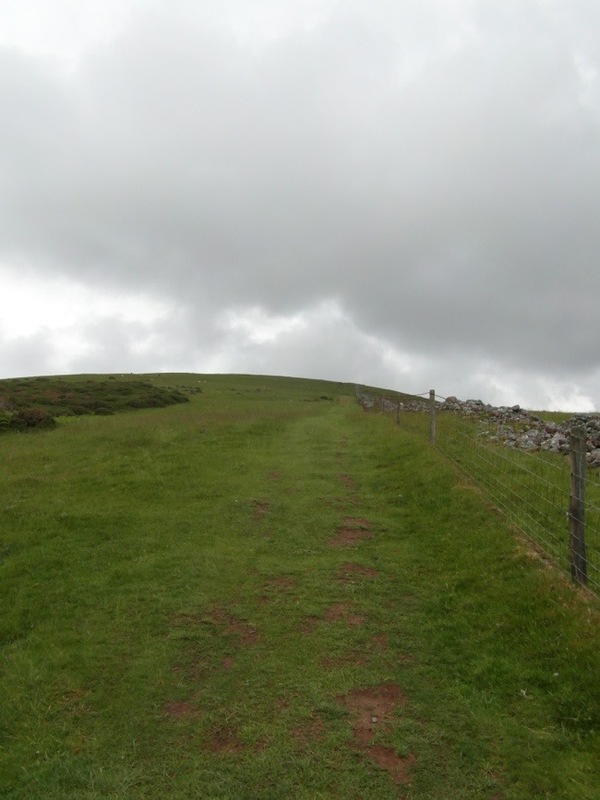 I have climb this beautiful fell twice before, but today I am heading in the opposite direction. A short way along this path I see some walkers up ahead, and I am delighted to see that it is the Cake to Cakers and Manhattan Pete. We walk on together and soon this beautiful view comes into sight. 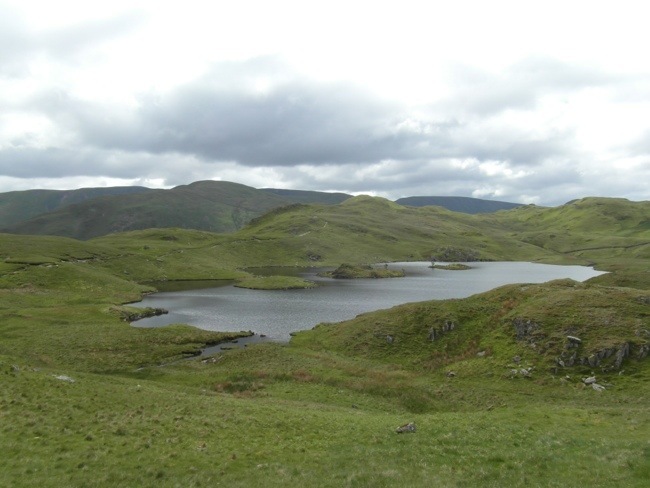 It is Angle Tarn, which has to be one of my favourite Lakeland tarns. It is such a tranquil place. 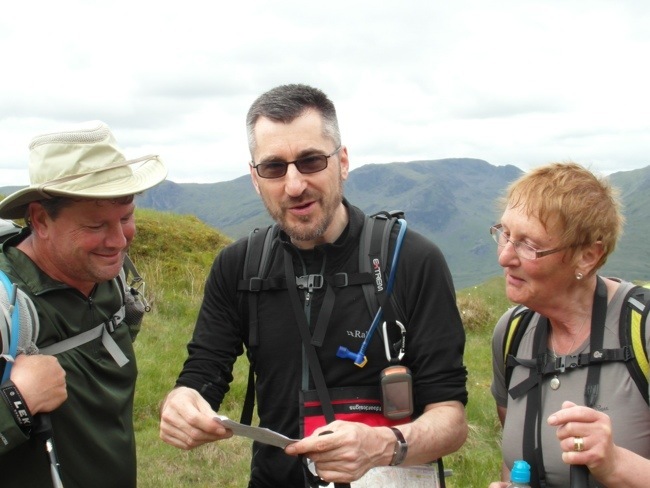 Pat thought it would be nice to have a photo of us consulting the map. Of course, it doesn’t looked staged at all, does it! Shortly after this we reached Satura Crags. Here we were passed by Sanda and Mick, a couple from south Yorkshire, who had been staying at the same B&B as me. This was their second C2C. They headed on, and as can sometime happen, we followed them, chatting happily among ourselves, until we noticed our path down below us, while we were heading up. Sandra and Mick were heading up to Rest Dodd. We diverted down to the correct path and carried on. Some time later we saw Mick and Sandra now coming up the path behind us. They were easy to spot because they were wearing identical hats and shirts. As they reached us they readily admitted they had taken the wrong path, but had had the compensation of seeing some deer. Rest Dodd, which we almost climbed by mistake and which we would have had to climb down too. Some lovely views were opening up back over the western fells behind us. 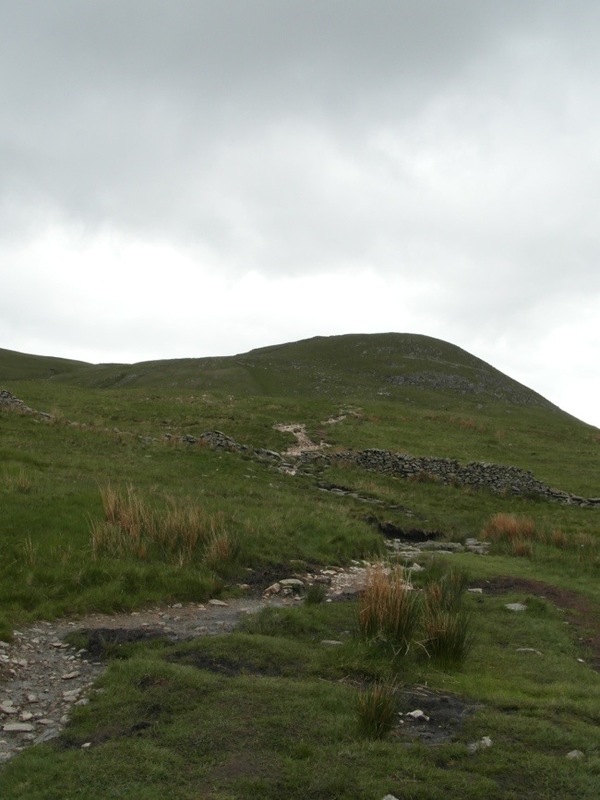 Our path continued up to the left of The Knott. 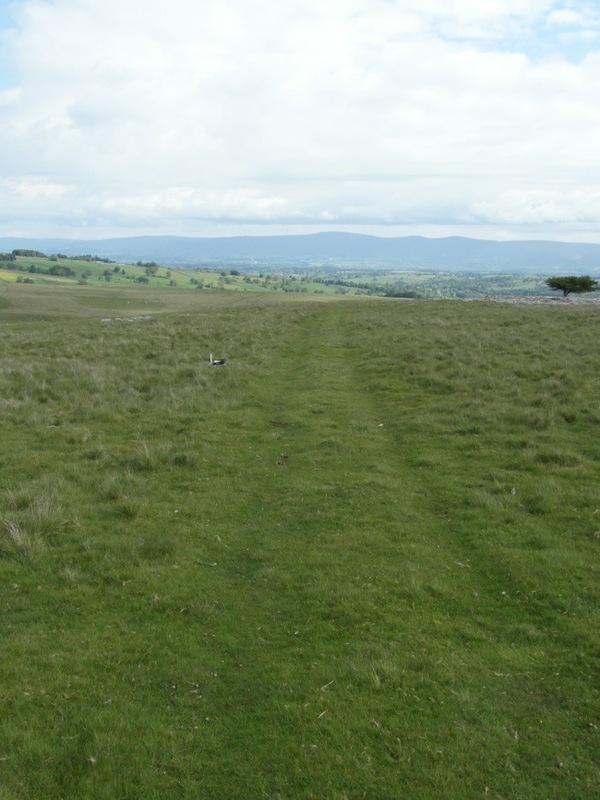 Once we rounded The Knott, we saw the magnificent bulk of High Street, with its Roman Road clearly visible. 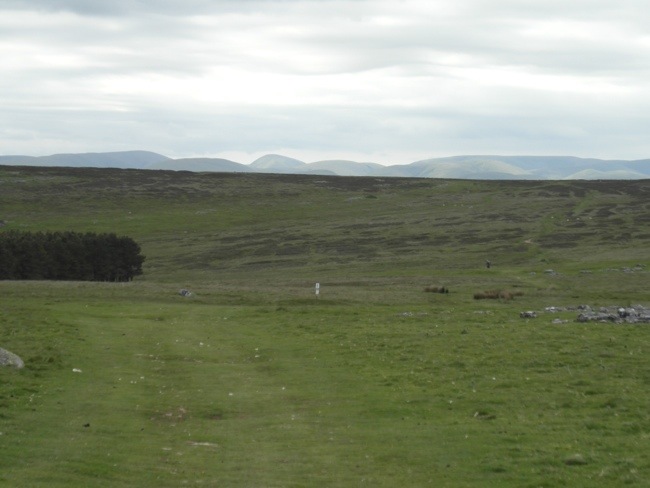 It is amazing to think that 2000 years ago Roman Legionnaires marched across these fells. But our path headed off to the left to where you see Pat heading. Now I faced another big decision. 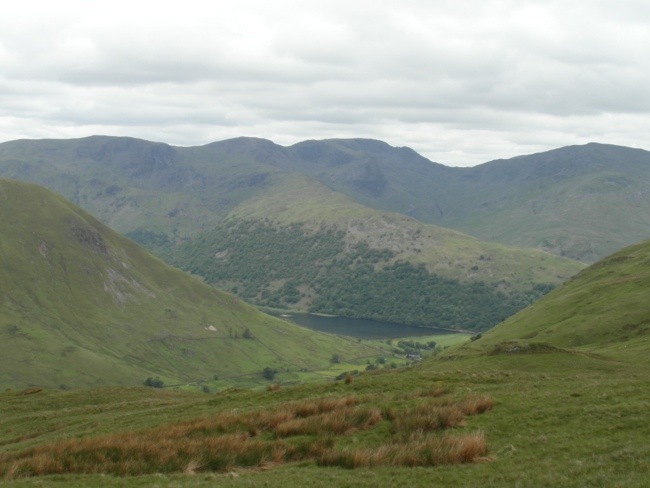 The owner of the B&B where I stayed last night had suggested an alternative (in his view) better descent to Haweswater than the one Wainwright suggests. 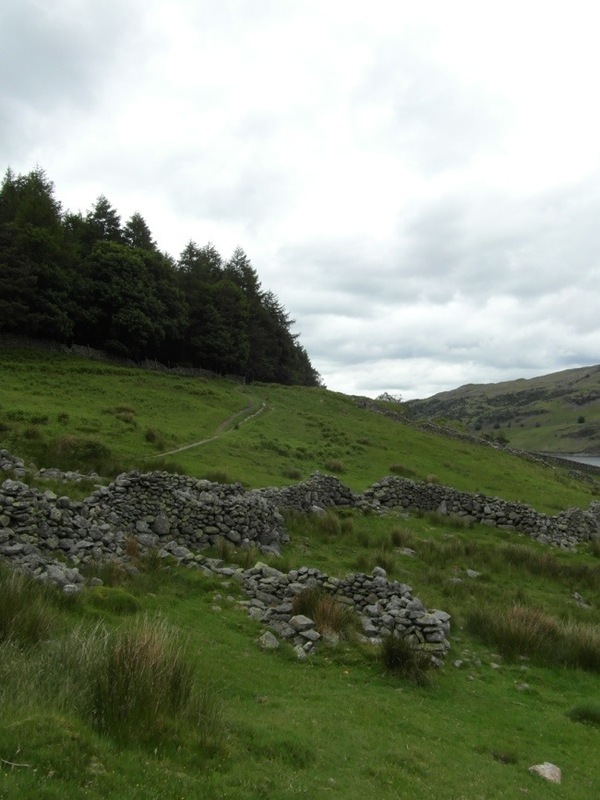 This alternative was to go up to High Raise and on to Wether Hill and descend from there on a path to the far end of Haweswater. 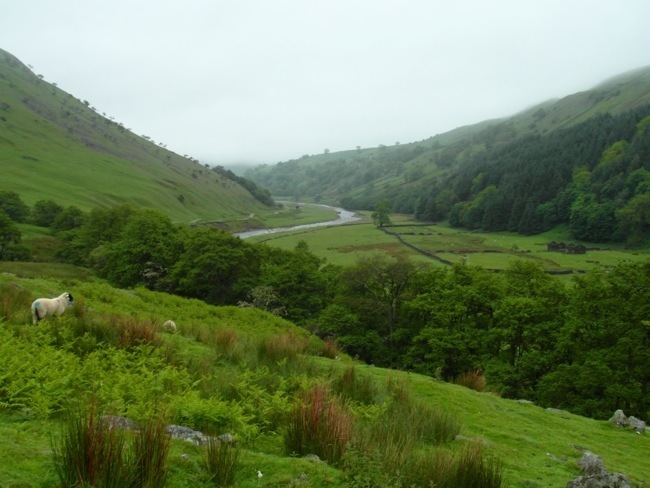 The benefit of this route would be to cut out the steep descent from Kidsty Pike and the up and down stretch along the bank of Haweswater resevoir. 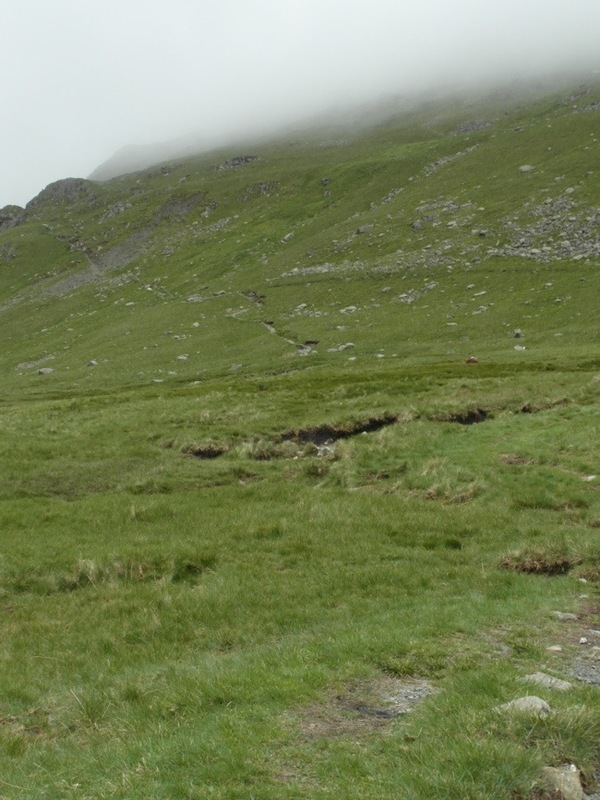 Sandra and Mick had decided to try this route, and I was contemplating it, but in the end, I decided to stick to the official route with the rest of my little troupe of walkers. You will have to read to the end to find out what happened to Mick and Sandra. 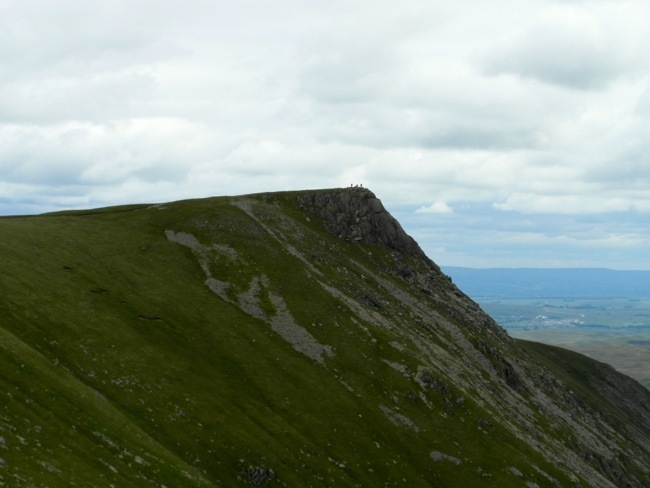 Soon the dramatic summit of Kidsty Pike came into view. 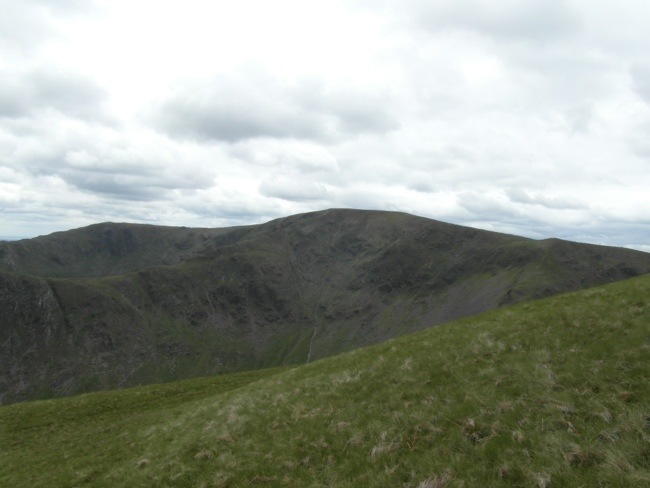 This is the highest peak in the whole of the normal route of the C2C at 2559 ft (though I had actually been higher yesterday because of the ascent on the alternative route up St Sunday Crag at 2759 ft). We could see some people were already there, and it turned out to be the Australians: David and Sandra and Bernard. 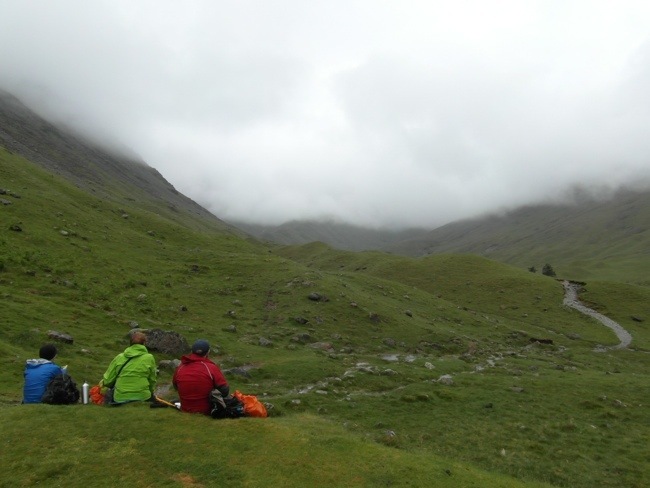 This being such a significant part of the walk, we stopped for lunch, during which the midges tried to eat us! There were lovely views all around. Down to Haweswater reservoir ahead of us. Notice how the country ahead of us is a lot less mountainous. You can see The Pennines in the far distance. These I will cross later in the week. 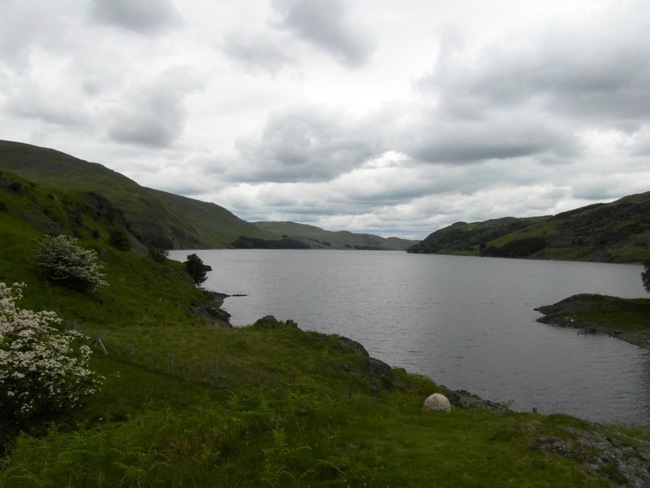 Then we headed down to Haweswater. It was steep, but not as bad as expected. 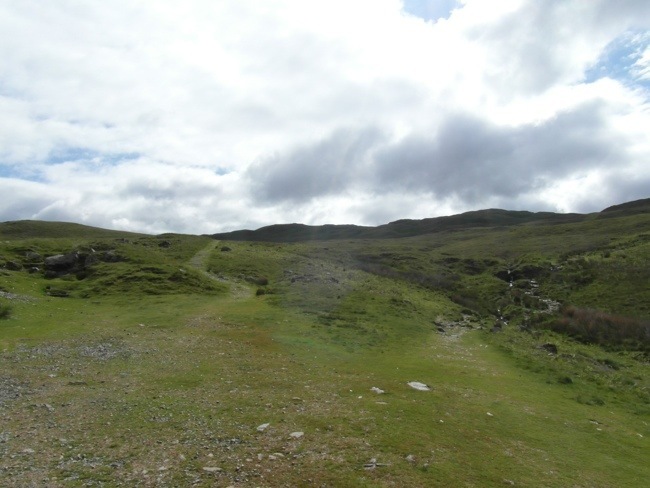 About a third of the way down, we heard the sound of planes, not the fast RAF jets that are a regular feature in the Lakes but two RAF training planes which flew in low over the fells and banked dramatically over Rough Crag towards Blea Water. Sadly, they were gone before I could get my camera out. 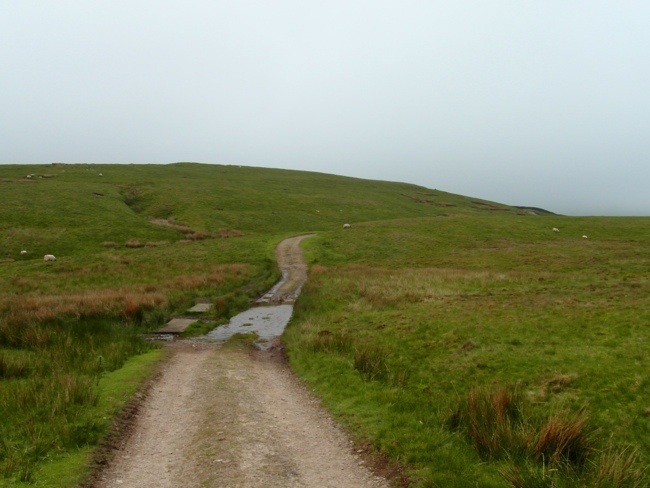 Eventually we reached the foot of the fell, and the next stage of the walk began. An hour and half march along the banks of the resevoir, but never very close to its shore. Hmmm..I wonder if anyone would mind if we borrowed this?? 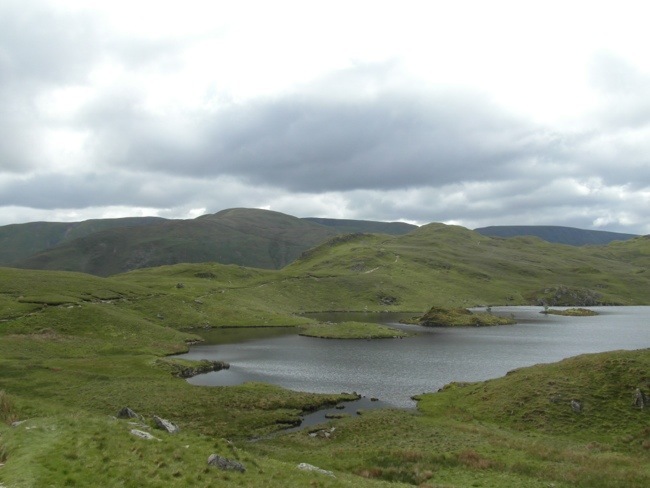 Once we reached the end of Haweswater the scenery really changed. Now we really knew we were leaving the Lake District. At Burnbanks Pete and I said goodbye to John, Chris and Pat, because they were following a different schedule. 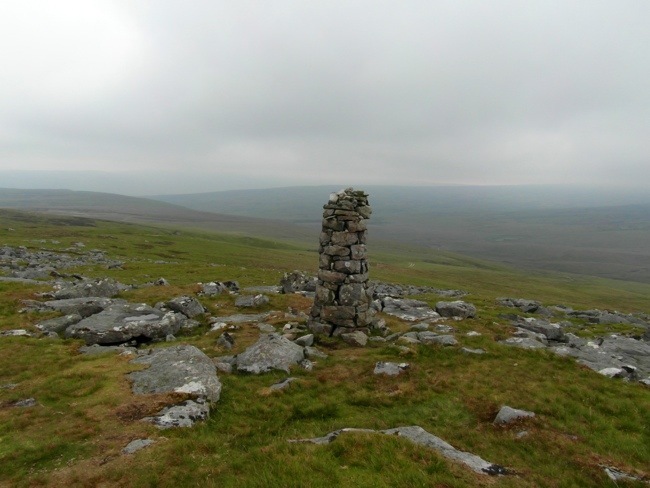 Like me, they would be staying in Shap, but walking no further today, as they would tomorrow be walking from Burbanks to Orton, a much shorter day than I have in store. The owner of the place they would be staying would come and collect them and drive them to Shap. 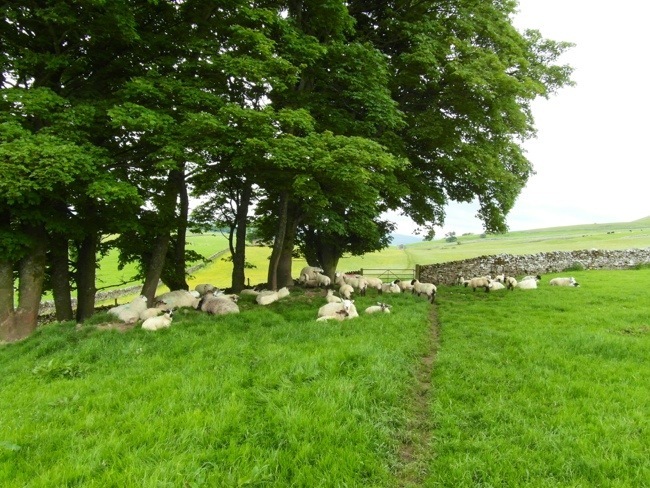 We all arranged to meet for a final supper in Shap later that eveing. Peter and I pressed on. 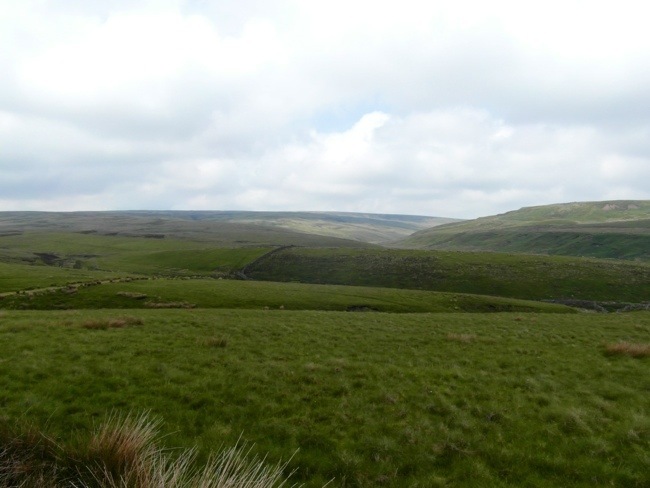 It was about 4pm, but we still had another two hours of walking before we would reach Shap. The scenery was very different now. 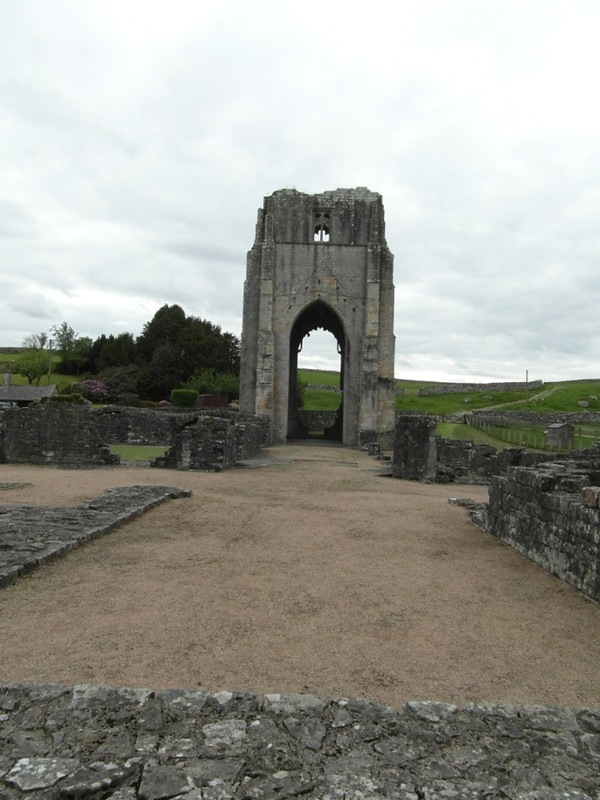 The final highlight was the beautiful ruins of Shap Abbey, built in the 13th Century and dissolved by Henry VIII in 1540. 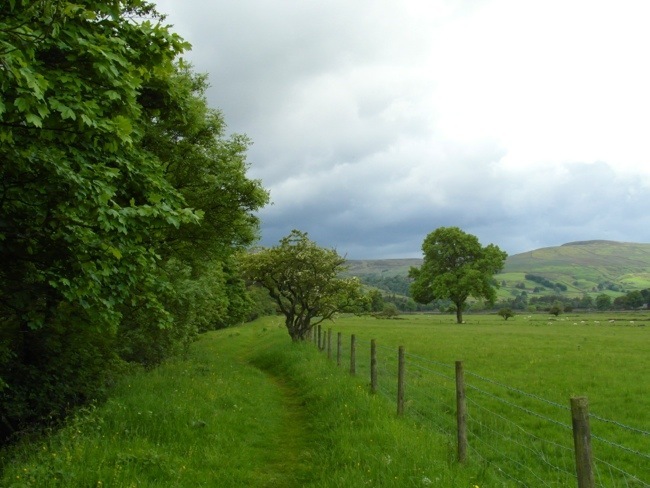 A walk through a few more fields brought us to the outskirts of Shap. We had been walking for nine hours, with only a 20 minute break for lunch. Both Pete and I were pretty tired as we staggered into Shap. After a shower, I joined John, Chris, Pat, Pete, Luke and Bernard in the pub for meal. I won’t get to walk with them anymore, because they are on a more leisurely itinerary than me tomorrow, and I will always be a day ahead of them from now on. It has been wonderful walking with them all. 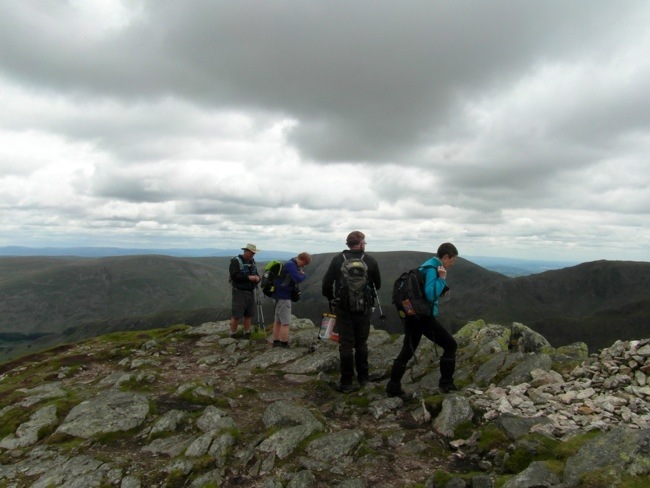 They are really great people, we have had great fun, good walking and lots of laughs. I will miss them. So, the Lake District is now behind me, and I have completed the first third of the walk. 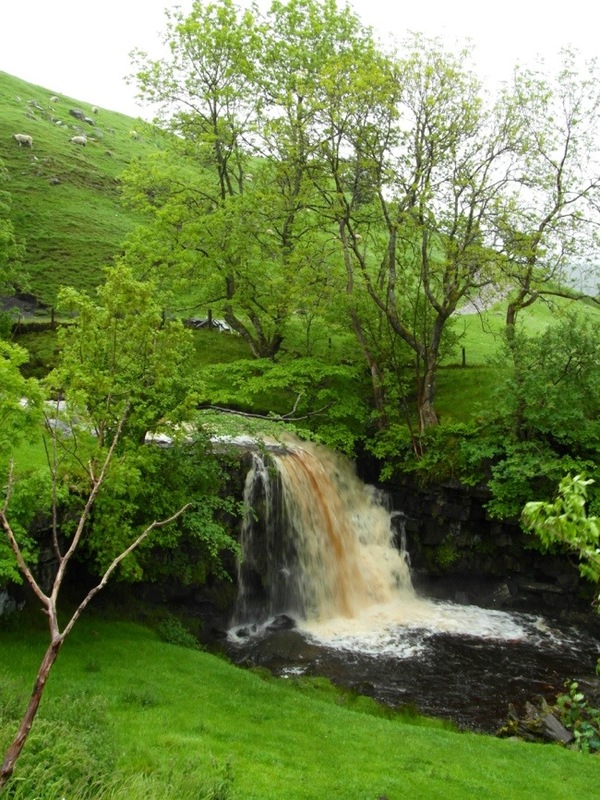 Now I enter the middle third as I approach the Yorkshire Dales. There will be no scenery ahead as dramatic and stunning as the Lakes, but from this point on, until I reach Robin Hood’s Bay, everything will be new to me. I am sure there will be much of interest and beauty to see in the coming days. In the end, the Lakes were kind to us. I only got one real soaking, in the last hour of the first day. It could have been much worse! In the pub, John told me that they had met Mick and Sandra in a pub in Bampton. 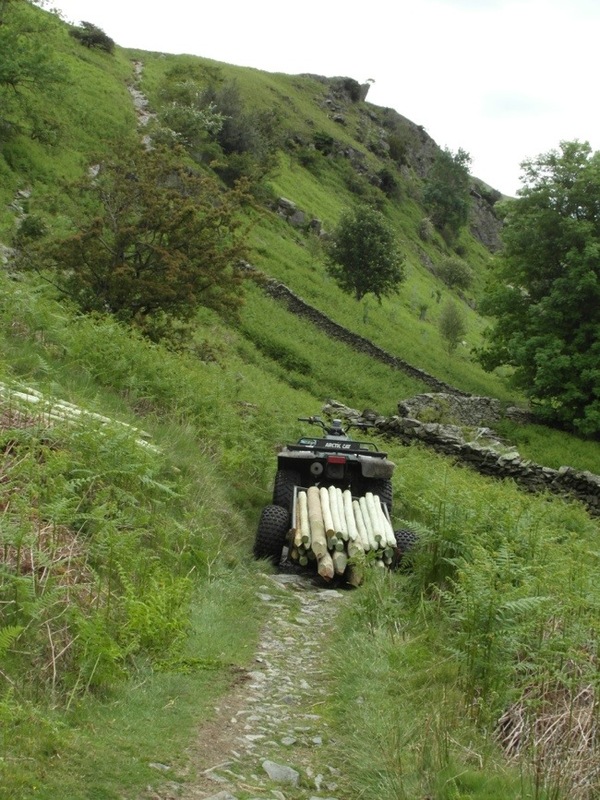 They had been unable to find the alternative route down to Haweswater and had to come off the fells via Bampton. They were contemplating getting a taxi to Shap. I’m glad that I stuck to the Kidsty Pike route. I would have been gutted if the same thing had happened to me! At breakfast today I saw a familiar face, it was Dutch Matthew. You may remember that he is doing the C2C in a rather unorthodox way. 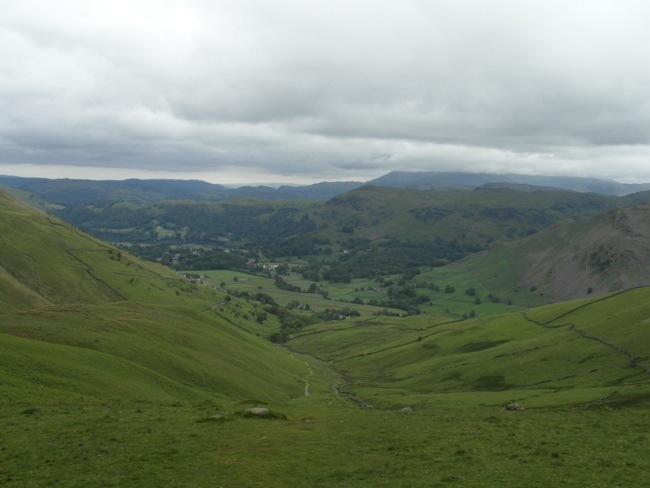 So, today, he had to catch two buses to take him back to Patterdale, where he would do the 16 mile walk I did yesterday. 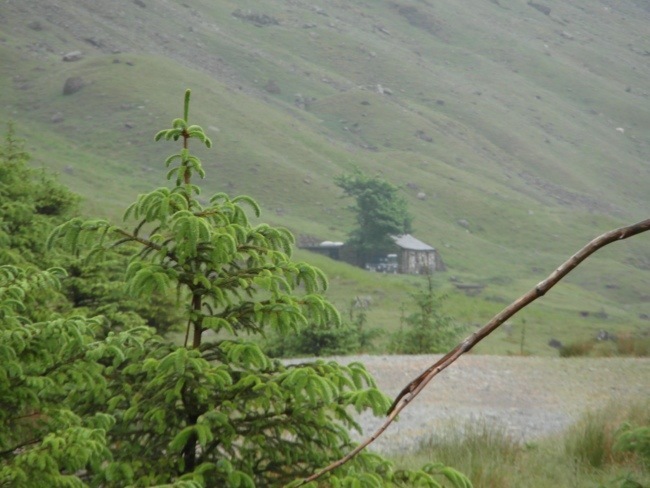 I worked out that he would not get back to Patterdale until about 10am. That would mean that he probably won’t get back to Shap until about 9pm. I tried very gently to suggest that this might be too much, but he was very insistent. I admire his courage and tenacity. I hope he is OK. There was also a English couple at breakfast, Perry and Angie, who were walking the C2C with their dog. Unfortunately, the dog was suffering somewhat and had a sore poor. Perry said that they might have to carry her in the rucksack part of the way. 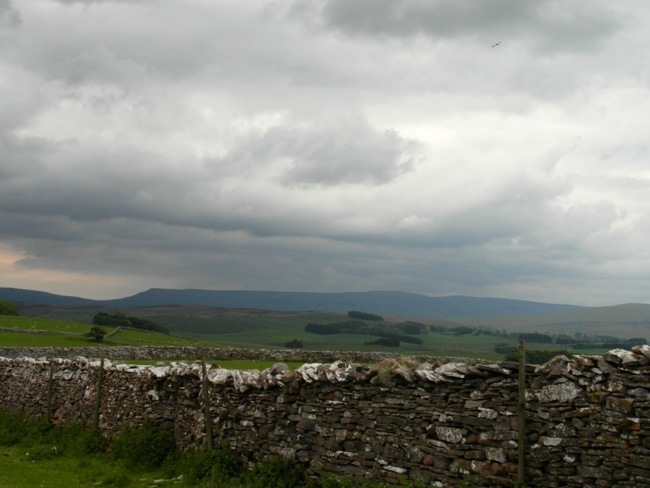 As I walked along Shap’s sole major road, a passing car hooted me. I’m not altogether sure, but I think it must have been the cake2cakers, who, being driven back to Burbanks to pick up the walk where they stopped yesterday, spotted me and got the driver to hoot. It wasnt long beofe I was out of Shap, and soon I came to my first obstacle. This cow was looking at me with very menacing eyes. I think it was because her calf was nearby. I didnt take the photo til I was safely on the other side of the stile. The next obstacle, I could hear long before I could see it. It was the M6 motorway. 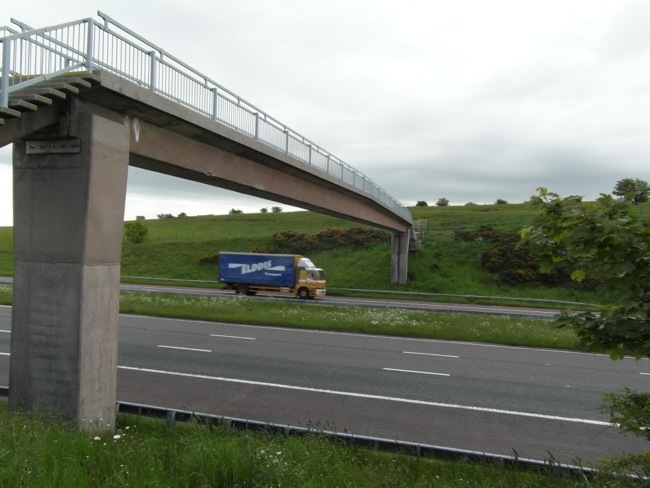 The first of three arterial roads to be crossed during the C2C. This one was easy because of the footbridge. From the bridge there was a final lookback to the the Lakes. 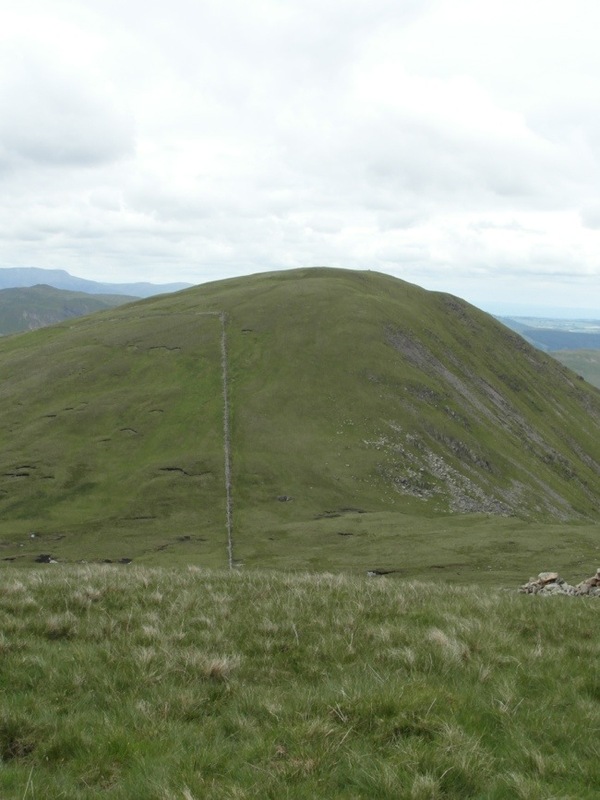 In the middle of the picture you can see the pyramid shape point of Kidsty Pike, the high point of yesterday’s walk, just to the right of the telegraph pole. Some new friends I made. 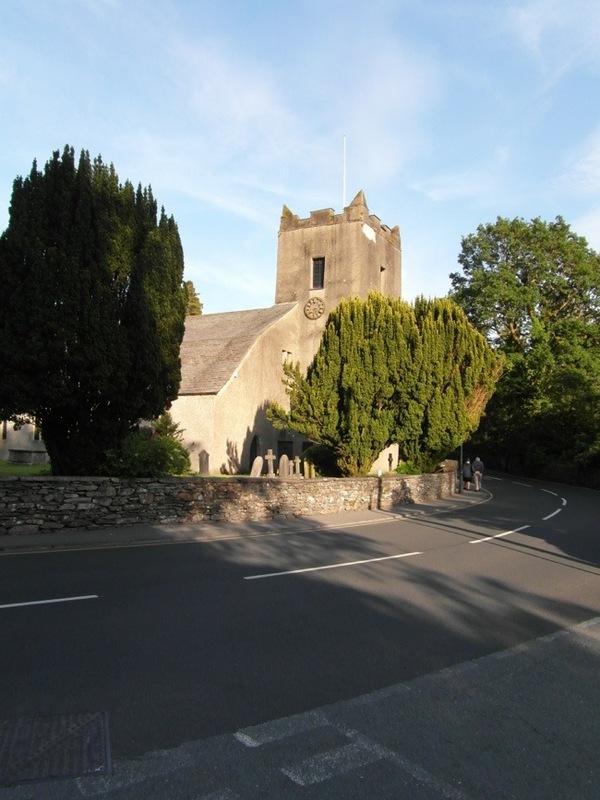 I pressed on past a working quarry and down a quiet road to the tiny secluded hamlet of Oddendale, which I skirted around. 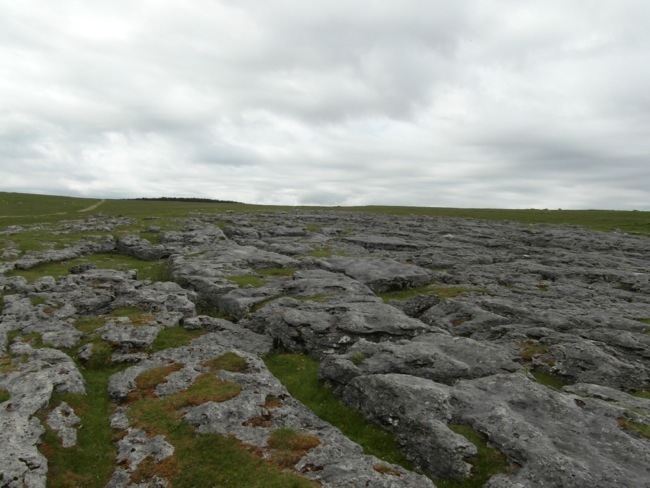 Near here I saw the first of many limestone pavements. These are natural geological features. 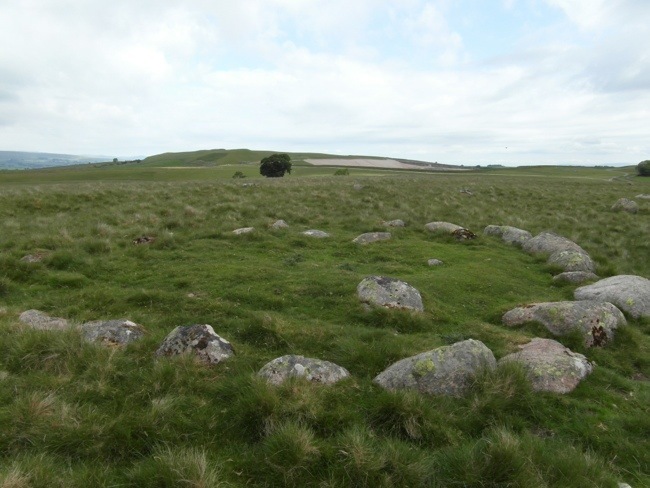 The guide book and the map showed that the Oddnedale stone circle was nearby. I would never have found it without using my GPS walkers satnav. It led me right to the spot. To my left were the Pennines in the far distance. 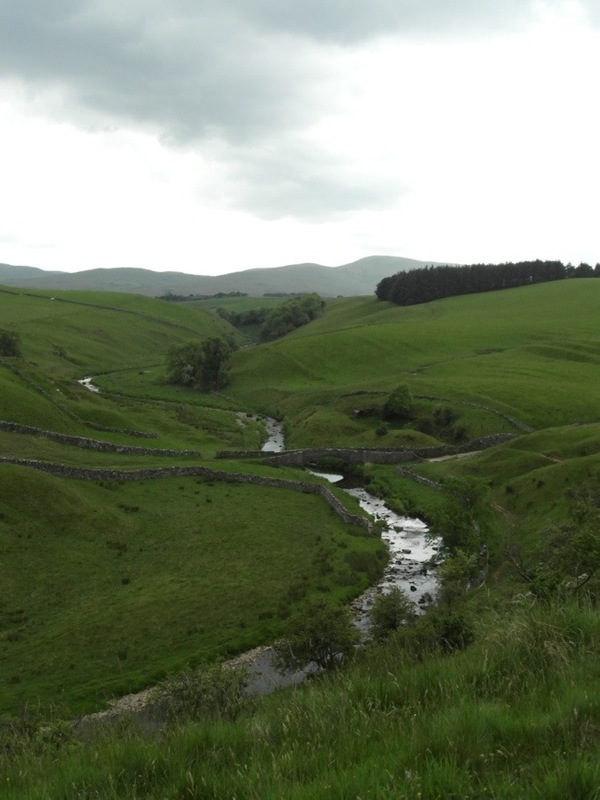 Ahead were the Howgills, though I would be turning east long before reaching them. I looked back and was surprised to see some blue sky. It lasted on and off for much of the morning. 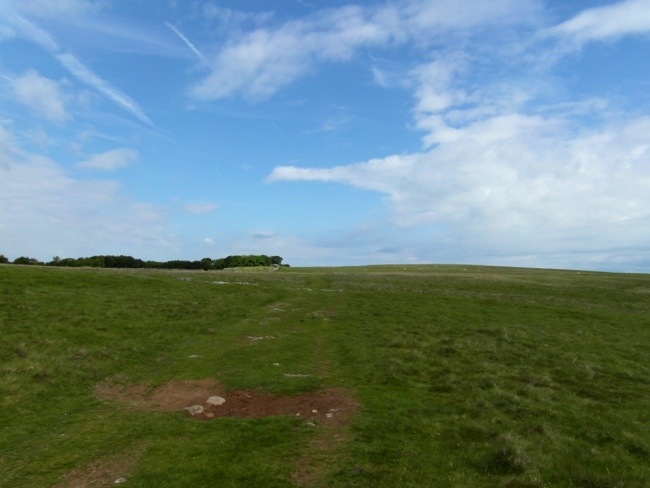 The guide book and the map assured me that this grassy track was once a Roman road. 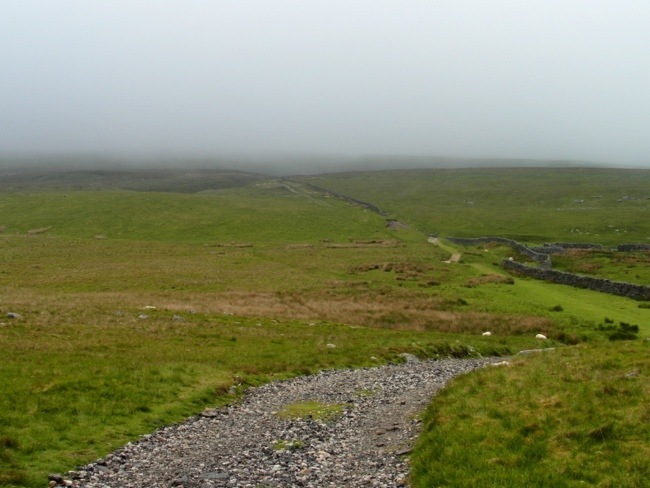 Apparently, the first known Roman road between London and Scotland. I could see a solo walker and a pair of walkers up ahead, but they were too far on for me to see if I recognised them. This lonely boulder was a remnant of the last ice age, left here by a glacier. This was lonely, strangely deserted country. It felt very different from the Lake District, but it had a special beauty and serenity of its own. After quite a bit more walking I was faced with my next dilemna: namely, whether or not to go into Orton, with its shops and facilities, and most significantly it’s chocolate factory and chocolate shop – or to take the alternative route that by-passed the village. It decided on the later course; after all, I did have a Mars bar in my backpack waiting to be consumed at lunchtime (other chociolate bars are available). This is a good moment to thank Yvonne, one of my parishioners, who generously provided me with 13 Mars bars, one for each day of the walk. 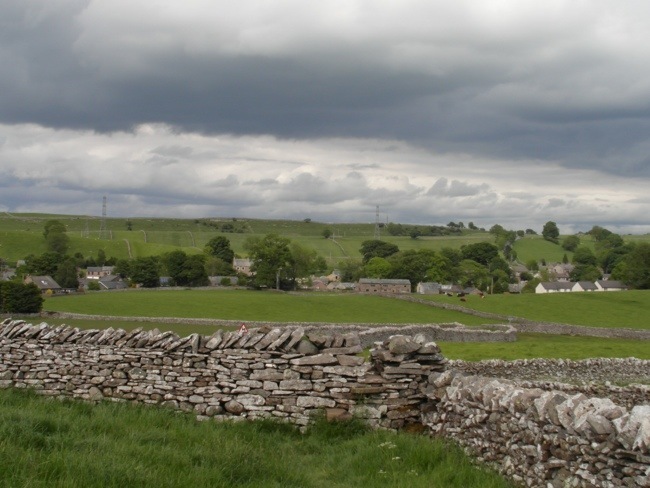 The Village of Orton tantalisingly close below. I could almost smell the chocolate! Shortly after this I passed this lime- burning kiln. The temptations were not yet over. But I bravely resisted and pressed on. Someone obviously doesn’t like moles. A little further on the map showed that there was another stone circle, more impressive than the earlier one. I photographed it from the stile,…well, it was hardly Stonehenge. I passed through this field of wild flowers. I passed these sheep and lambs without disturbing them at all. 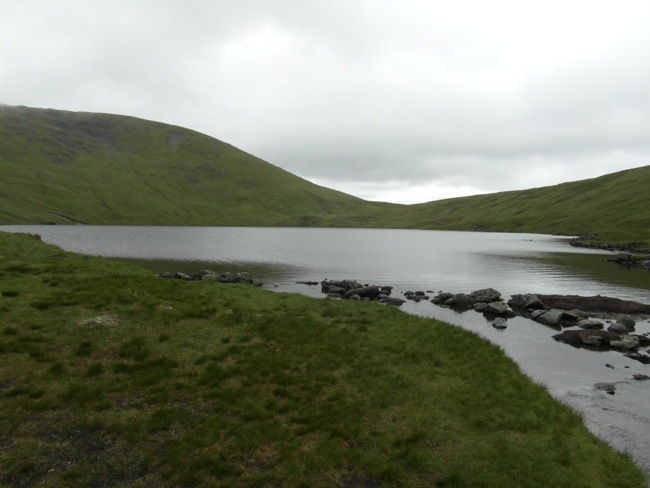 At Sunbiggin Tarn, I stopped for lunch. While I was there Dave and Pam from Berkshire came by. 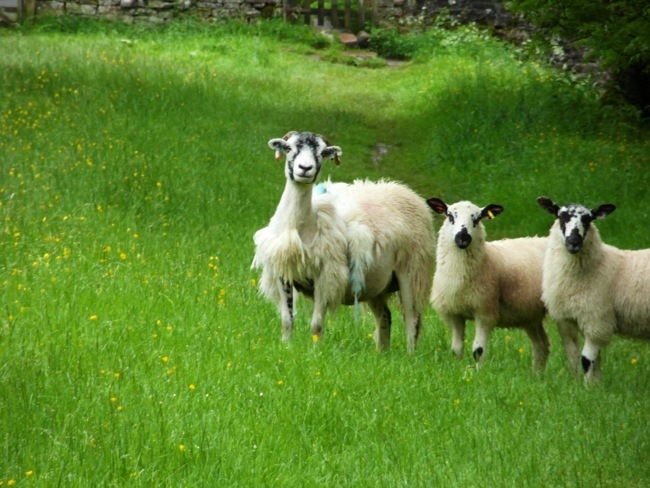 I had first met them on the path to Grasmere. They were the two I had seen ahead of me, but they had stopped at the ‘last refreshments’ place, as had Manhattan Pete, though he had headed back to Orton, where he was stopping for the night. Pam and Dave found another spot to have their lunch. 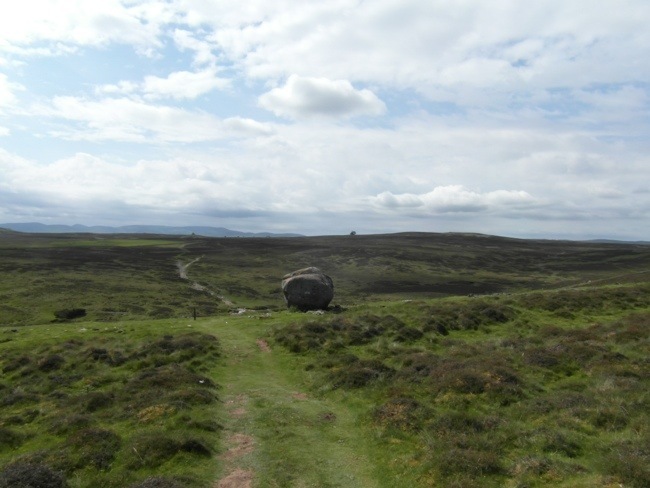 Having allowed myself a half hour rest, I pressed on across the moor. 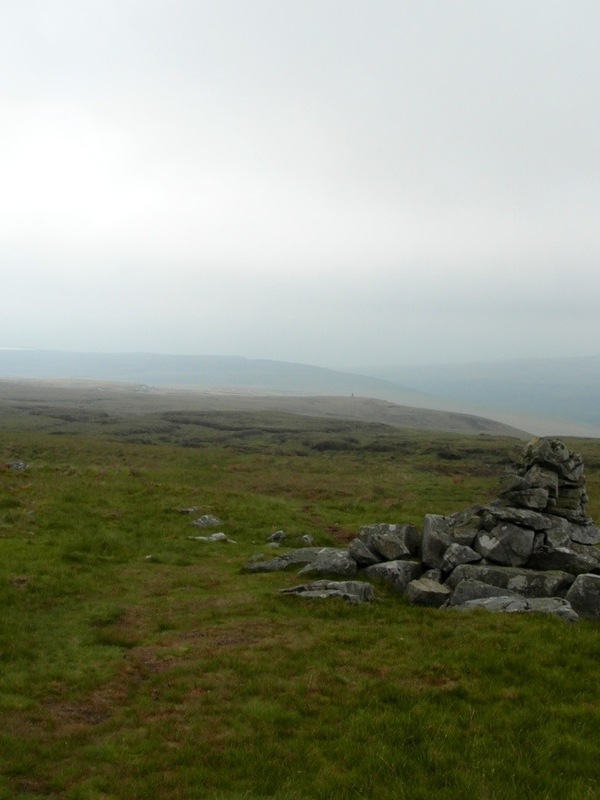 It was bleak and featureless, without the GPS I would surely have gone wrong. I thought I had probably left Pat and Dave far behind, but then suddenly they appeared off another path. Their guide book had taken them another way. It was shorter, hence them catching me up, but I had the soft turf of the moor to walk on, while they were mostly on road. We all walked on together. 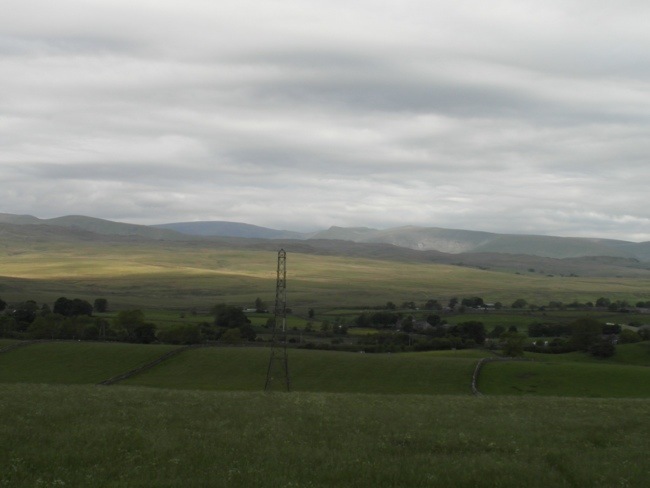 The Pennines, closer now, looking dark and brooding on the horizon. An old railway building by a disused railway. 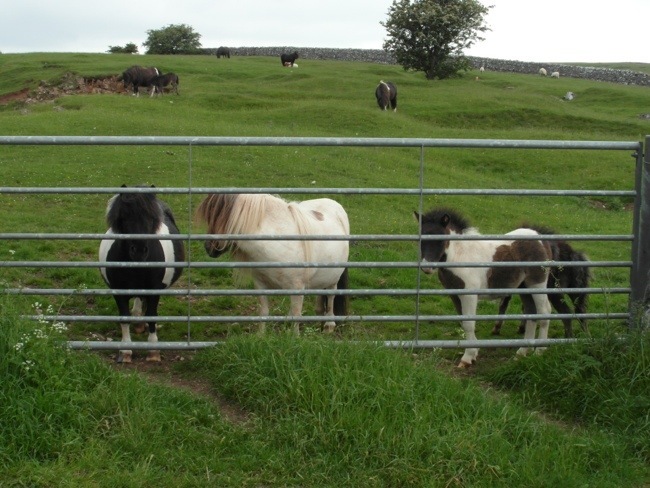 Getting closer to Kirkby Stephen ( the second r is not sounded) we pushed on, though we did stop to admire these cute little ponies and their foals. Later we had to pass a bull. Dave suggested I should take a photo for the blog, I prefer to keep moving! 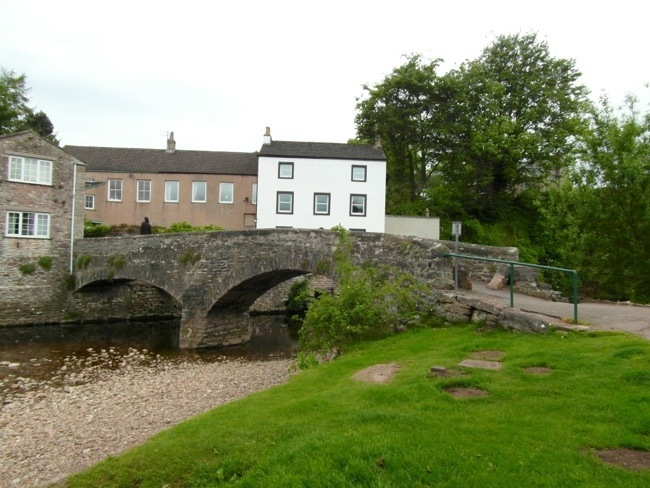 Finally, after 8 hours of walking, we arrived in Kirkby Stephen. We were all staying at the same B&B. 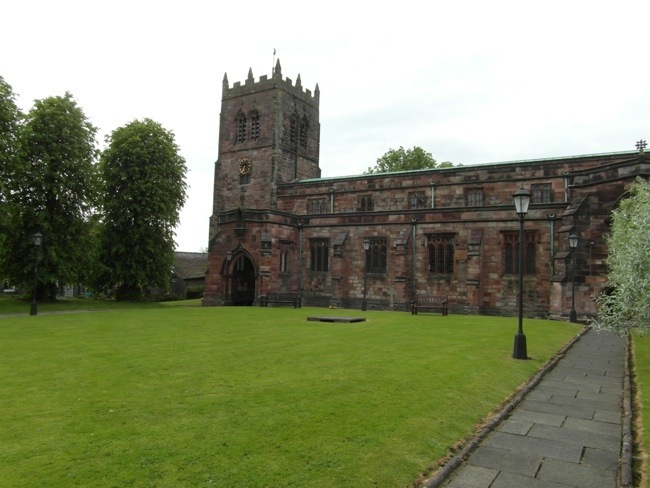 Kirkby Stephen church, which is used jointly by Roman Catholics and Anglicans. Two very hard days, 16 miles yesterday and 20 today, have taken a bit of a toll on me. My legs are aching tonight for the first time in the walk. Pam just told me that hers are the same. But more serious for me, is that a small blister on my right little toe has burst. I had it well plastered up, but I felt it go right near the end of the walk. When I examined it later it was a bit of a mess. I have done a repair job on it as best I could and wrapped it up protectively. Fortunately, there is a chemist here in the town, so I can go and get some advice tomorrow morning, but it is bound to be painful and I will have to take things a bit slower tomorrow. I have to confess this has been a bit of a blow to my high spirits and confidence. I thought I was doing so well with blister management. I will have to be extra careful about the other hotspots. 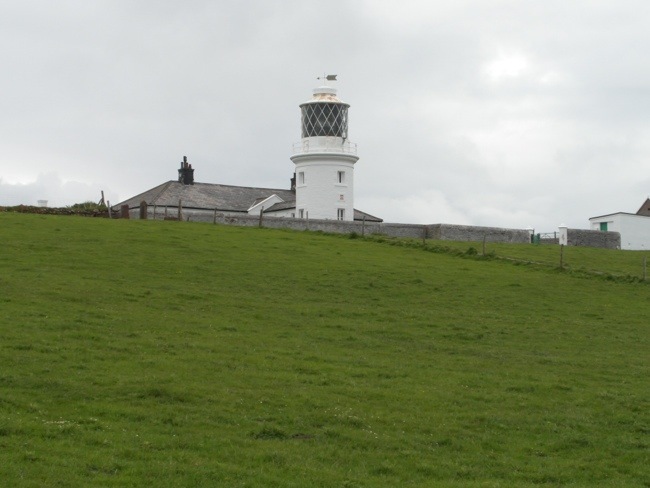 Whatever happens, I am pressing on – even if I have to hobble all the way to Robin Hood’s Bay. Well, you will remember that I went to bed last night somewhat concerned about the exploded blister on my right little toe. On examination in the morning it looked like the side of my toe had been blown away, which in a way I suppose it had. I cleaned it and carefully bound it up with a Compeed blister plaster. At breakfast, as well as Pam and Dave, there was New Zealand couple and a American lady, all doing the C2C. After breakfast I headed to the Chemist. They confirmed that the way I was treating the blister was the best way. I bought some more antiseptic wipes and some more Compeed plasters, as my supply was getting a bit low. I have been using them preventively. All of this set me back quite a bit, and when I set off after 9 am, I think all the C2Cers were long on the path, certainly I didnt see anyone until well into the afternoon. Because of the blister, I knew that I would have to take things a lot slower. Normally, I walk at a fair pace, but to protect my feet (the tendency with a blister is to favour it, which means ending up pressing more on other parts of the foot) I would need to go much slower. So I was glad that I didnt meet anyone early on, and I could just make a pace that was comfortable for me. I think that it will have to be like this until the blister heals up somewhat – but that is fine, I am more than used to walking on my own; that’s the way I normally walk in the Lake District. 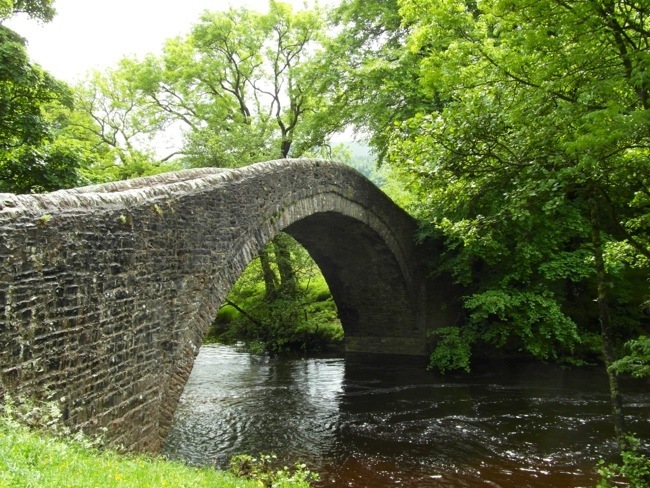 As I left the town, I crossed this lovely bridge. I then headed up past a large working quarry. 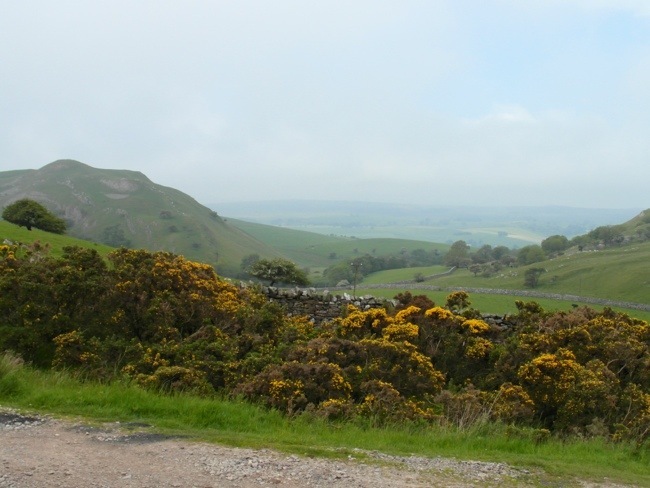 Once I was up above it, there were some lovely views back over the Cumbrian countryside. It was much windier today, and therefore considerably colder than the last few days. I was now coming into the moors. 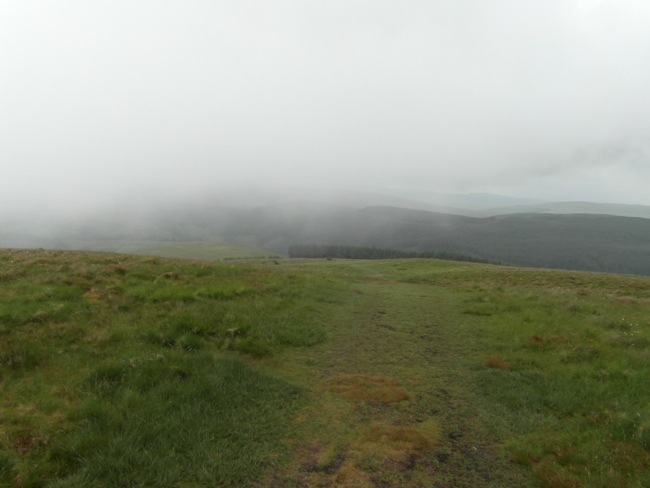 The cloud was hanging over the higher moors, which limited the view of what was to come. At least I knew that, so far, I was on the right track! I continued to climb and it wasn’t too long before I was in cloud. 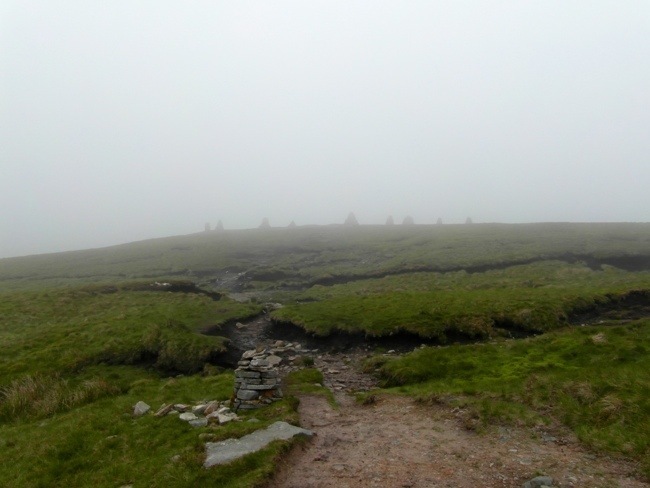 Then suddenly through the clouds there they were – the Nine Standards. Nobody seems to be absolutely sure why they were built. 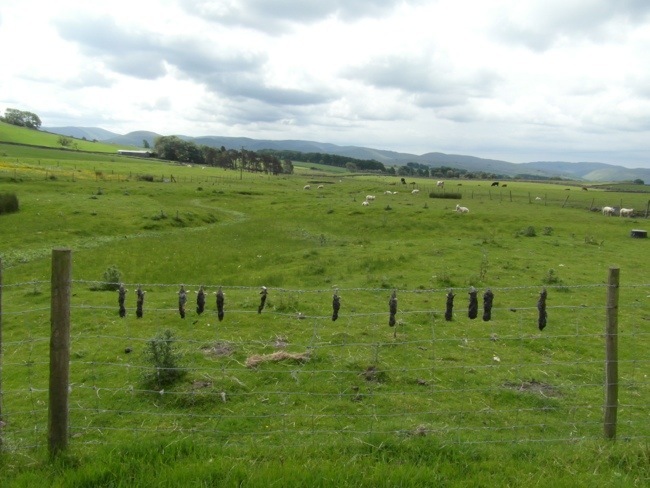 Some say that they were boundary markers, others say that they may have been decoys to worry the army of Bonny Prince Charlie. 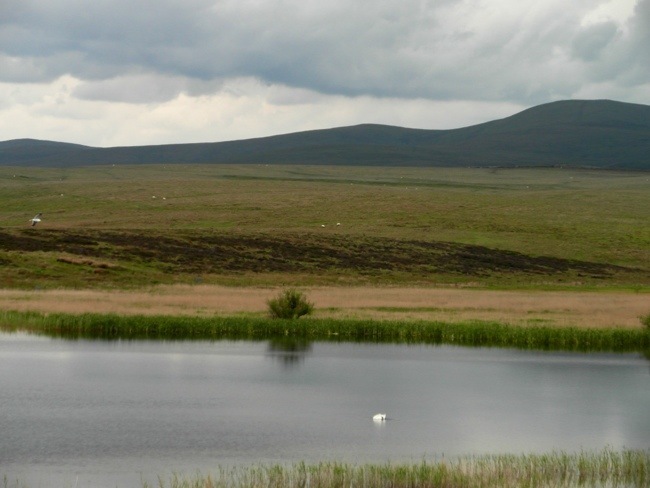 This was real peat bog country and great care was needed in places not to get a boot full of muddy water. I had one or two moments where I nearly came a cropper, but managed to escape the disaster of wet socks. I was wearing gaiters, and I guessed that must have helped. To be honest, it wasn’t as boggy as I had expected. I guess all the dry weather this year has helped. 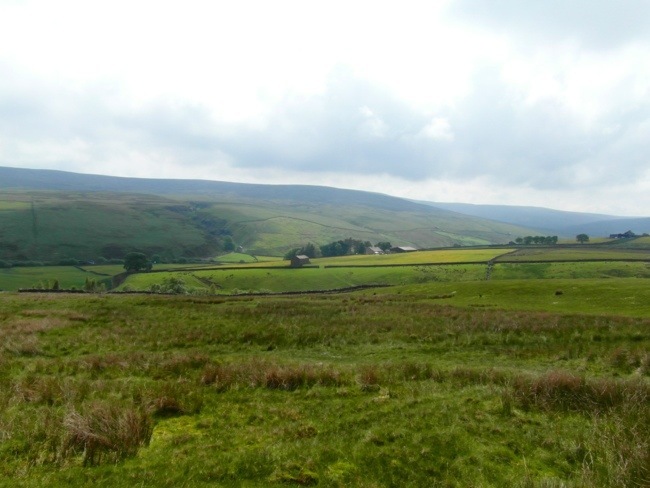 There are three different routes across this part of moors, the Red, the Blue and the Green. 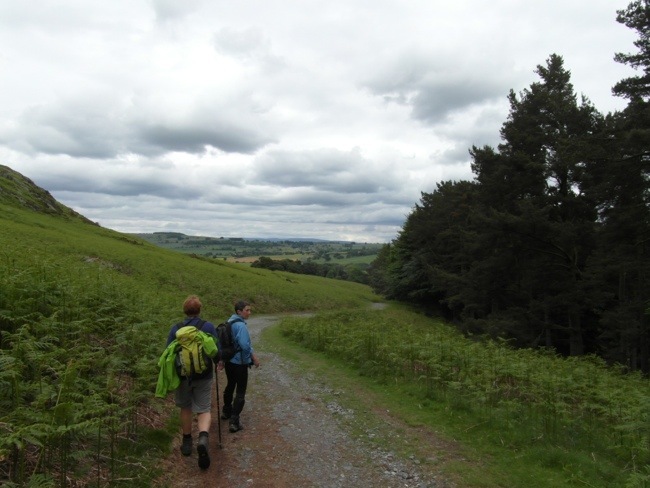 These are seasonal, and walkers are asked to follow the appropriate route for the season. This is to try and control the erosion caused by so much walker traffic. I, of course, was following the Red route. It was very confusing up here on the moors. I am convinced that without the GPS I would have got lost. I usually have a very good sense of direction, but up here everything looked so much the same. I knew I needed to head south, and I was heading south, but I felt somehow I had turned around. If I hadn't had the GPS I would have doubted myself and probably gone wrong. Gradually, I came down out of the cloud and the day began to brighten up. 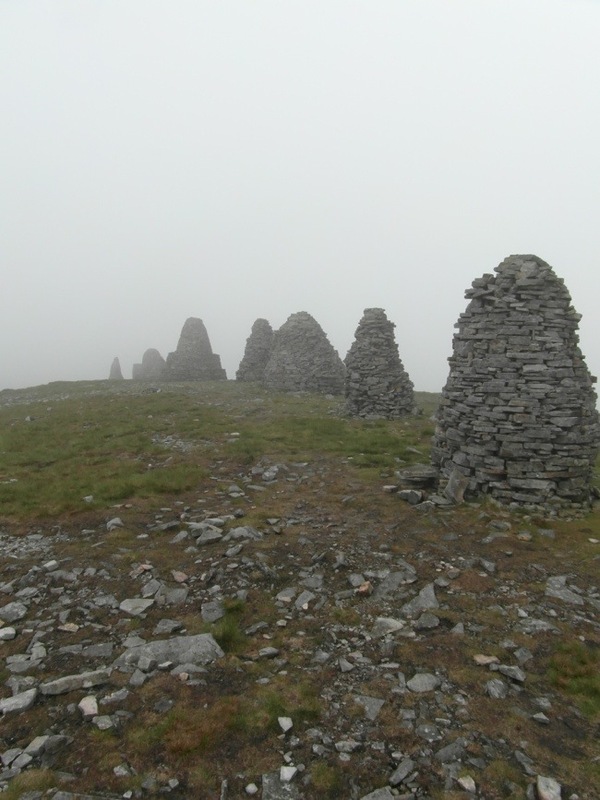 You can see my next destination up ahead – the cairn sticking up in the middle distance. You can see that the weather was clearing up nicely. It was around here that I was passed by a couple of Australians. They seemed to have been following the Green route, which joined up with my red route. We exchanged pleasantries, as they passed, but I let them pass quickly, I needed to keep going at my pace, not anyone elses. A little later I found a sheltered spot to stop for lunch. I was happily munching on my Mars bar, when a woman came around the wall from where I had just come from. I was surprised to see her, but not as surprised as she was to see me. At the top of her voice she shouted back to her friends (not yet in sight) “I came around the corner to have a wee, and there is a man sitting here having his lunch!” Soon her friends arrived too. They stopped to speak to me, and I soon realised that we had met them towards the end of yesterday’s walk into Kirkby Stephen. They had told us that they were doing the C2C in stages over a period of weeks. Yesterday, there were four of them, today there were only three. I didn’t ask what had happened to the fourth member. 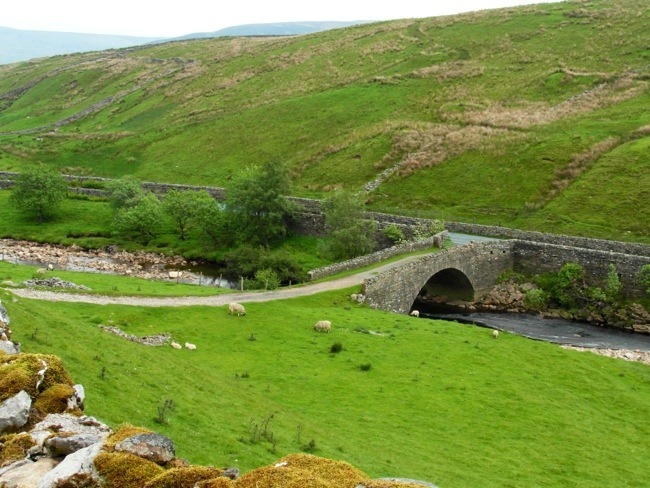 They too were heading to Keld, but intended to stop at the nearby farm for refreshments. 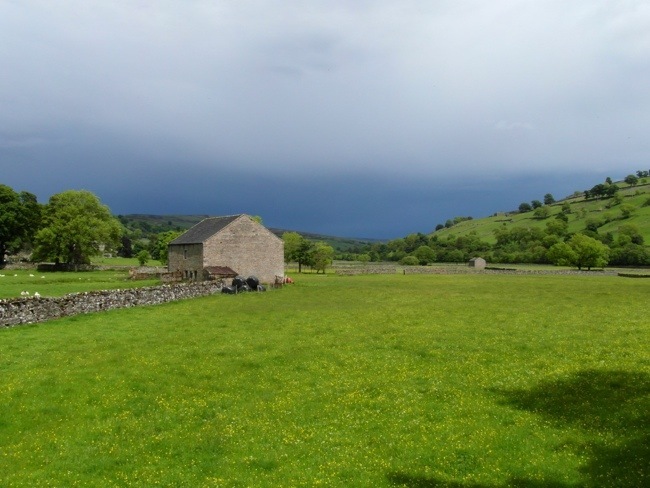 The farm in question was Ravenseat. It was a beautiful, but isolated place. 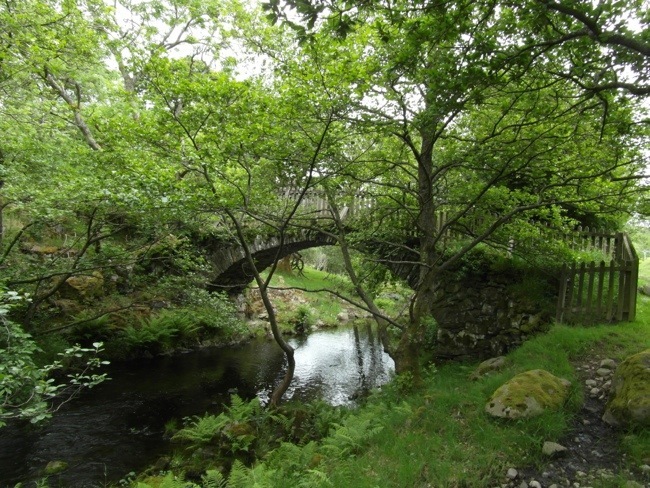 This lovely bridge marked the entrance to the farm. The three ladies I met earlier were there enjoying their refreshments. I pressed on, and though I still had to keep to my slower pace, I was determined not to be overtaken by three “senior” women. Male pride or what! 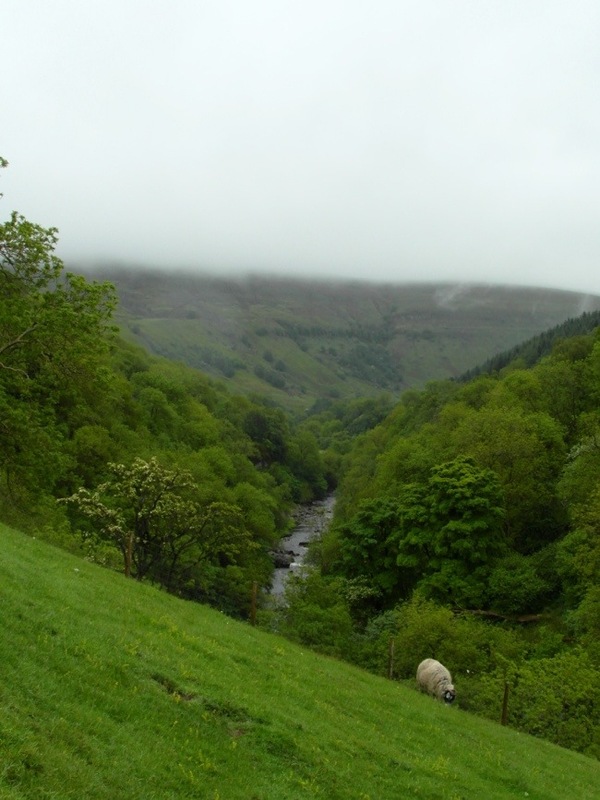 From the escarpment that followed, there was a lovely view down to Whitsundale Beck below. 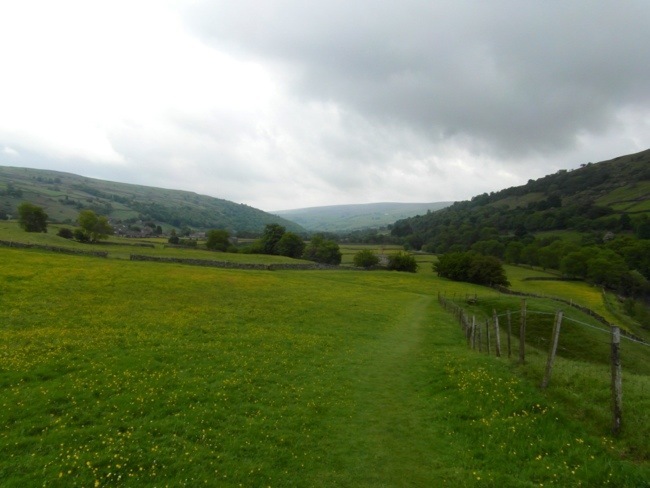 My first view of the beautiful Swaledale Valley, that is going to be such a feature of the next few days walking. 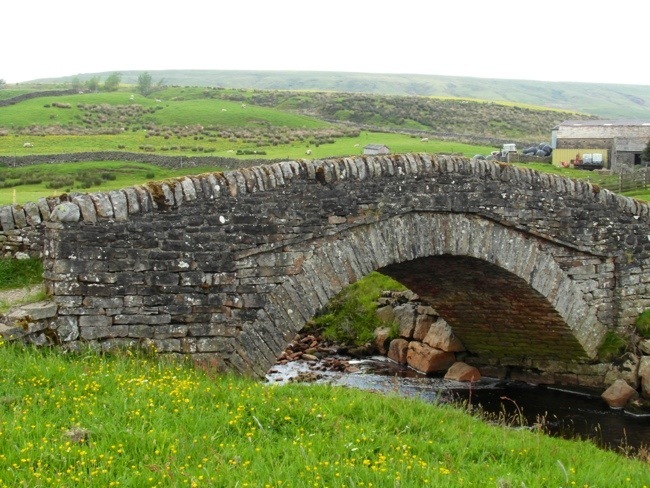 A lovely little bridge over the the river Swale. 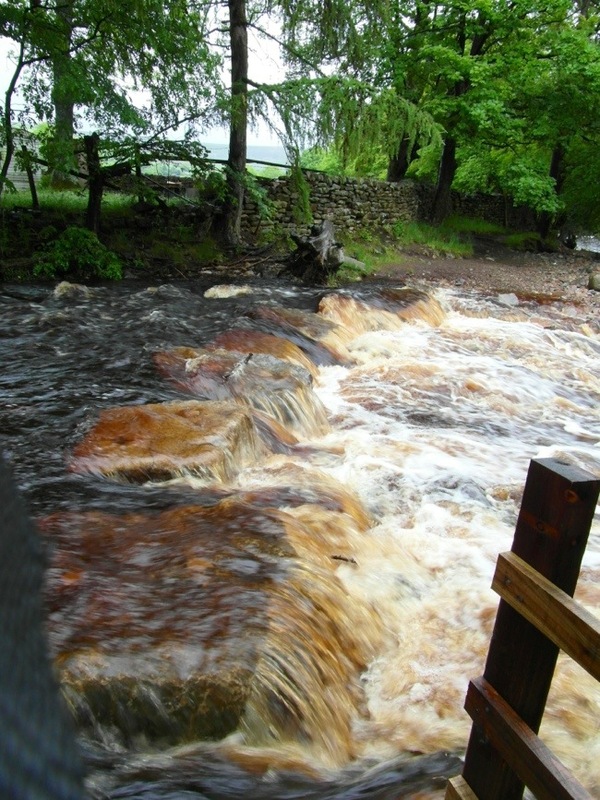 Wain Wath Force. Again, the lack of water was very evident. 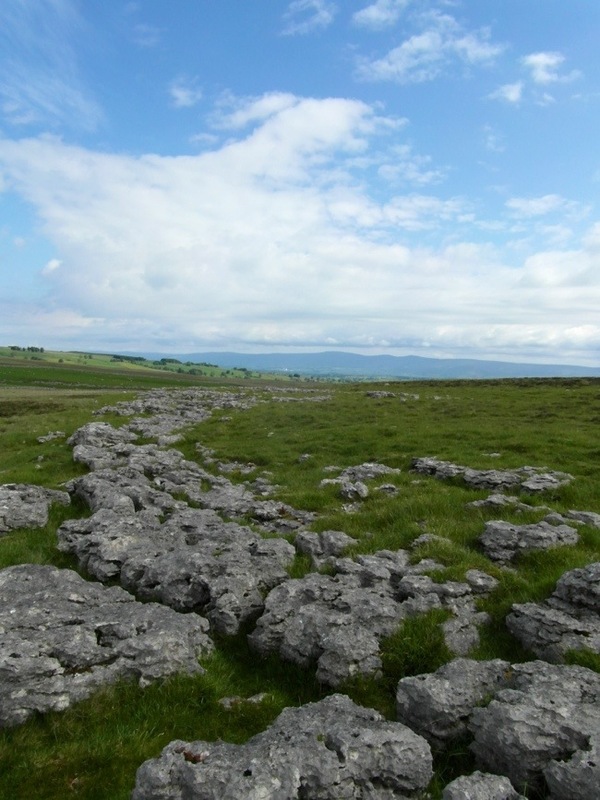 It seems that even Yorkshire is suffering from the drought. 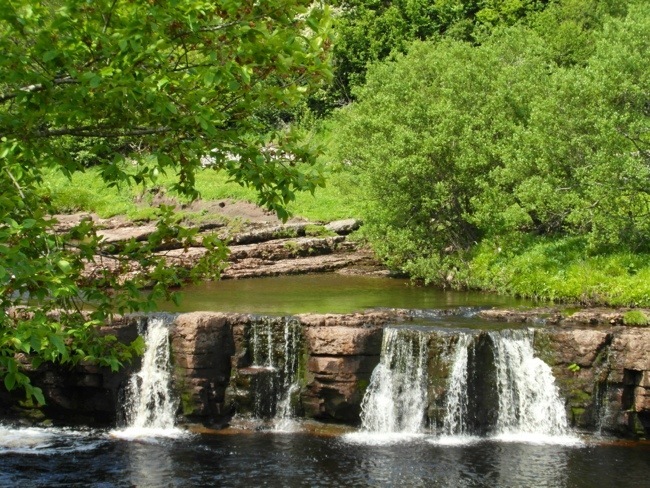 And finally the lovely little hamlet of Keld. The HALFWAY POINT in my walk across England! Up until now all the rivers I have passed have flowed in a generally western direction, from now on they will be flowing east. I am staying at the Keld Lodge, which is a really lovely place. All the places I have stayed have been very good, but there is something special about this place. It has, of course, a beautiful view, but also a really friendly ambience. 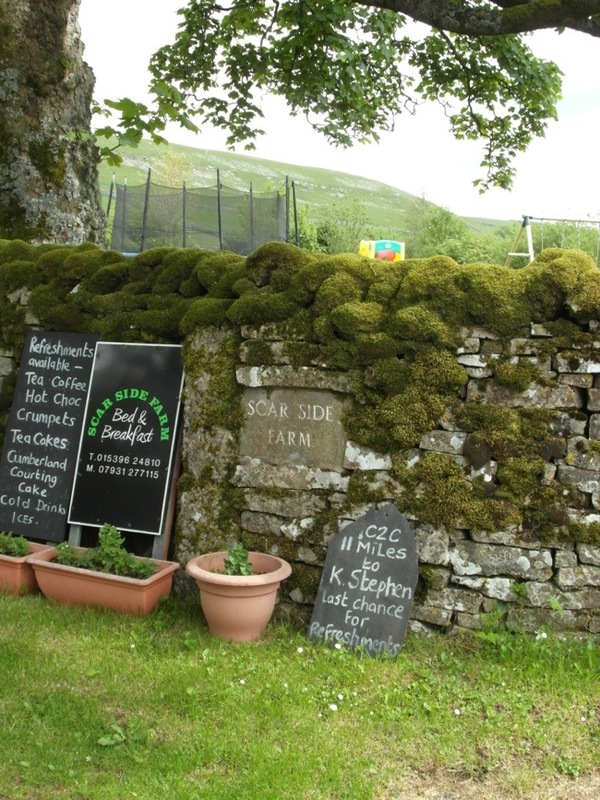 It is also the only place with a licence to sell alcohol, so it was a gathering place for most people staying in Keld and, therefore had a lovely atmosphere. It also has a lovely restaurant, and as I write this I have enjoyed a lovely meal and am now finishing off a lovely pint of cider. When I arrived in the bar I met a couple who were staying at the same B&B as me in Shap. They were called Perry and Angie, a really lovely couple, and we had a good chat. You may remember that that was the day I also encountered Dutch Mat for the the third time. Perry told me that Matt had nearly missed his bus to Penrith. He had had to chase after it, and it had stopped in the middle of the road and caused a major traffic incident, holding up the traffic. As you can perhaps tell, my mood has lifted since last night. I know that I will now have to be extra careful about my blister, and go slower than perhaps I normally would, but today has proved that that shouldn’t be a problem. If I take things at my own pace I should be OK. The only downer is that rain is forecast for tomorrow, so it looks like the waterproofs will be out for the first time since Day Two. I woke up to find the expected dark clouds, strong winds and driving rain. It looked like it was set to stay for the whole day. At breakfast I saw Perry and Angie, and also Sandra and Mick, whom I had first met back in Patterdale. 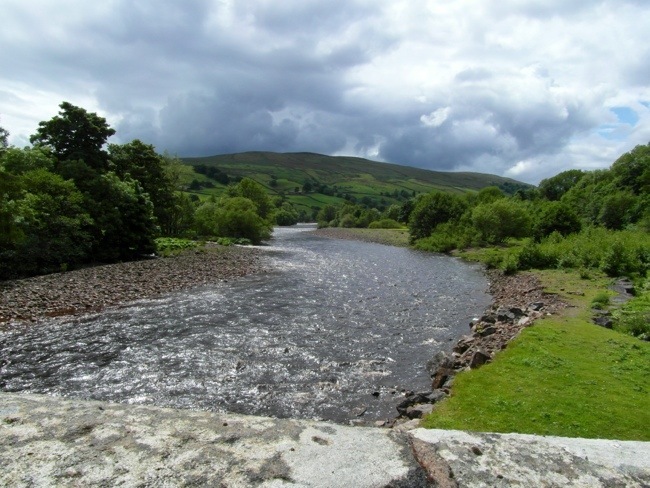 Everyone agreed that the best route to take would be the lower level alternative that follows the course of the river Swale. 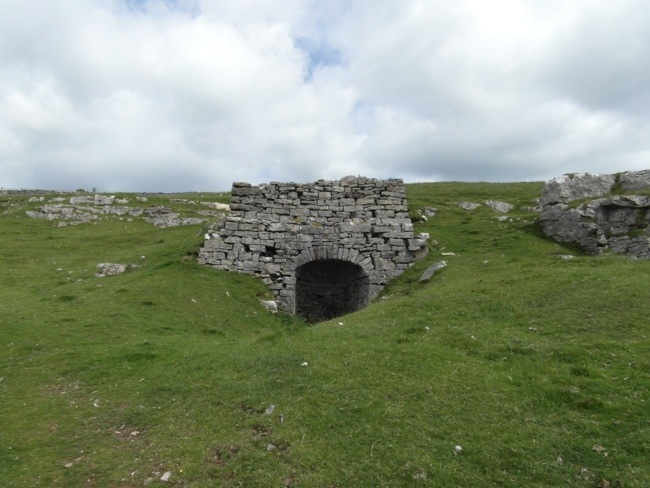 Wainwright always recommended the higher level route because along the way you had the opportunity to see and explore the ruins of various buildings connected with the mining industries that in previous centuries had so dominated this part of the Dales. 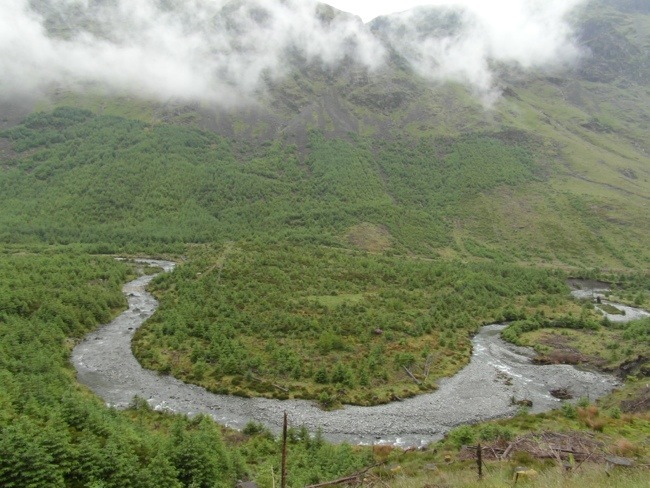 Even without the bad weather it had been my intention to take the lower path, as following the course of this beautiful river held more appeal to me than exploring the mine workings of a bygone age. 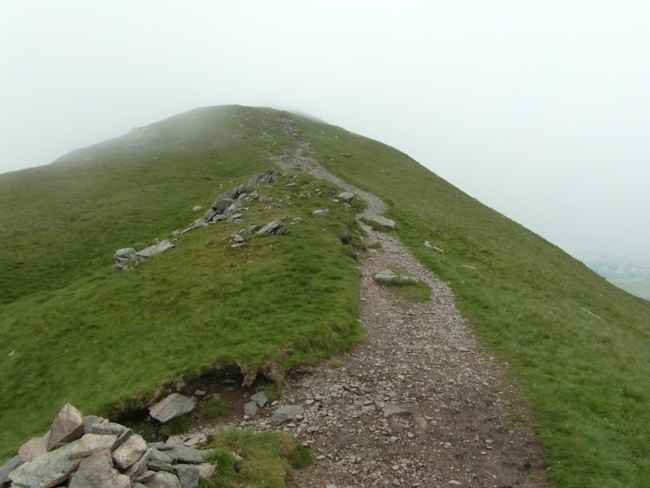 Also, with my blister still very much on my mind, I considered that the lower path would be the best option. 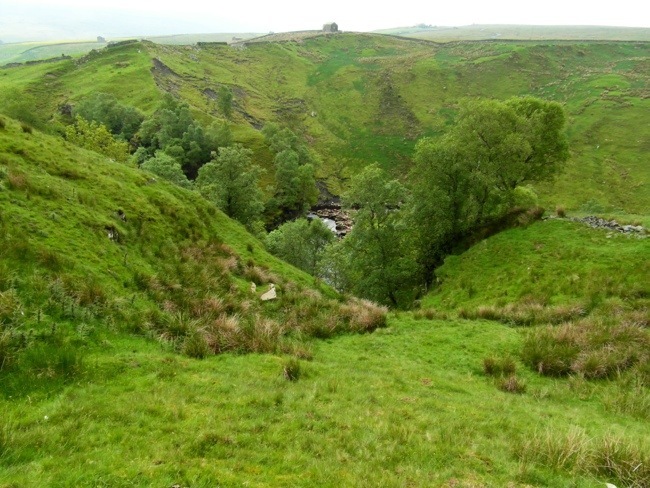 As I left Keld for the footpath down to the river, I met an American couple (whom I later discovered were called Scot and Fran, from Houston, Texas. We all stopped to admire a little flock of swallows that were swooping in and out among a group of sheep. The swallows were diving in between the sheep, catching midges as they went. I wish there had been some swallows back on Day Two to catch the midges that bit be nearly half to death! A little later on I came to a beautiful waterfall. 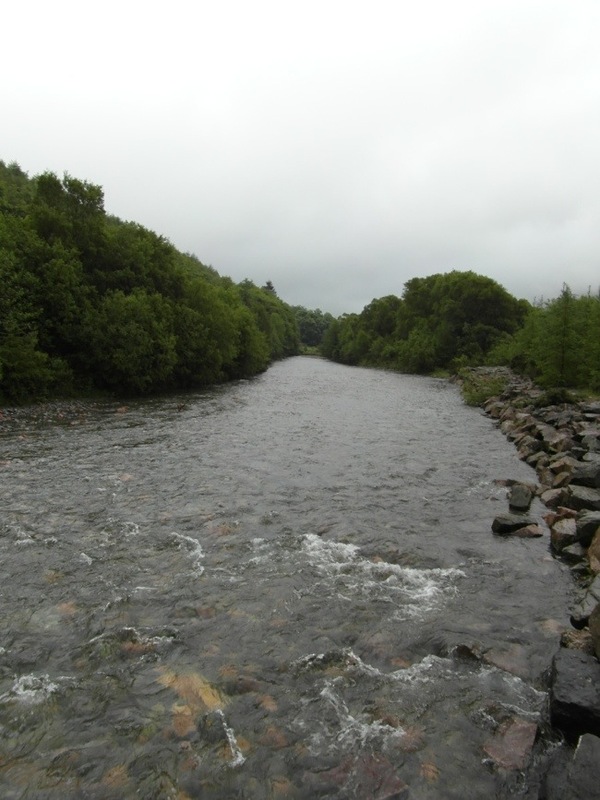 The overnight rain certainly seemed to have made a difference to the flow of the river. 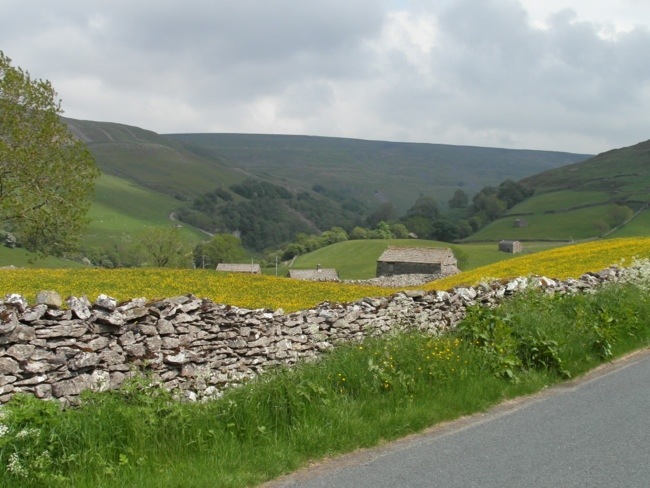 The beautiful Swaledale valley. You can see how low the cloud was. 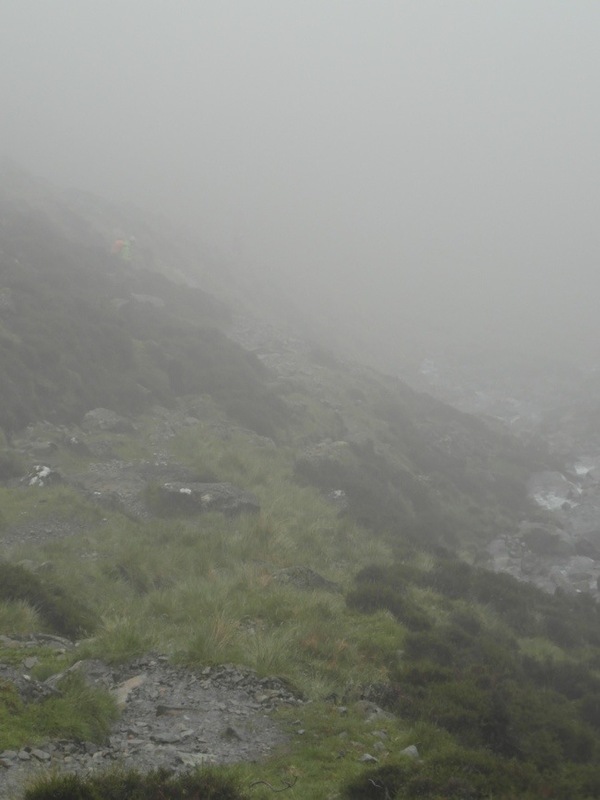 Visibility on the high level route would have been poor. 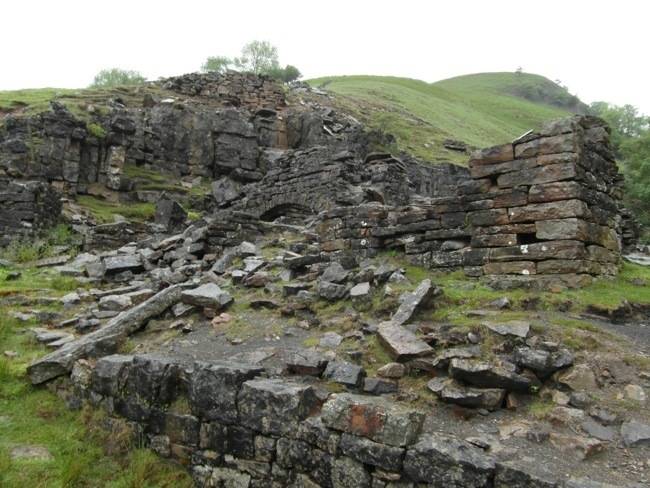 Evidence of the mining industry that used to dominate this valley. You can see that the day was brightening up a little. Osyter Catchers. I was surprised to see the coastal waders here. You can hardly get more inland than this! 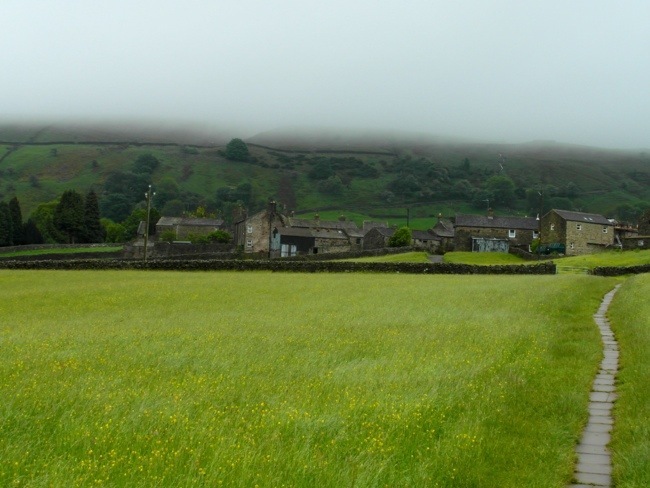 I decided to make a little detour across to the other side of the river to visit this thriving little village of Muker. Despite its name, it is a pretty little place. 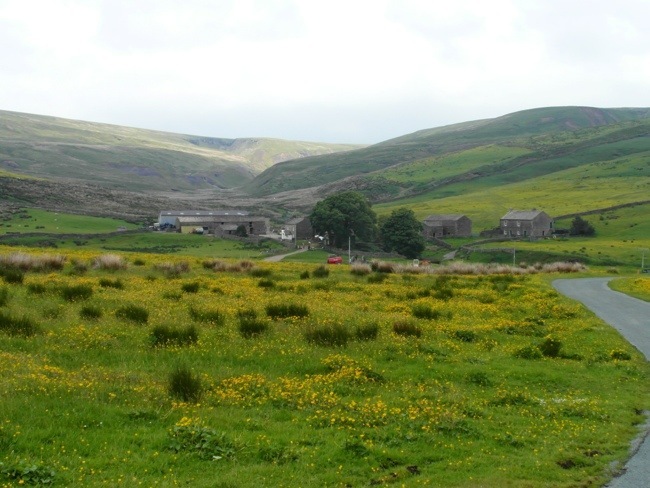 After the collaspe of the mining industry, it reestablished itself as a centre for the Swaledale woollen industry. 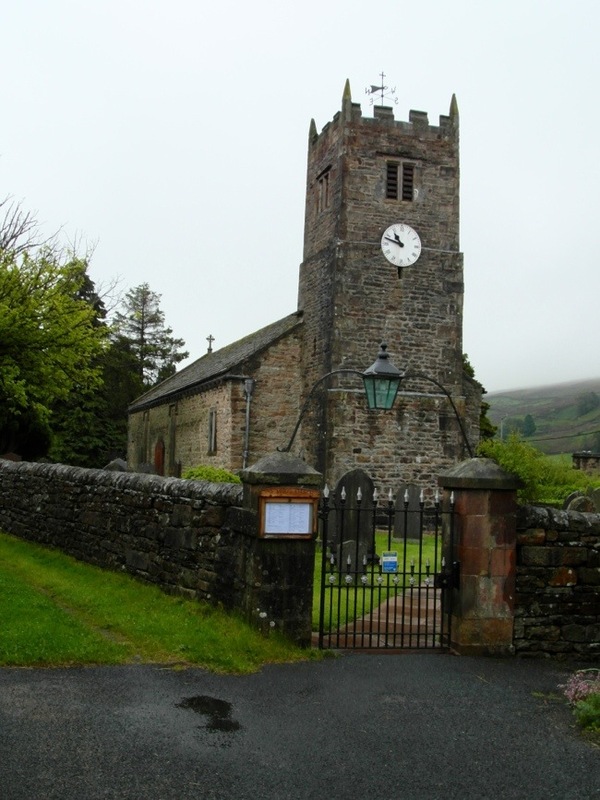 The lovely little church at Muker. As I prepared to cross the river back to the path, you can see that the sun was now shining. The day was turning out better than expected. 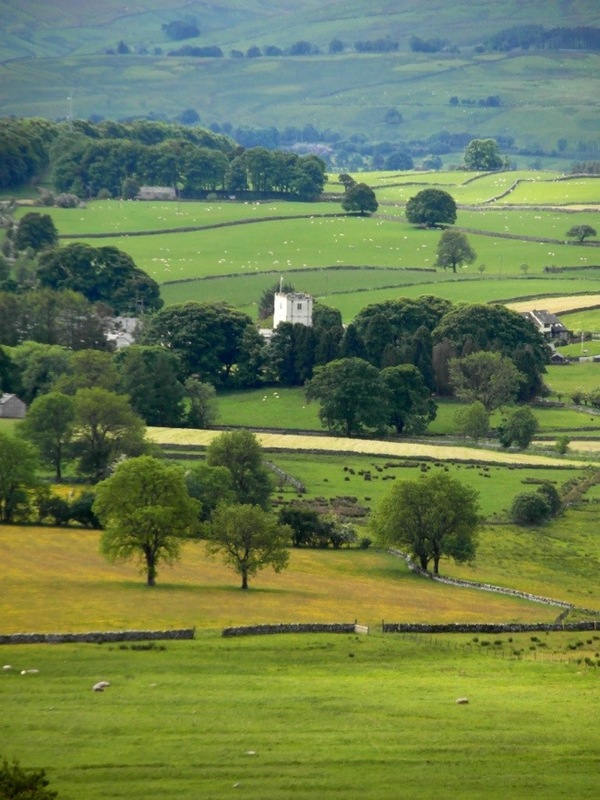 The view across to Muker from the other side of the river. 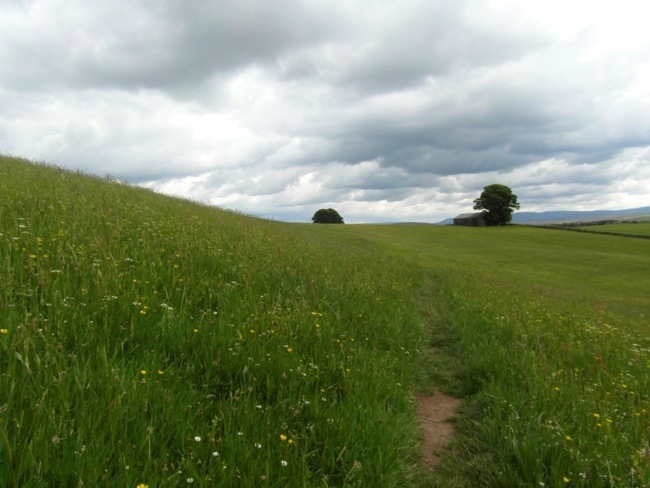 The path took me through beautiful meadows very close the the river’s edge. In one meadow I came across this sheep and her two lambs. They were running around in a way that sheep usually do only when being chased. They seemed very alert and flighty, but I couldn’t see any reason why. Have a close look at the adult sheep. She either has a serious moulting problem, or seems to have escaped from the farmer in the middle of being sheared! As I passed by I heard a whistle and turned round and there was the farmer with his sheep dog. The escapees had been tracked down! 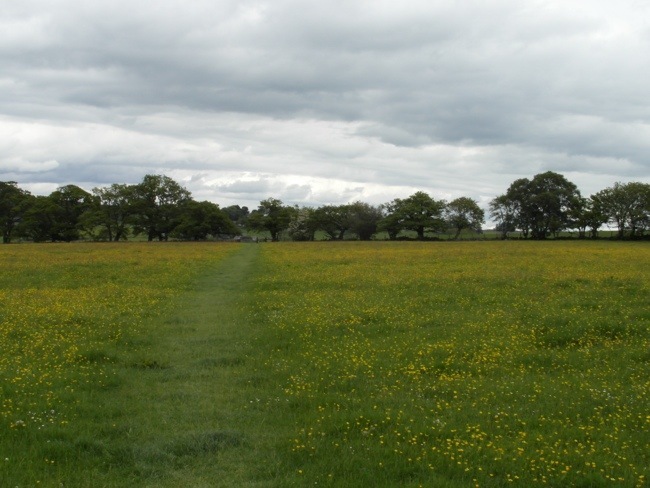 One of the joys of today’s walk was the beautiful meadows full of wild flowers. It wasn’t just the yellow buttercups, there were many other little flowers which don’t show up on the photo. It was certainly the right time of year to do this walk. 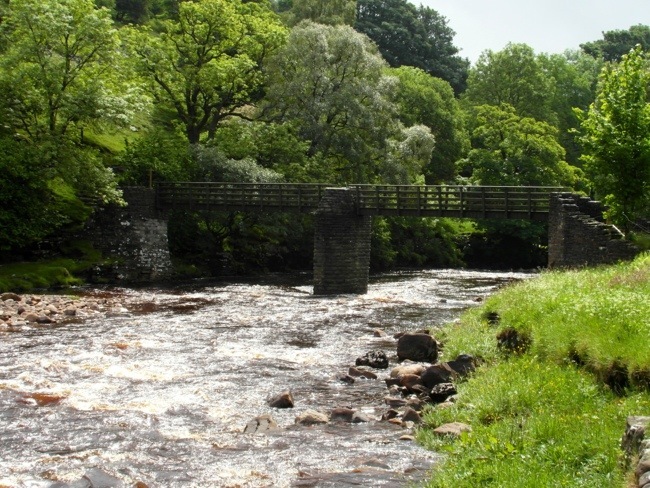 After a long walk along the river bank I came to the hamlet of Gunnerside. I had been told that there was a good cafe here, and so, as I was taking my time, I decided to treat myself to a nice lunch. When I arrived I found that Mick and Sandra and Cliff and Fran were already settled there, together with serval other C2Cers I didn’t know. I had a lovely bowl of soup, and beautiful cup of tea and to finish off, a delicious piece of lemon cake. Conversation got round to blisters, and it turned out that Fran had a couple too. I recalled seeing them in the chemist in Kirkby Stephen yesterday. Fran very kindly offered me some pain-killers to take the edge off the pain. I can’t pretend that my blister isn’t painful to walk on, because it is, but it is bearable. After lunch I set off, but it was now raining relatively solidly. As I returned to the path, I had an encounter with cows. 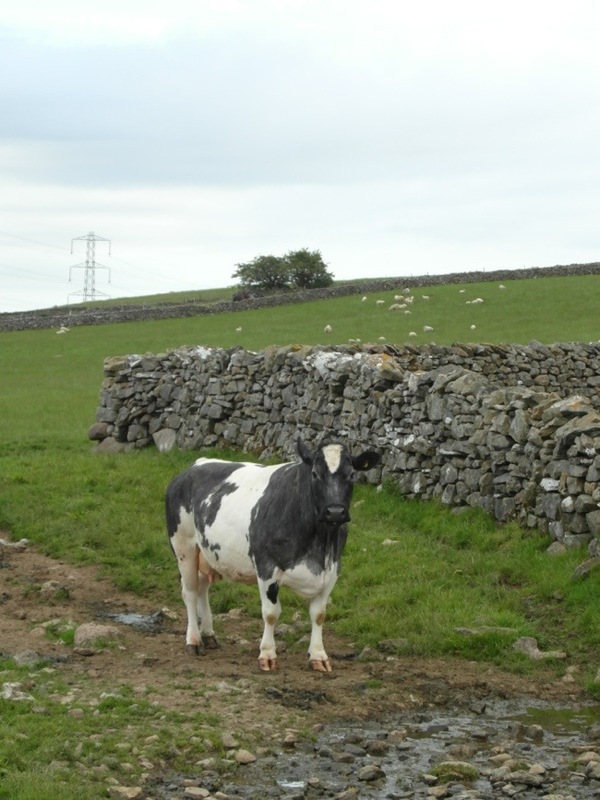 As I got to a stone stile I could see a huge cow standing with its head right through the stile where I needed to go. It looked at me and I looked at it. I thought to myself, what am I going to do now. Fortunately the weather came to my aid. The rain started to come down very heavy and the cow didn’t like it. It ran across the field and joined the others. “Good”‘ I thought. But before I could start across the field the whole herd went running round the field, right towards the stile where I needed to exit the field! I thought about trying to outrun them, but realised I wouldn’t make it. 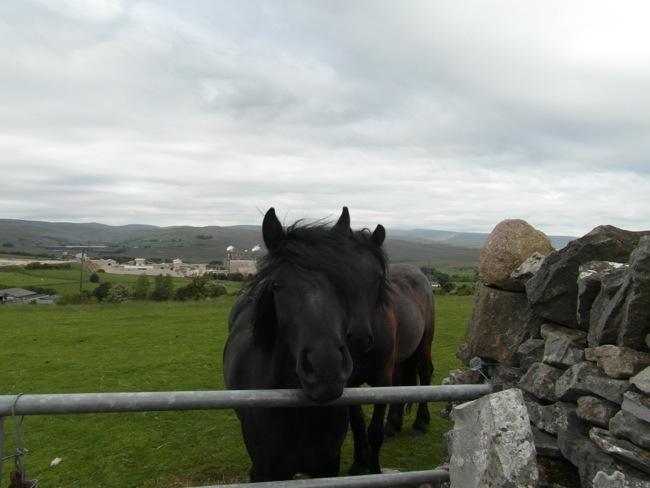 Fortunately, they stopped just past the stile, so I was able to gingerly sneak past them. I was never so glad as to get out of a field in my life. You can see that the sun had come out again. The dark clouds were from the storm that had passed over. (above) Here I had to walk along this wall that formed part of the flood defences. The photo doesn’t show how high it was. Care was needed as it was slippery. More dark clouds coming in, time to put the waterproofs back on. There was no way “jump nimbly” here! In fact, trying to cross would have been dangerous. The stones were large but uneven and the water was running over them deep and fast. 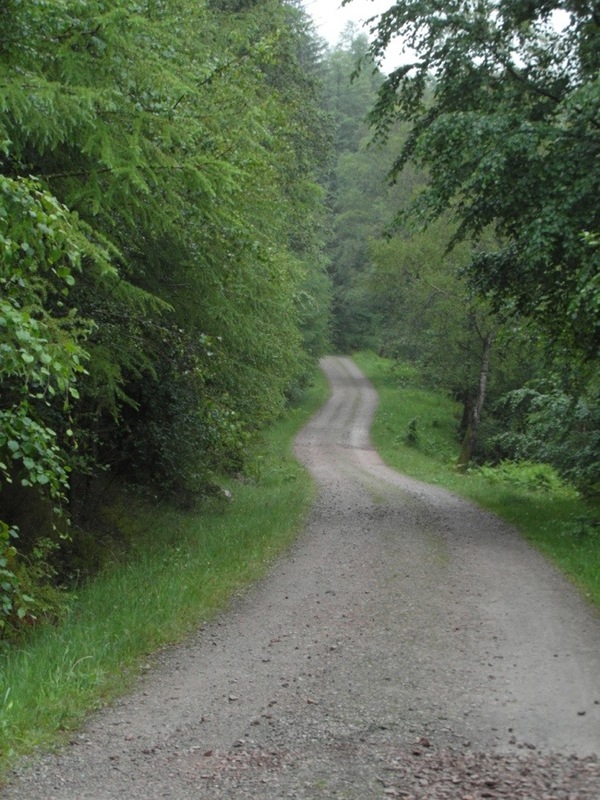 I decided that discretion was the better part of valour and turned back to the road. Once there I met Fran and Scott. I warned them of the situation and they followed me along the road until we were able to rejoin the river further on. 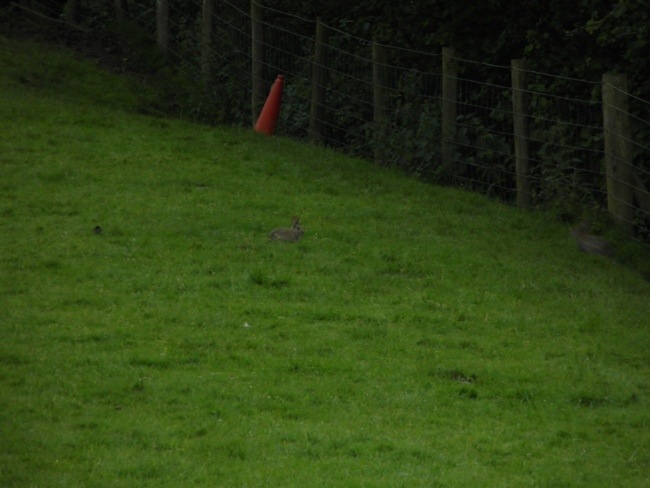 I had been seeing rabbits all day, but they were so quick that they were gone before I had the camera out. 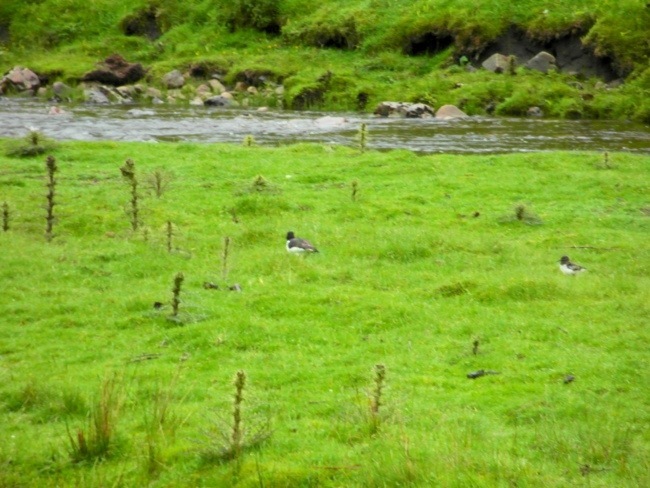 But in this field there were about a dozen, so I was finally able to shoot one…not literally, of course. 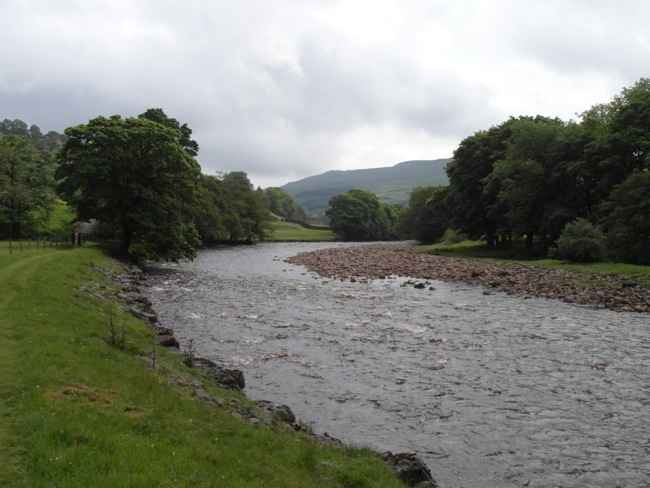 A few more miles brought me into Reeth. My feet and legs were protesting “Shaun, why are you making us walk all these miles each day?” “Just keep going”, I silently said to them.